The holiday season is now fully upon us. 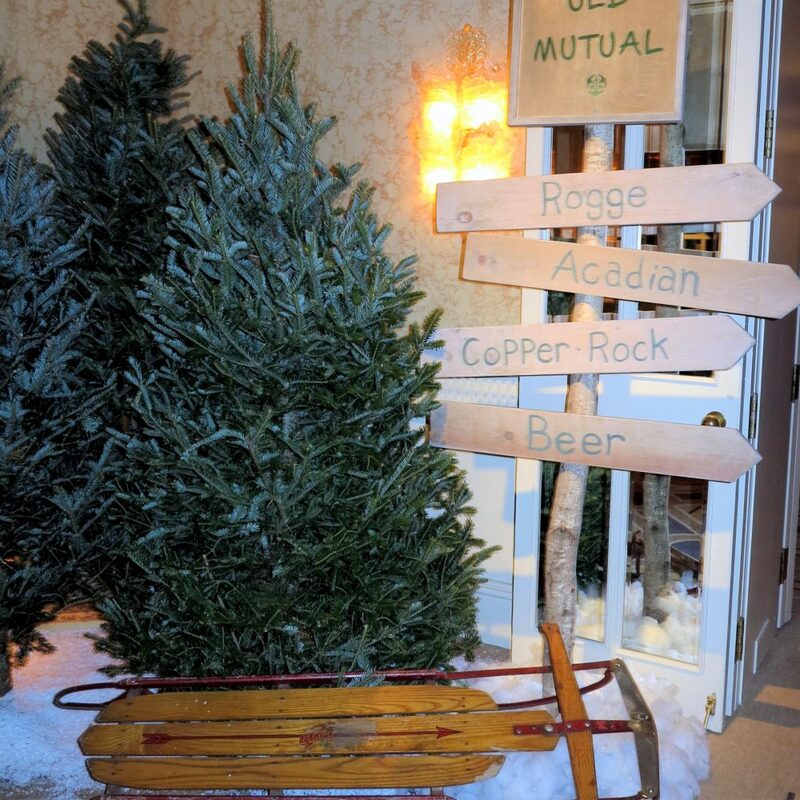 The time of year we want to enjoy with our family and friends and celebrate all the wonderfulness of the season. 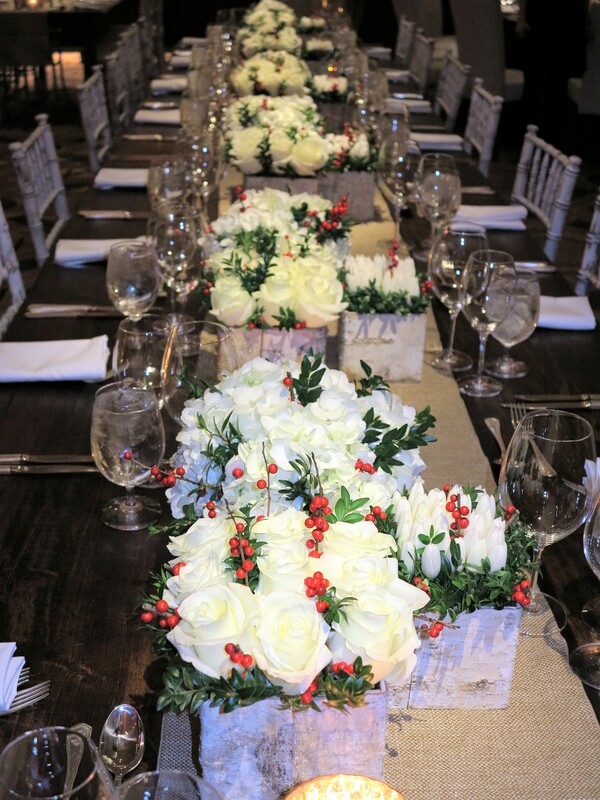 Creating that warm holiday spirit in our home and some festive cheer to our holiday parties is the part of the season we really enjoy. 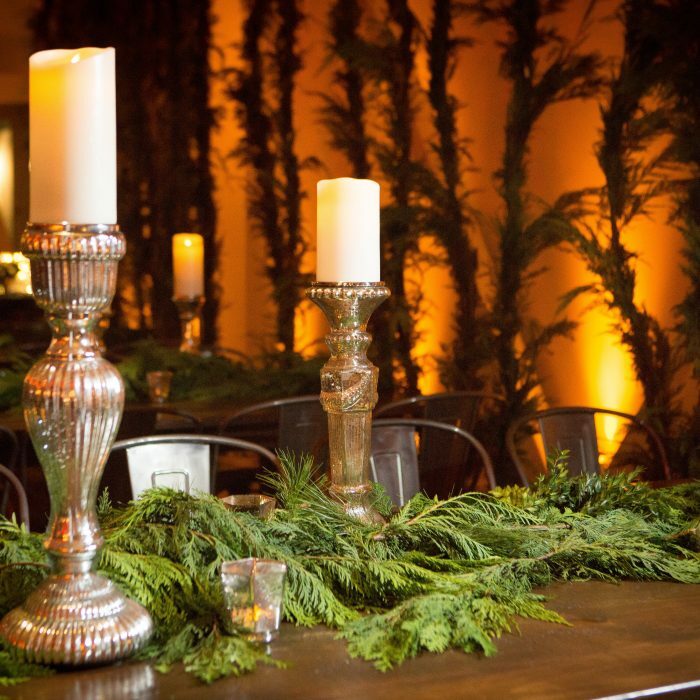 Whether your style runs more on the traditional side or you love the streamlined look of modern design, these tips and tricks will add some holiday cheer to your home and help you entertain in style the whole season long. 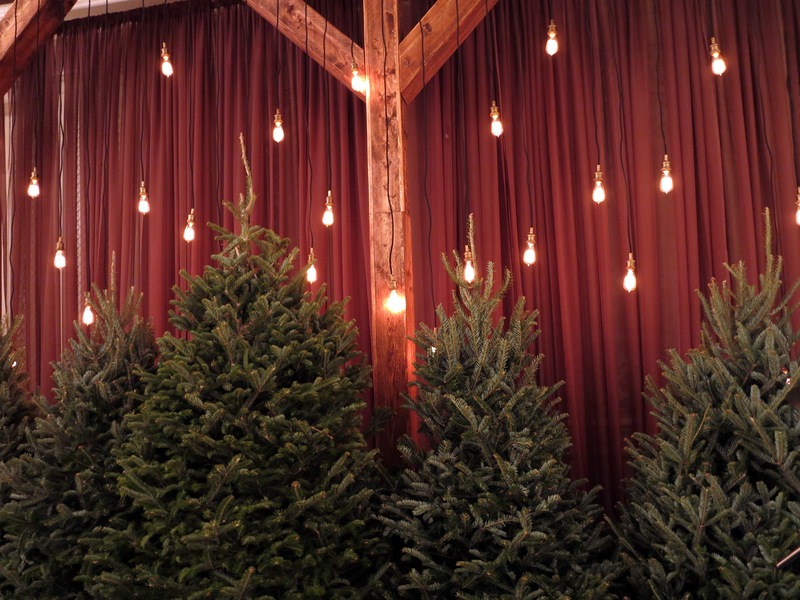 Though we love a traditional New England style trimmed Christmas tree, we have had some fun creating whimsical looks such as hanging trees upside down for a dramatic style that sparked more than a few conversations. 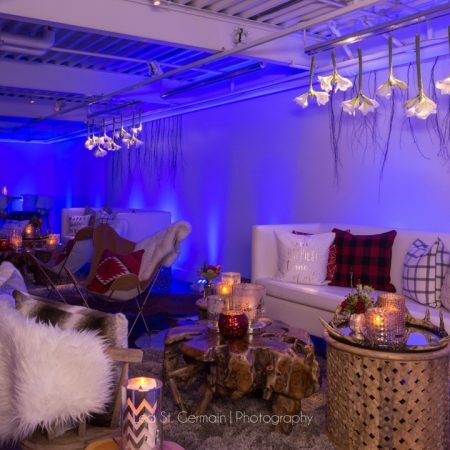 We love the simplicity of classic white lights as well as the fun of just using multi-colored lights-no additional décor needed! 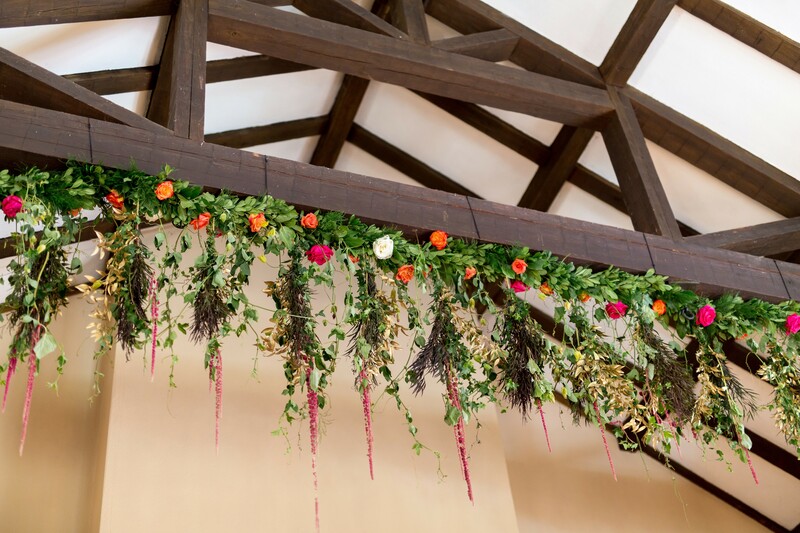 From fresh greens mixed in with some artificial ones, you can create a dramatic look for your mantel, staircases, shelves, doorways, or even suspend from your ceiling. Cut fresh from your yard, purchase yards from your local nursery or bunches from your flower shops, there are so many colors and options to choose from. Add some branches and berries to customize your look. 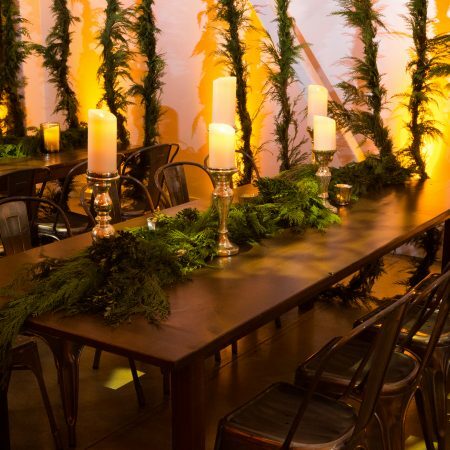 Integrate different types of greens to your garland and even your Christmas tree to add fullness and texture. 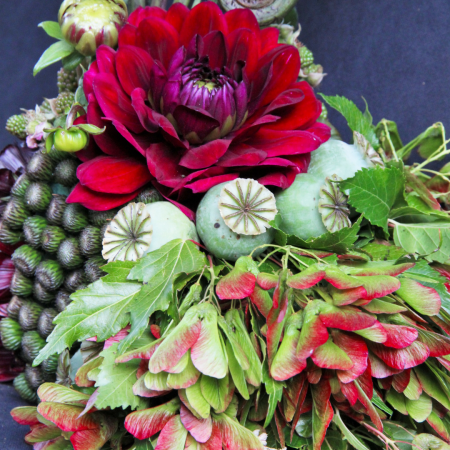 Include some feathers, pinecones, branches and bunches of berries for interest and color to your arrangements and displays. Ribbons and even beads will weave in more subtle color and a unique style to your décor. Pile on the cozy blankets and pillows for creating that cozy and relaxing feel around your home. 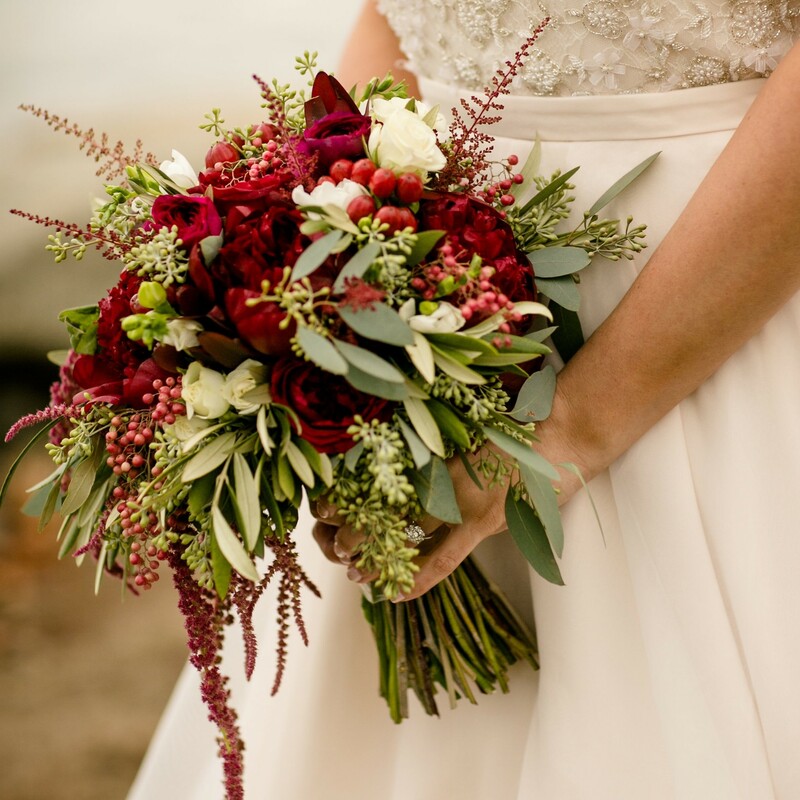 We love the look of pairing unique colors with those traditional holiday colors of green, red, white, silver and gold. Mixing in black and blue or some pops of pink or lime green will help you to create a distinctive look. 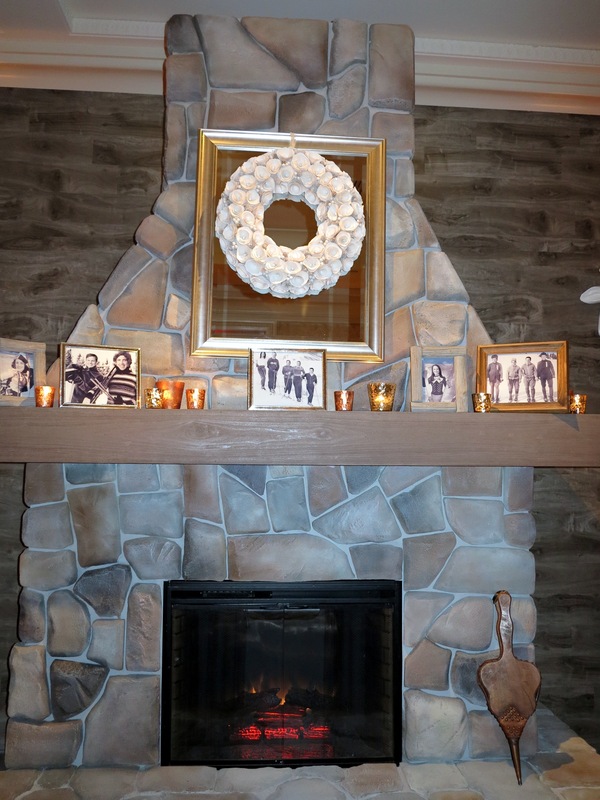 Displaying what you love is what a home is all about. Use your existing décor by adding festive touches-bowls of ornaments, ribbons and festive greens add a little cheer to our everyday pieces. 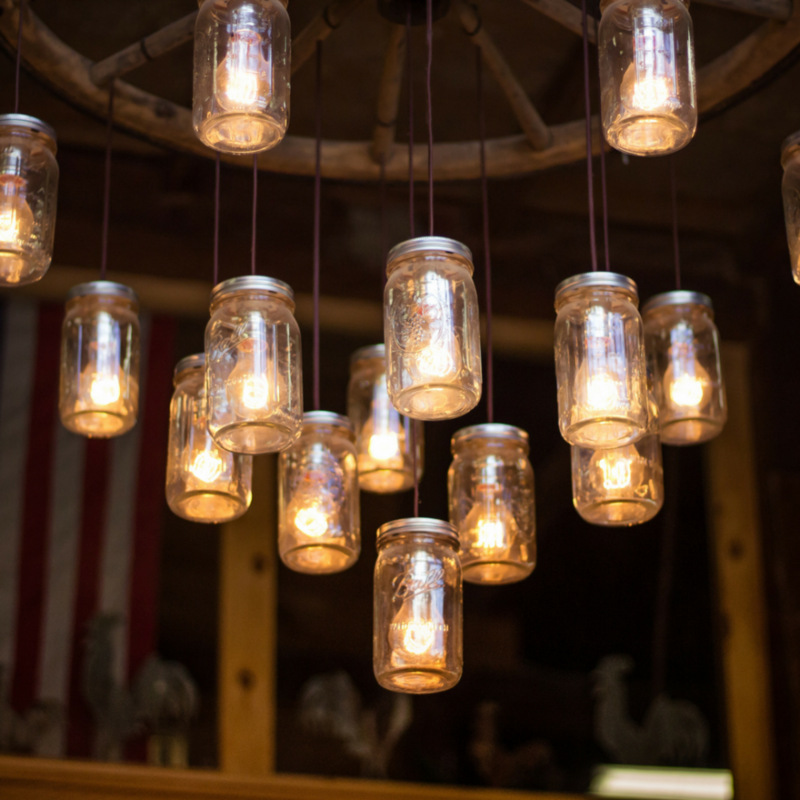 Battery operated candles and lights make it easier than ever to light up those long dark days of winter. 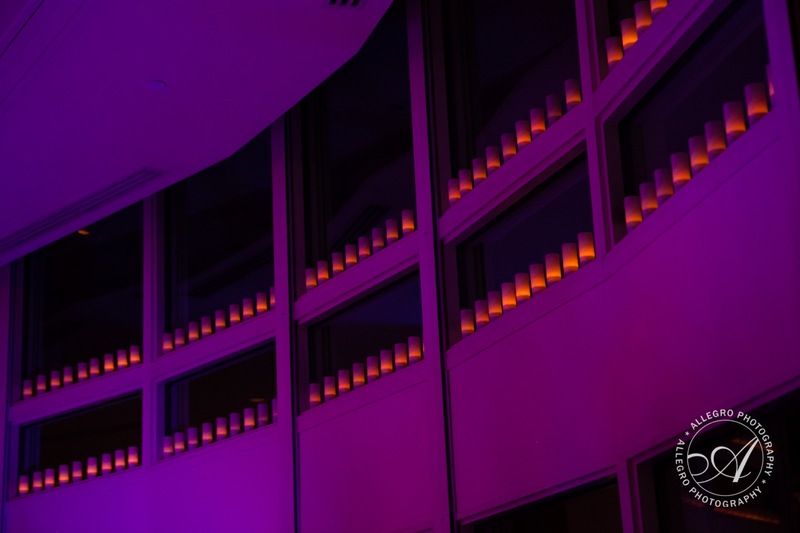 Window candles on timers, real wax battery operated pillar candles in hurricanes lining halls and stairs will shed that extra light needed during those long winter nights and keep that holiday spirit alive. 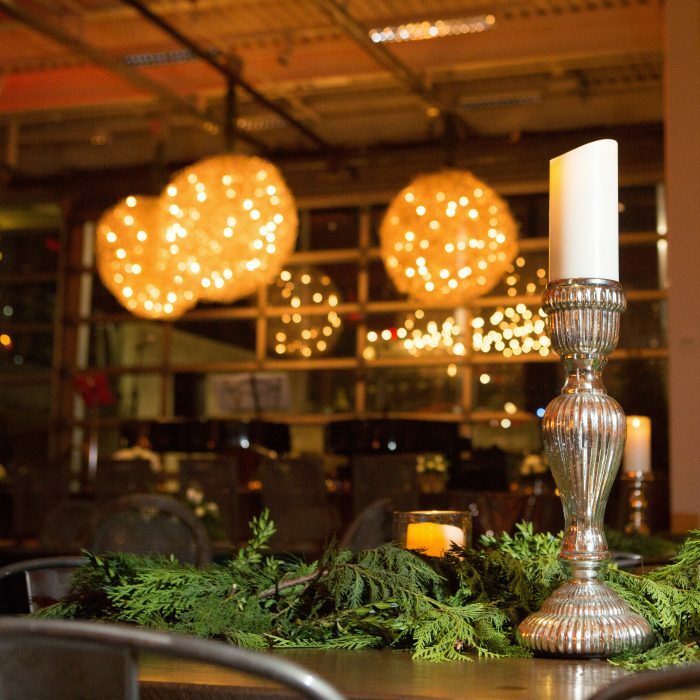 We love all of the battery-operated string lights-so easy to highlight all the décor!! 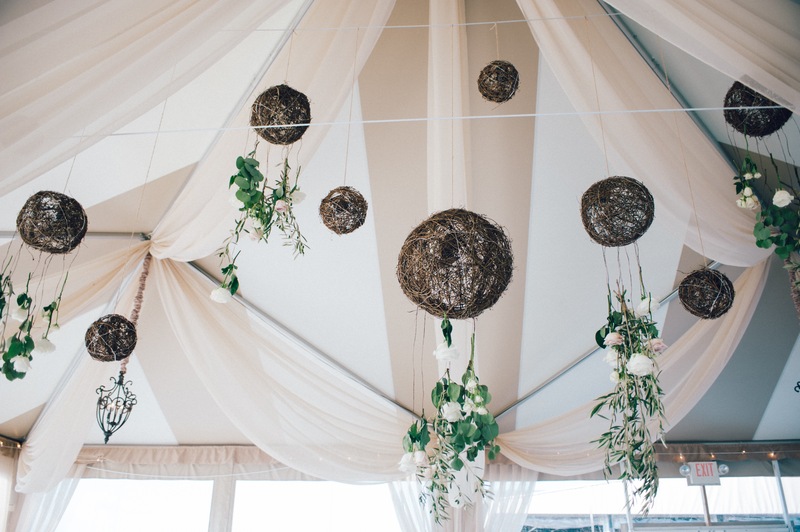 Minimal Madness-How to create a minimalist style wedding without looking sparse. 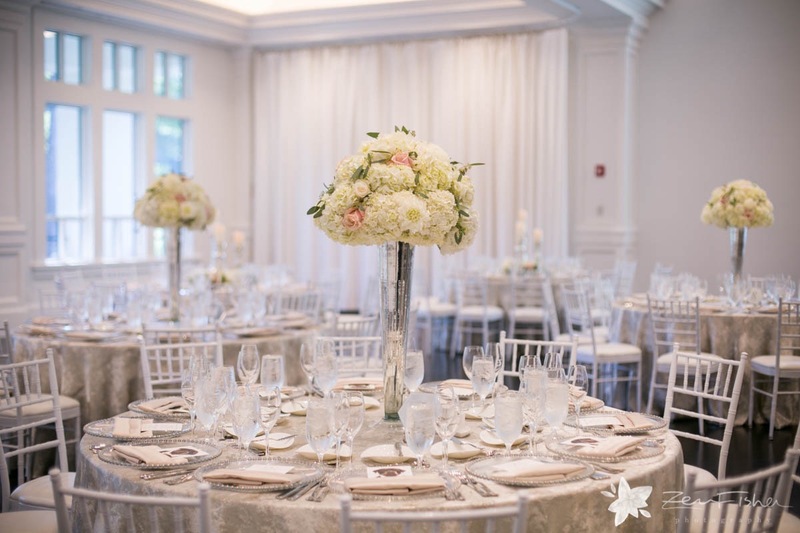 Wedding style trends come and go but one style that we think is always in fashion is the clean classic look of a minimalistic wedding design. 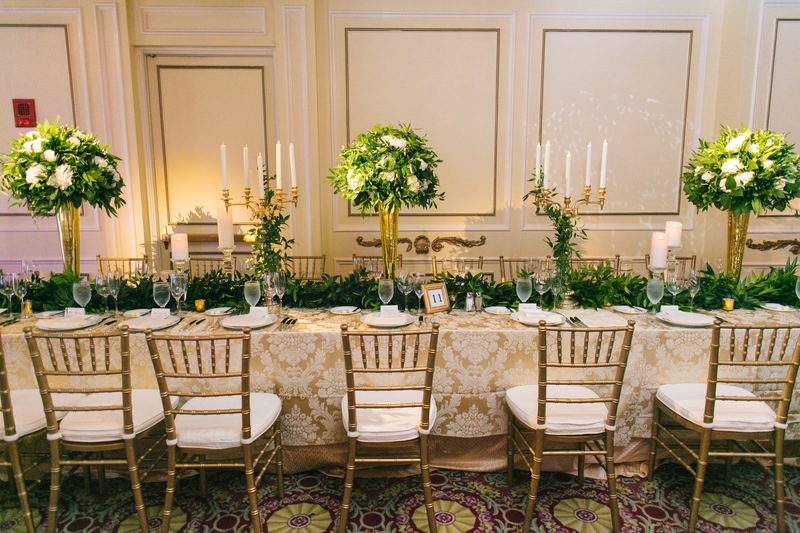 When we discuss this direction with our clients, we are not talking about designing with small sparse arrangements for their big day. 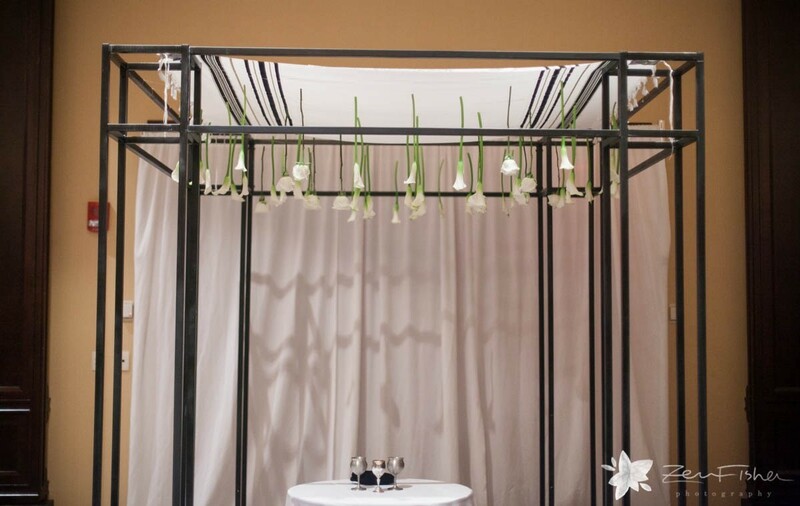 Minimalism to us means fine tuning all the details of design; from the use of repetition to the use of strong bold flowers and greens. 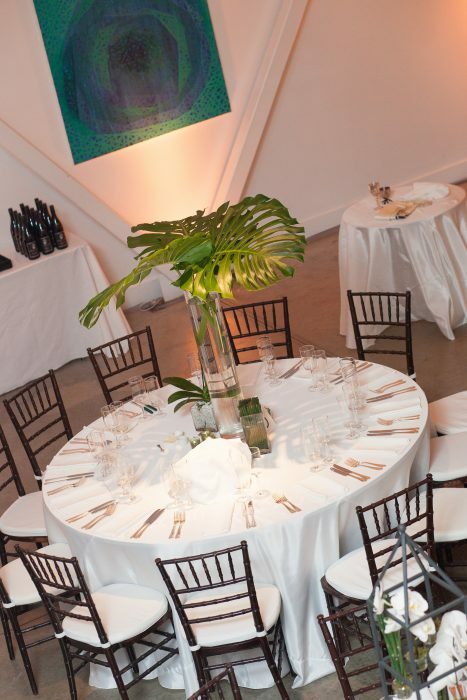 We create a minimal look without looking sparse by focusing on a few important design elements. 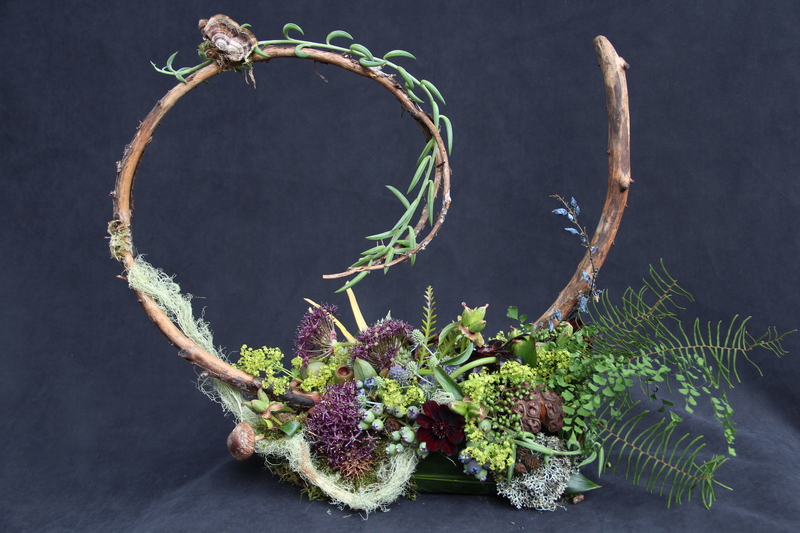 Use the shape of florals and foliage to create a dramatic design. 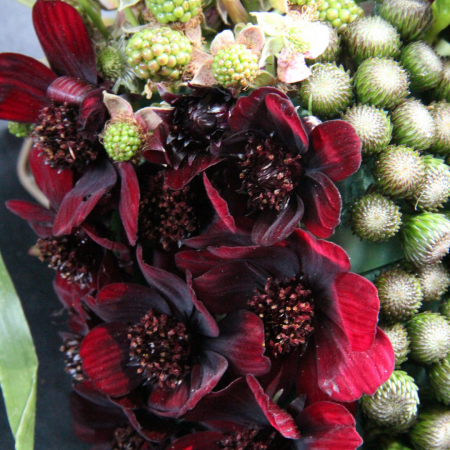 Composite arrangements, the use of one like bloom grouped together, will create an impressive design effect. Simple and elegant, yet makes an incredibly bold statement. Bring the outside in. 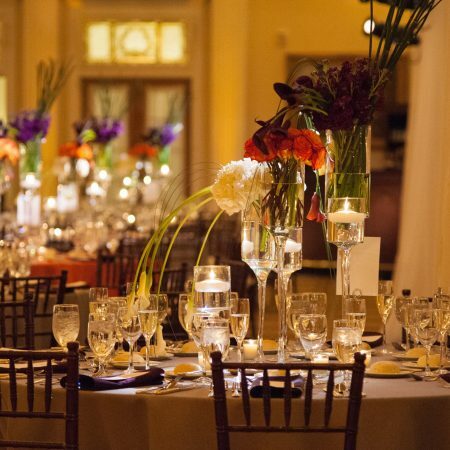 Make your guest feel as though they’re not in a typical ballroom. 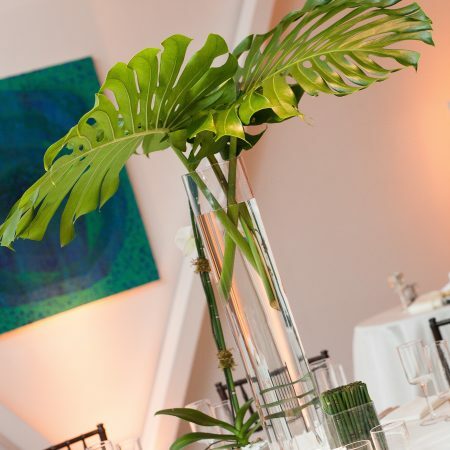 Natural elements add interesting shapes, textures, and color as well as adding another dimension to the design. 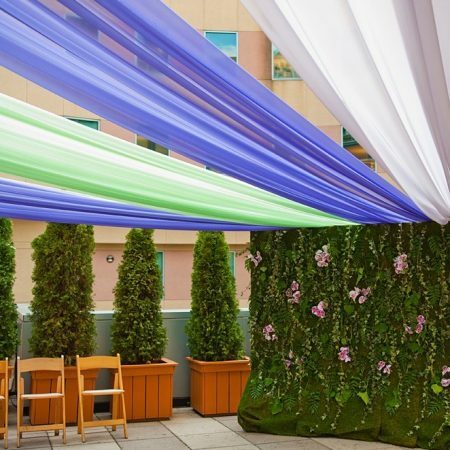 It has a balancing effect and aids in unifying the decor. 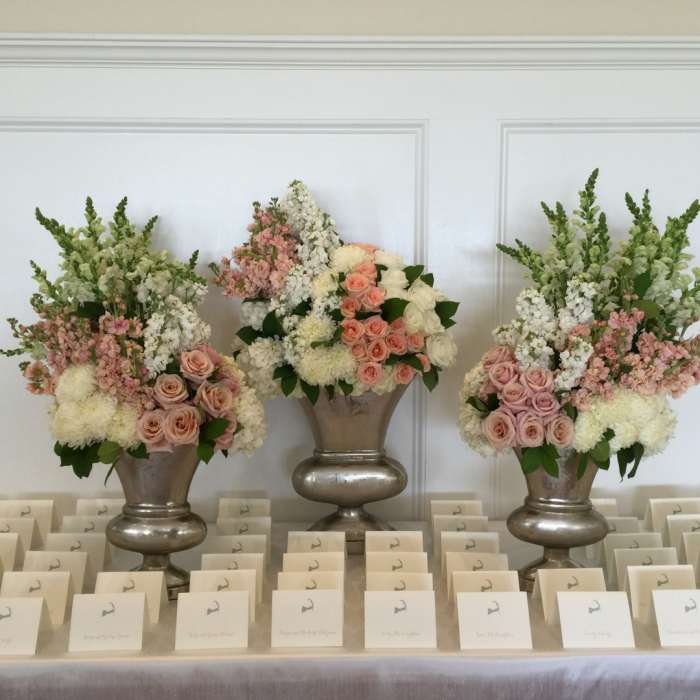 Let them speak for themselves with simple arrangements. The shape, color, and height become part of the design. 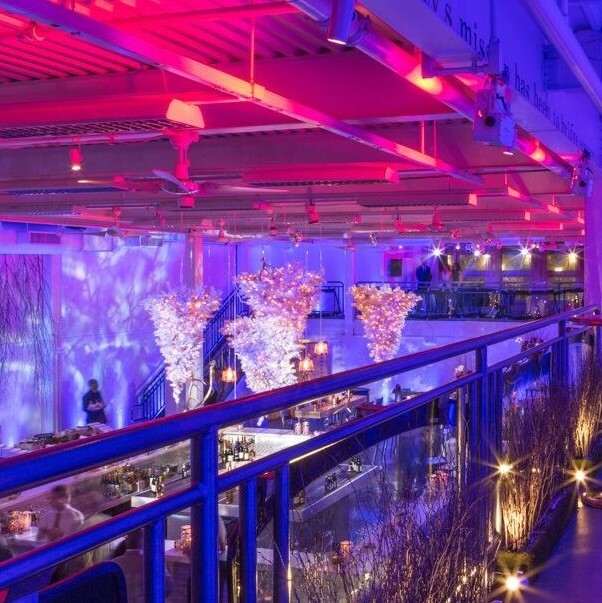 Lighting is a very important element in creating a minimalistic design. Repetition of one style will create a strong modern design element. 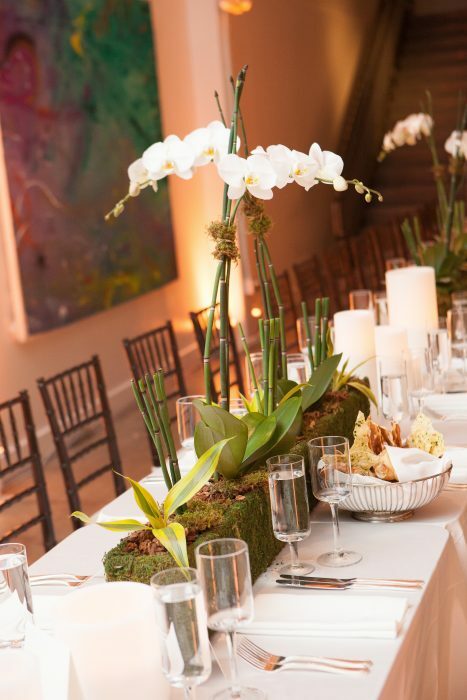 Contemporary, modern, and artistic with minimal blooms and candles. 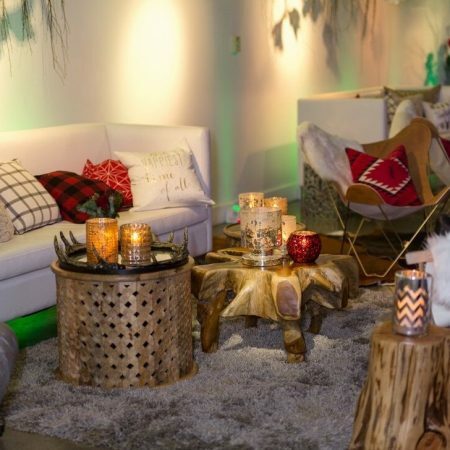 Designing with these elements add an unexpected and stylish component to the entire space. Consistent, clean and impactful. 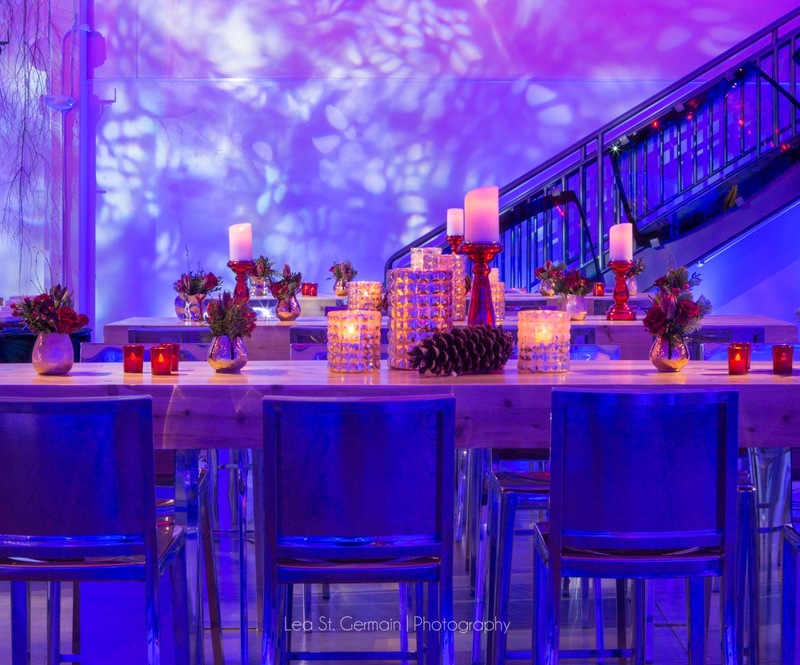 Repeating a color, shape or style adds visual interest, creates rhythm and unifies a space. 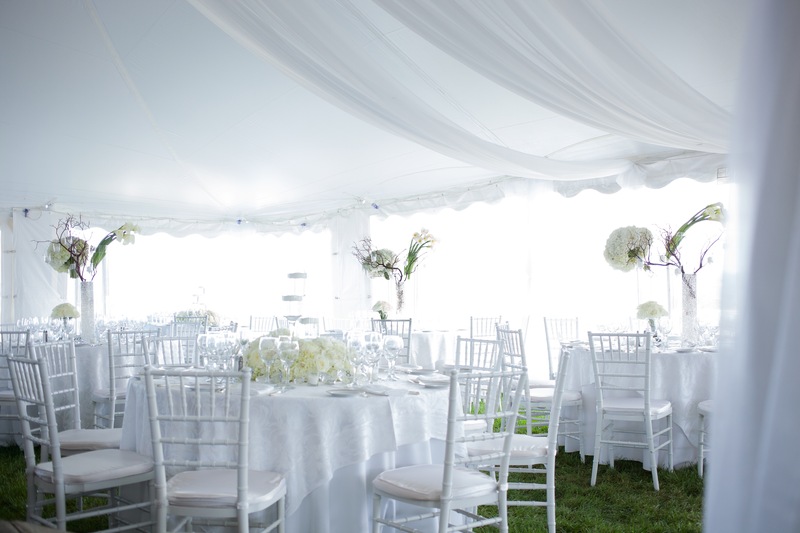 A minimalist wedding design should not feel empty nor does it need to be all white. 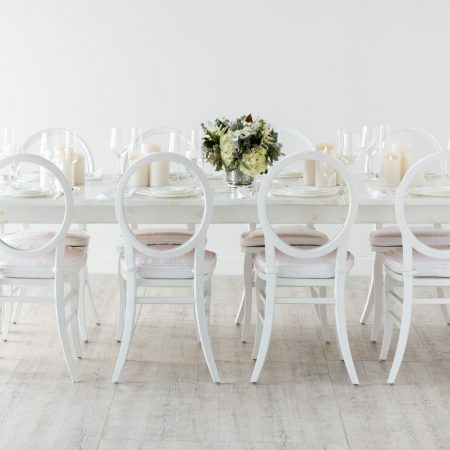 Minimalism is a style that uses pared-down design elements. 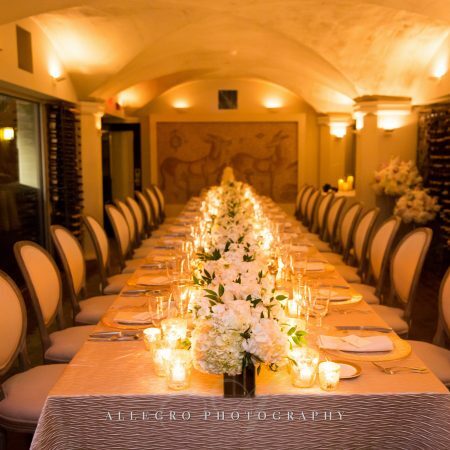 The look, if done well, should feel timeless, elegant and of course be memorable. 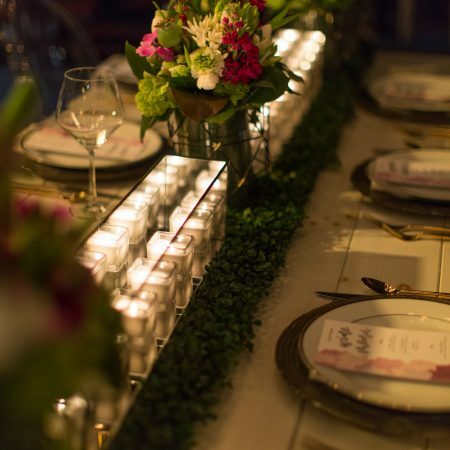 How to use Candles in your Wedding to Cast that Romantic Glow. 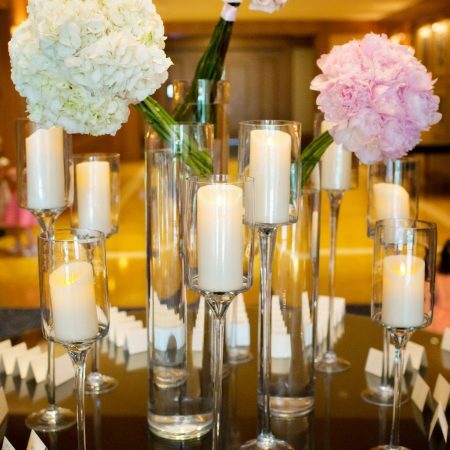 There are so many ways to use candles to your advantage when planning your wedding design and décor. 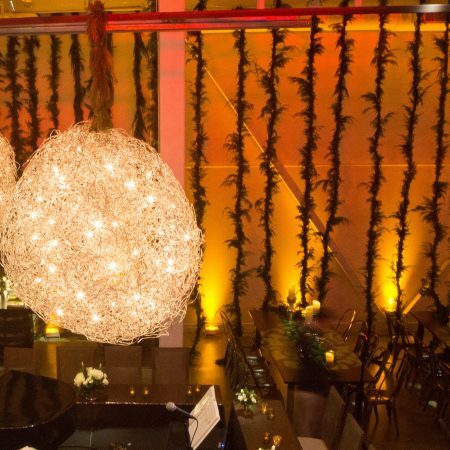 And, with all the flameless options now available, even those venues and locations that a real flame is not feasible, you can still create that magical glimmer. 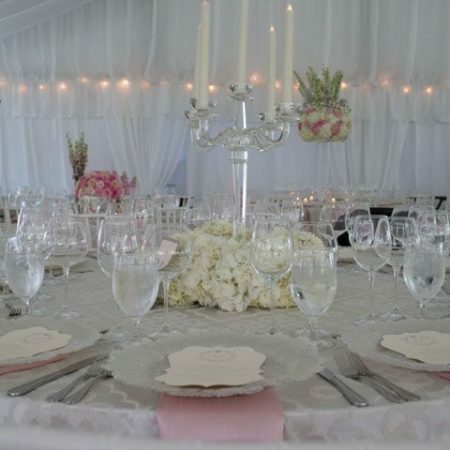 Adding candlelight to your wedding décor transforms a room, casts a soft romantic glow and warms a large space. 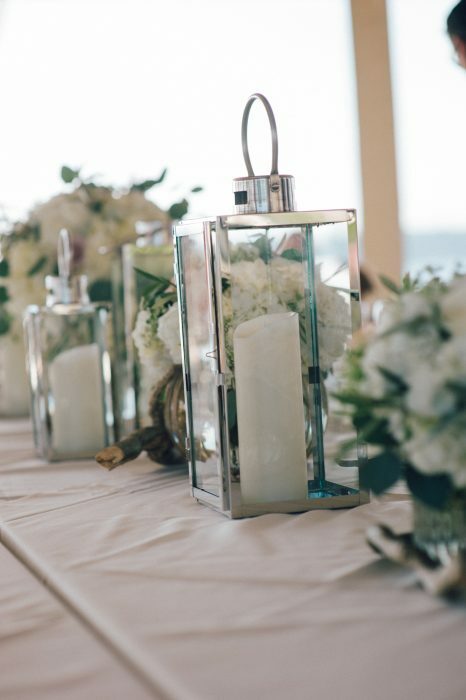 The theme of your wedding will help to dictate the direction of the style of candle and holder, but whatever style your wedding is, candlelight will add a touch of sparkle and a bit of grace to any wedding space. 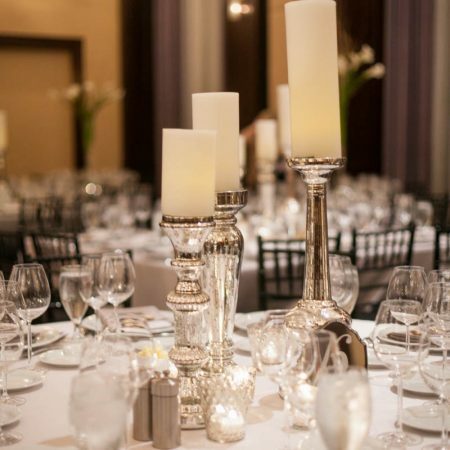 Today there are many options for candles and holders to choose from. 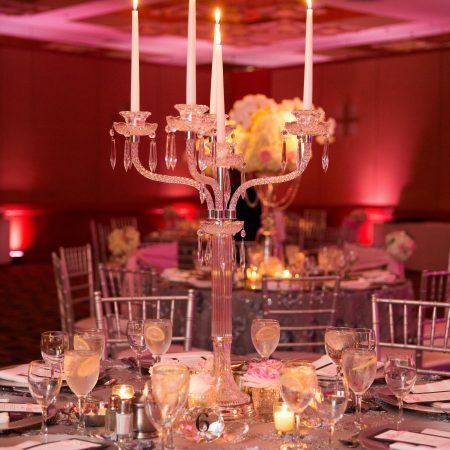 If your looking to define your ceremony space, large-scale candelabras and clusters of candle pillars gracing your aisle will add style and more than a touch of elegance. 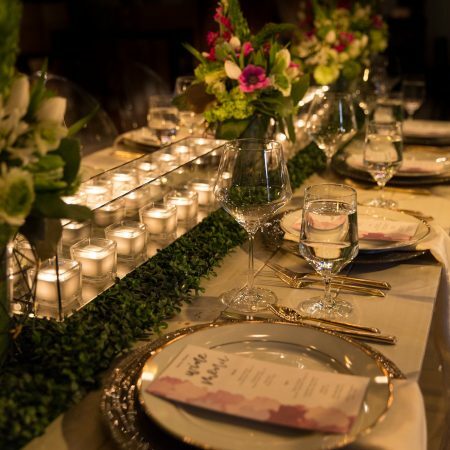 Highlighting your centerpiece florals with candlelight will cast a soft glow over your entire tablescape especially if using sequins for your linen. 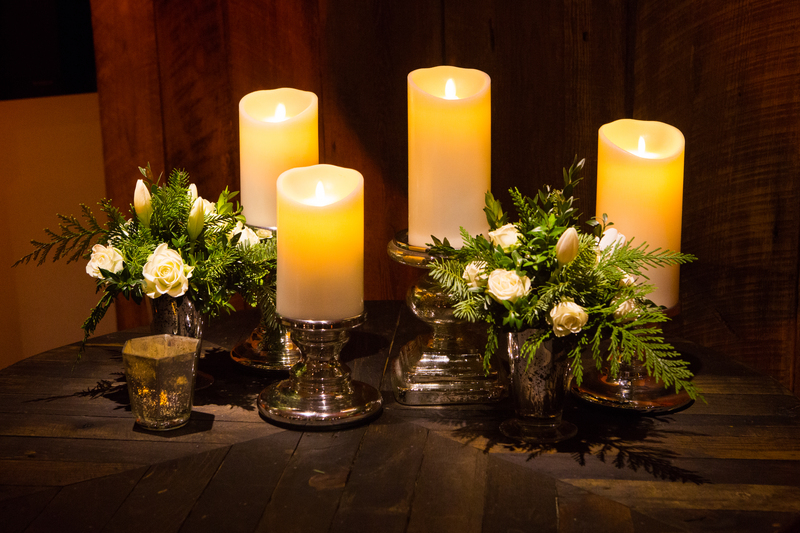 The candlelight will create a special kind of glimmer. 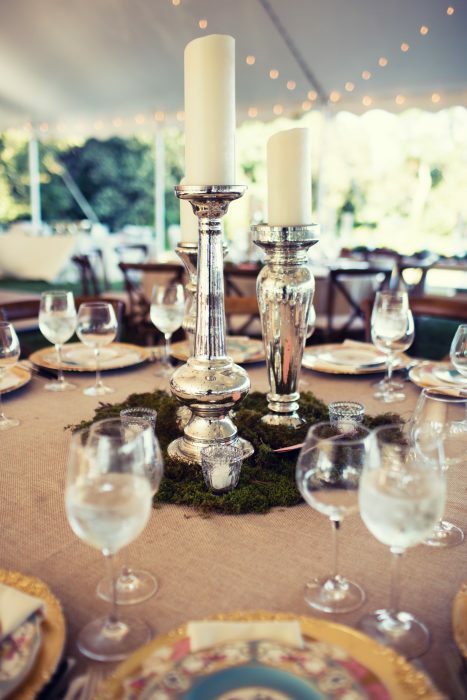 Using more organic pieces in your tablescape and décor like metal or wood? 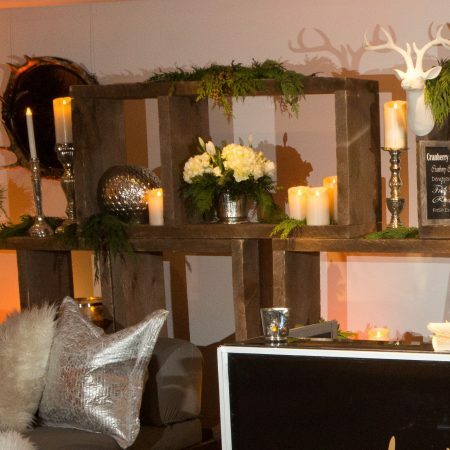 Candlelight is sure to create a very interesting & alluring brilliance to this look. 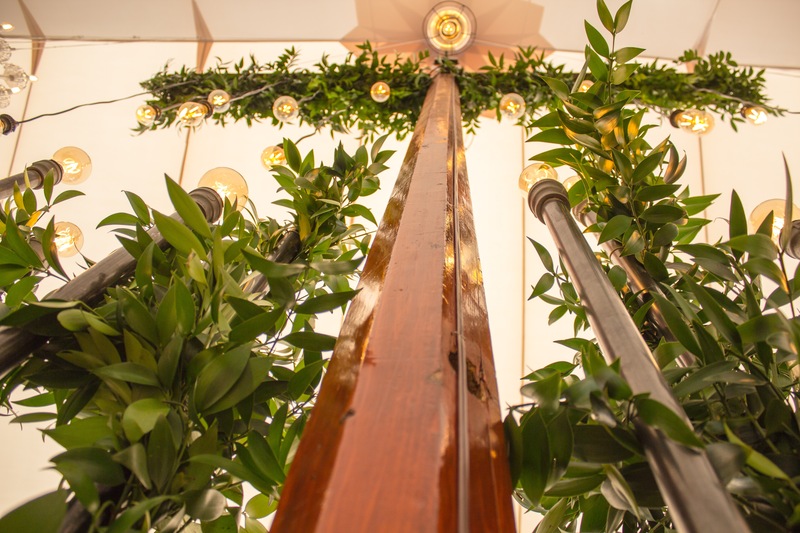 Traditional wax pillar candles are available in various heights and thickness making them a great option to help light and define ceremony and reception areas. 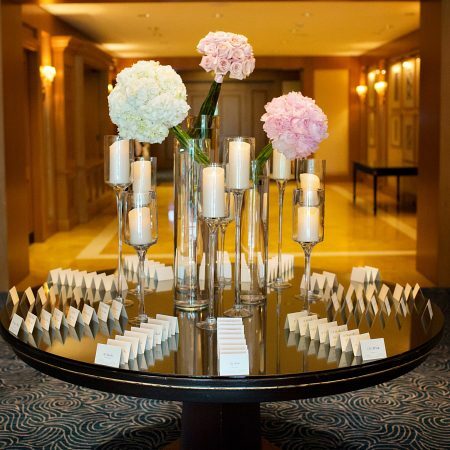 Tapers, votives and floating candles add interest and drama to any of the areas they are placed in. LED battery operated candles have come a long way. They are available in all different shapes and sizes. 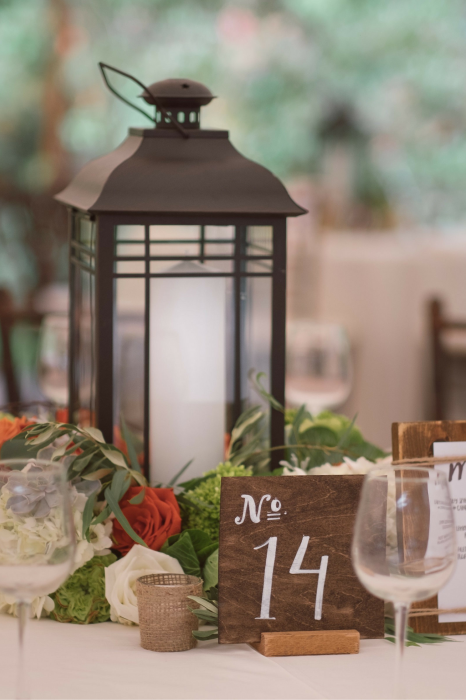 They are now made of wax and have the ability to flicker making them a wonderful option for outdoor locations or venues that do not allow open flame. 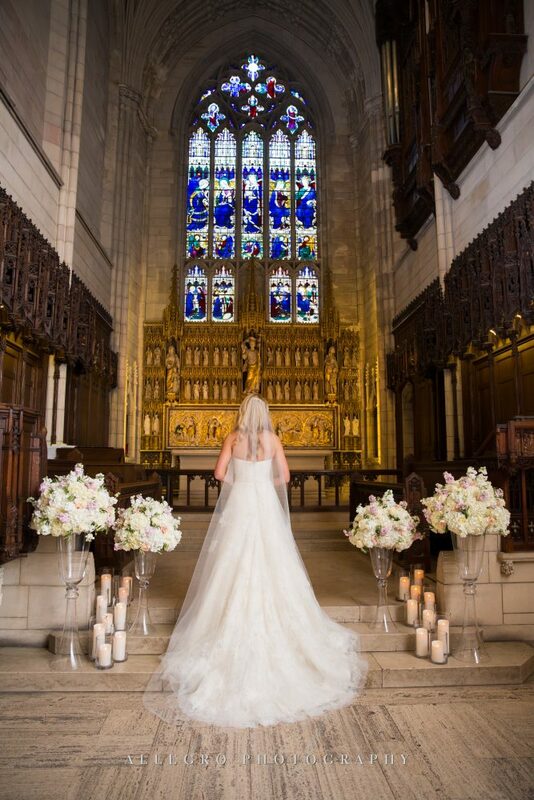 Illuminating your wedding with candlelight will add that bit of elegance, a touch of allure and create a beautiful memorable ambiance. 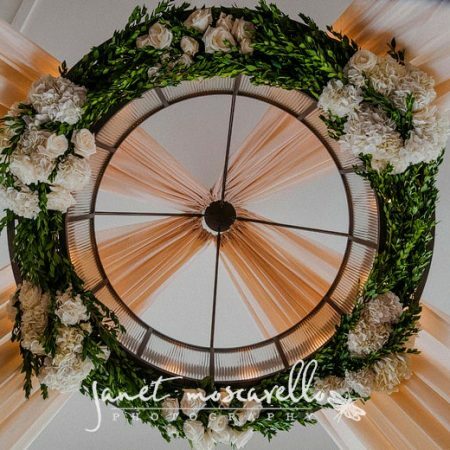 Tables overflowing with flowers, big beautiful over-sized bouquets, gorgeous floral garlands…and now stunning hanging floral arrangements. 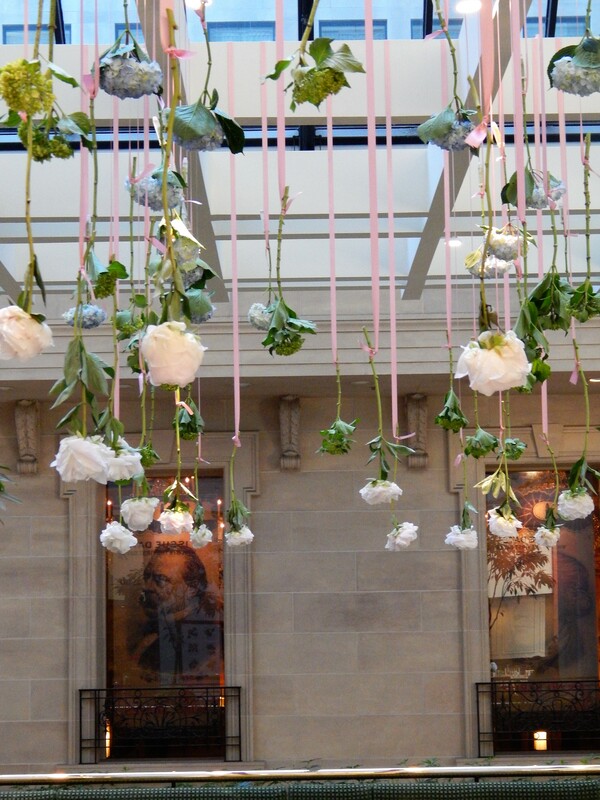 A suspended floral installation will absolutely add a unique and beautiful design element to your upcoming wedding. 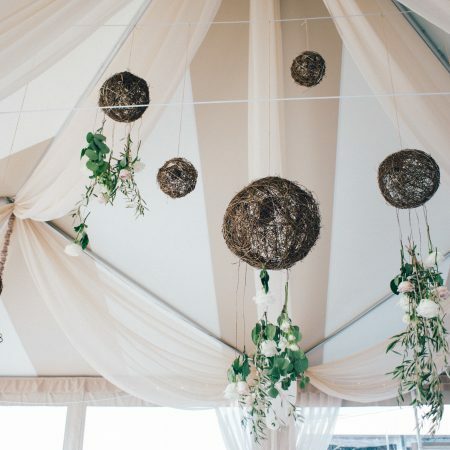 No matter what your wedding style, hanging centerpieces will transform your wedding environment. 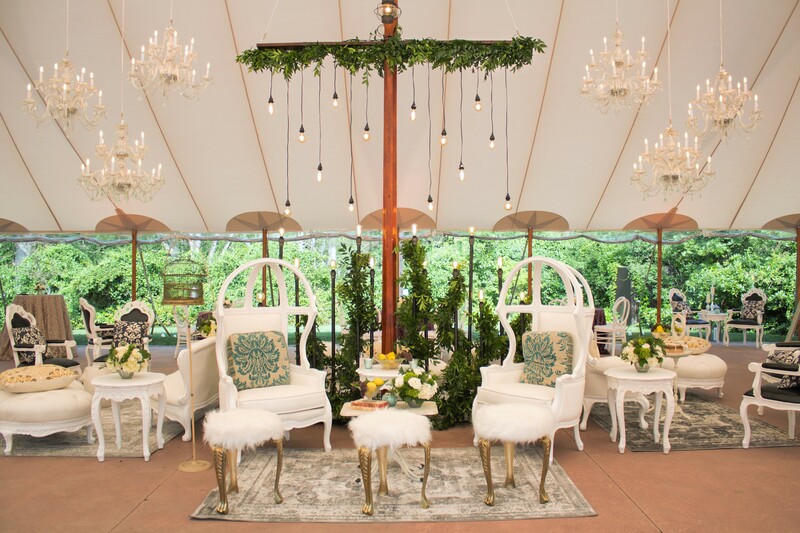 An outdoor wedding with trees dripping with ribbons, lanterns and flowers to a tented reception with floral chandeliers, hanging wedding décor will help define your space and bring about an important design element to your special day. 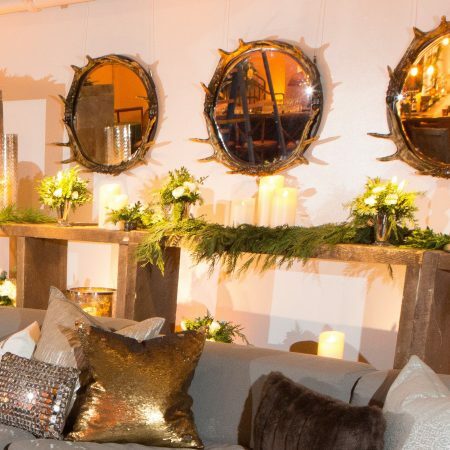 This design direction is the perfect way to bring all the beauty of the outdoors in. 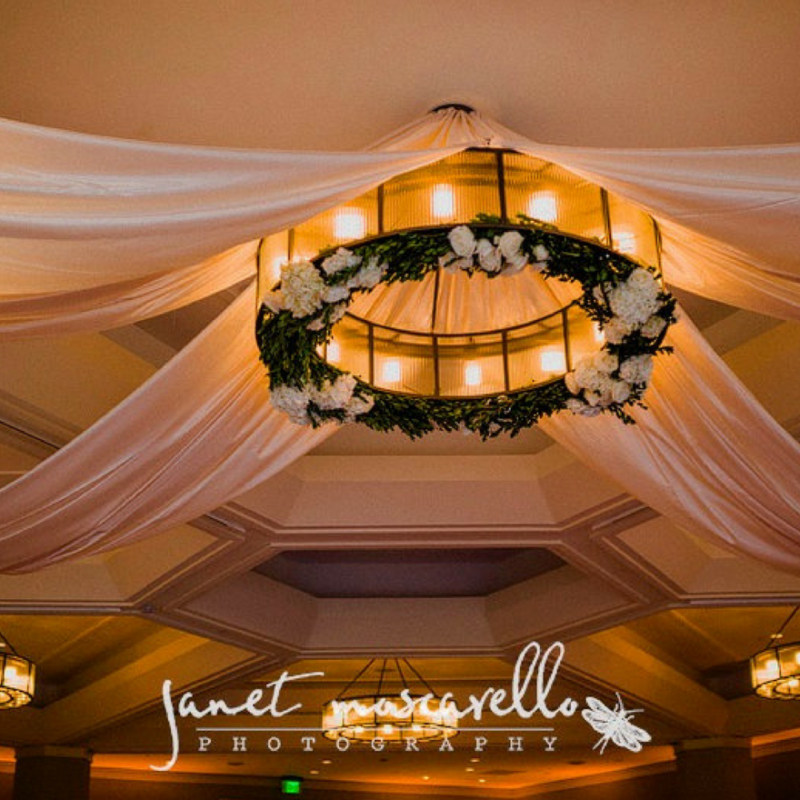 Using your venues existing structure, whether it be chandeliers, beams or other architectural elements and a little ingenuity, you can create something stunning and unique. 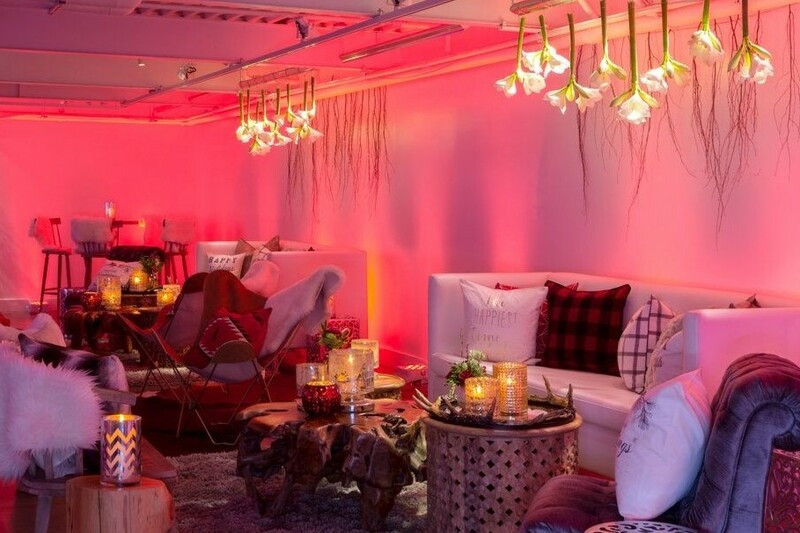 We love working with our clients in creating an environment that uses all the available space. 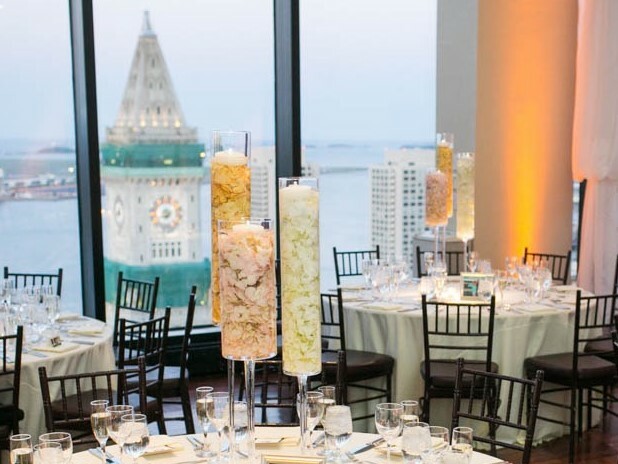 Your guests will be treated to views that have been perfectly planned and have an element of surprise. 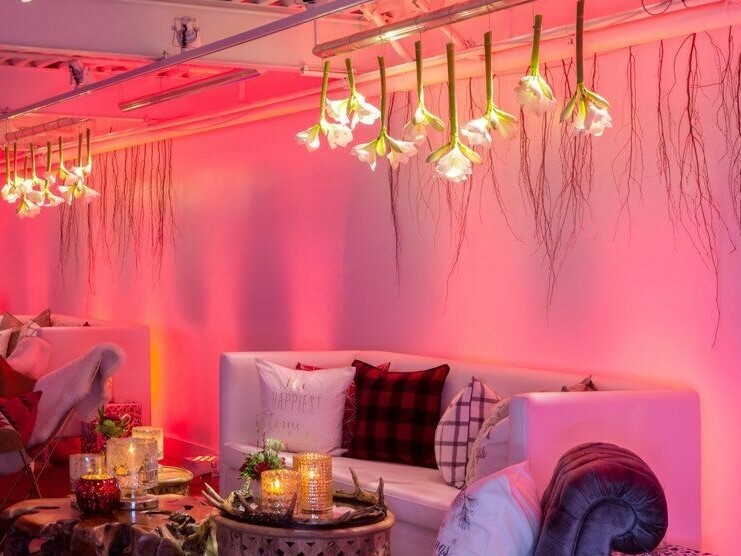 Your space can literally be “dripping in florals”. 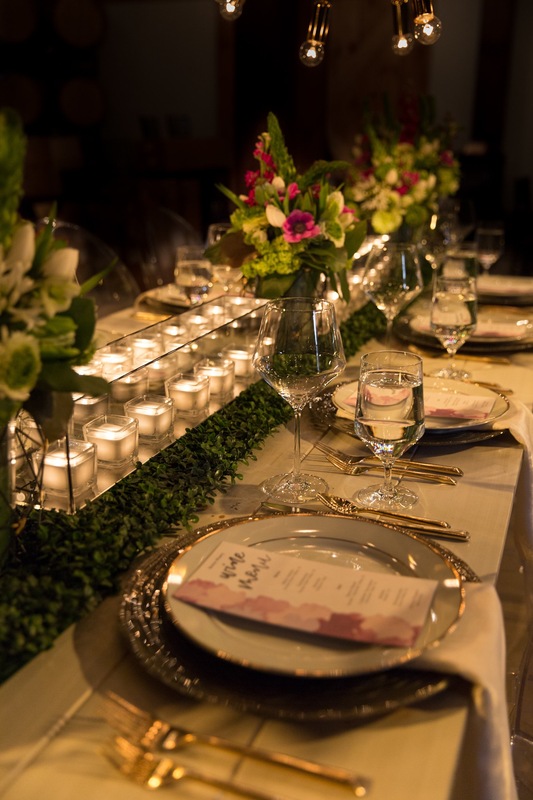 Some of our favorite weddings have allowed us to work in wonderful collaboration with venue coordinators, rental companies and lighting design firms to create design installations for above dance floors, backdrops for ceremonies and elements to designate the dining areas. 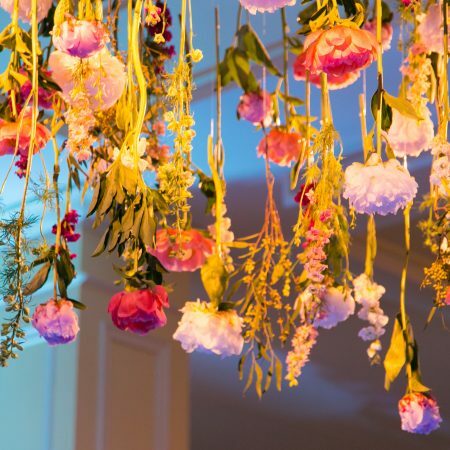 Suspended floral arrangements is one wedding trend that we have absolutely fallen for. 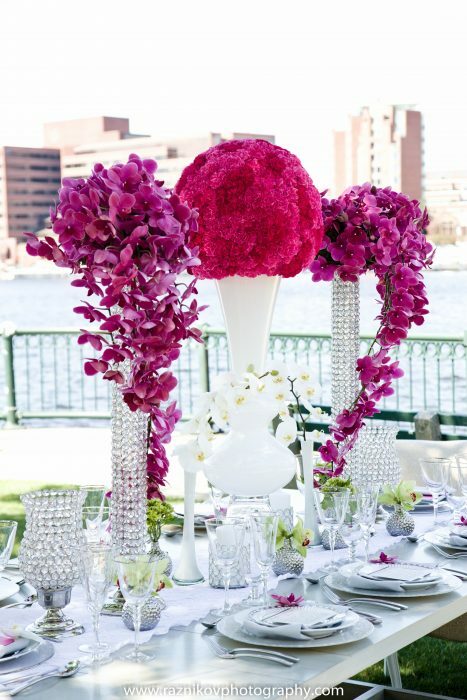 This unique and stunning design idea will add an extraordinary design aspect to your big day. 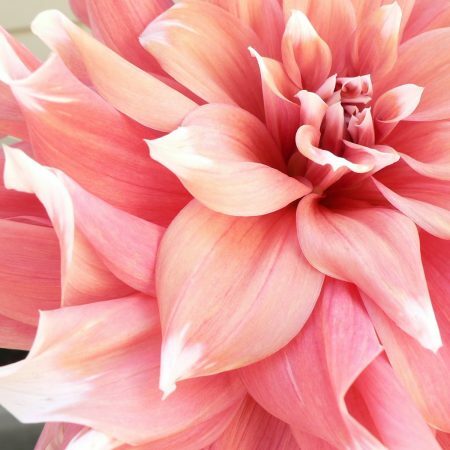 Peak dahlia season is June through October with the fall months seeing some of the biggest blooms and most brilliant colors of the season, especially here in New England. 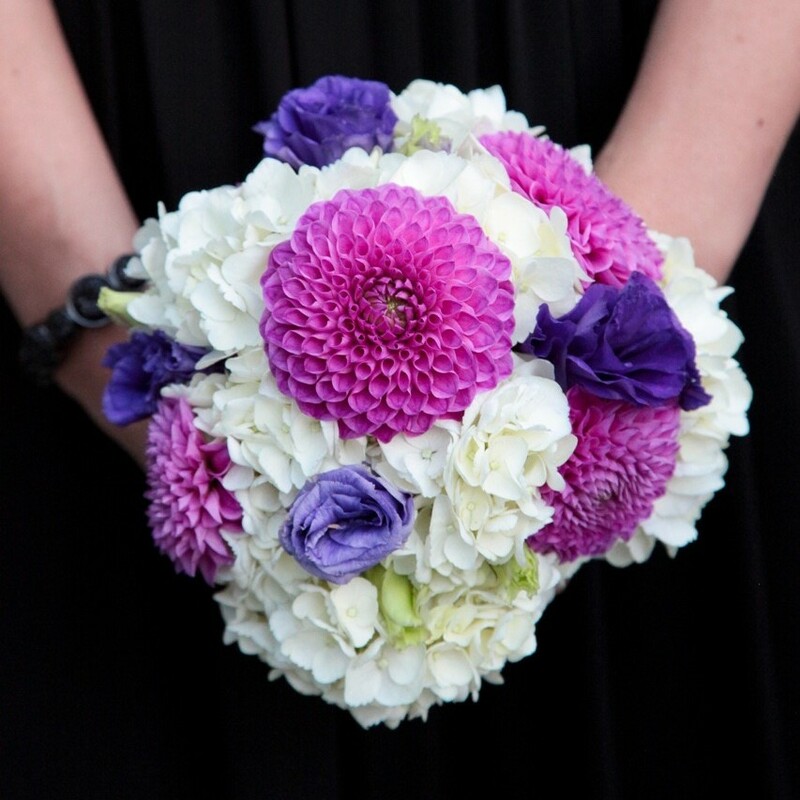 Dahlias are an ideal flower option for your upcoming wedding. 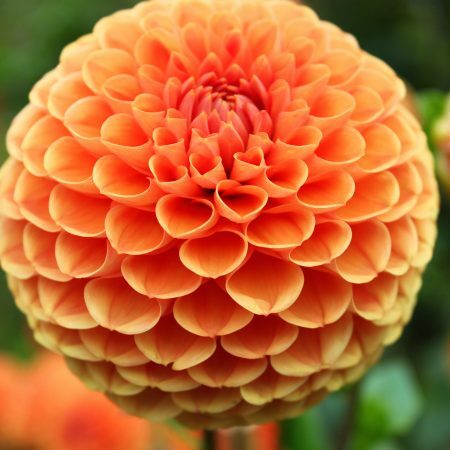 They are related to the sunflower, daisy, chrysanthemum, and zinnia so color options are quite varied…but the blooms, those are are the real attention grabbers. 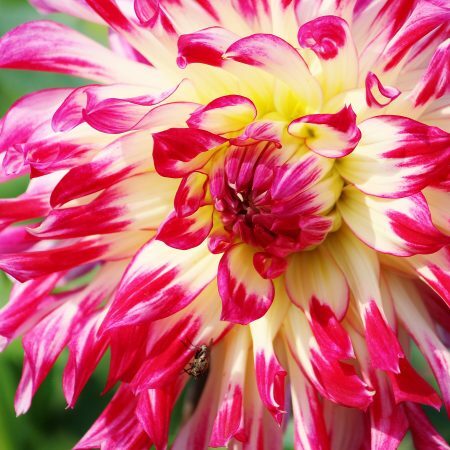 You only need a few dahlia blooms to make a huge impact. 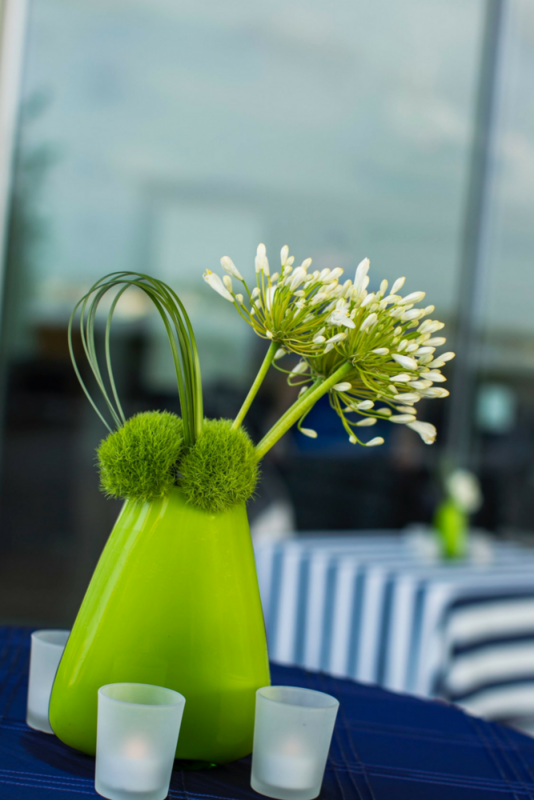 There are MANY MANY different shapes, forms and color varieties to choose from. 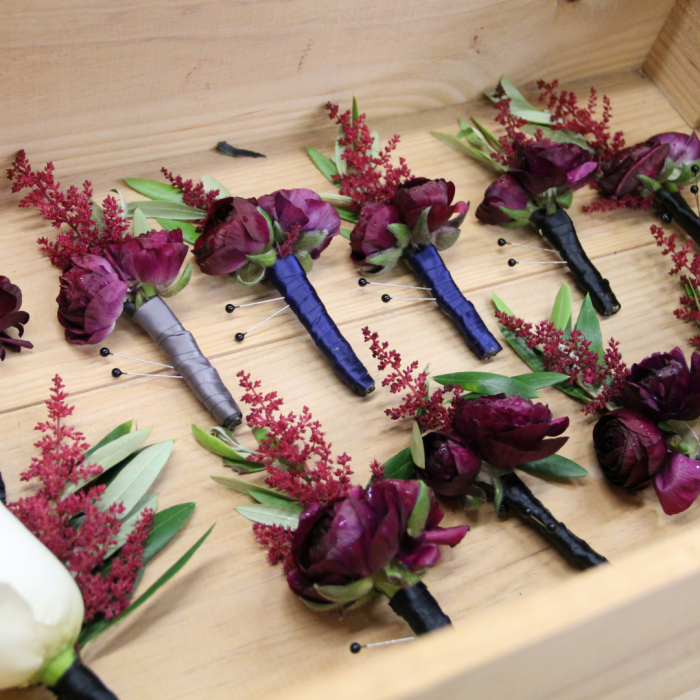 They will work perfectly with all wedding and bouquet styles. 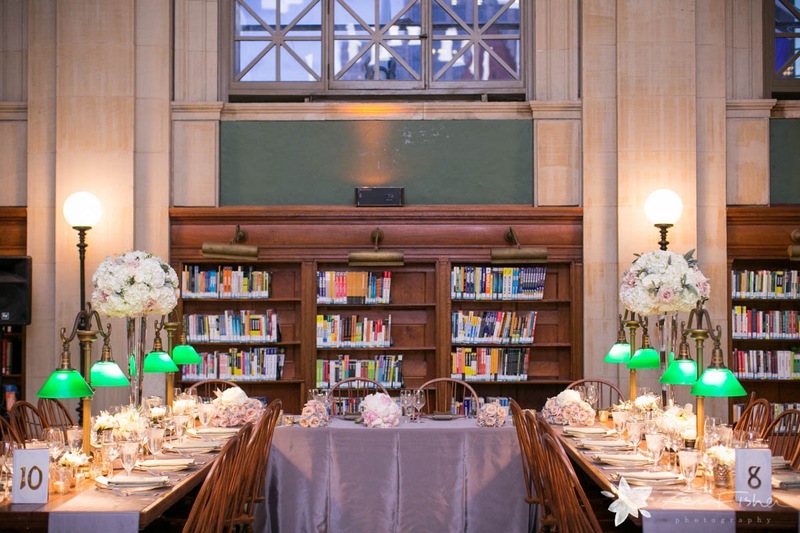 A romantically classic wedding with a single stem arrangement or the traditional white or blush blooms mixed in with antique floral varieties will feel elegant and sophisticated. 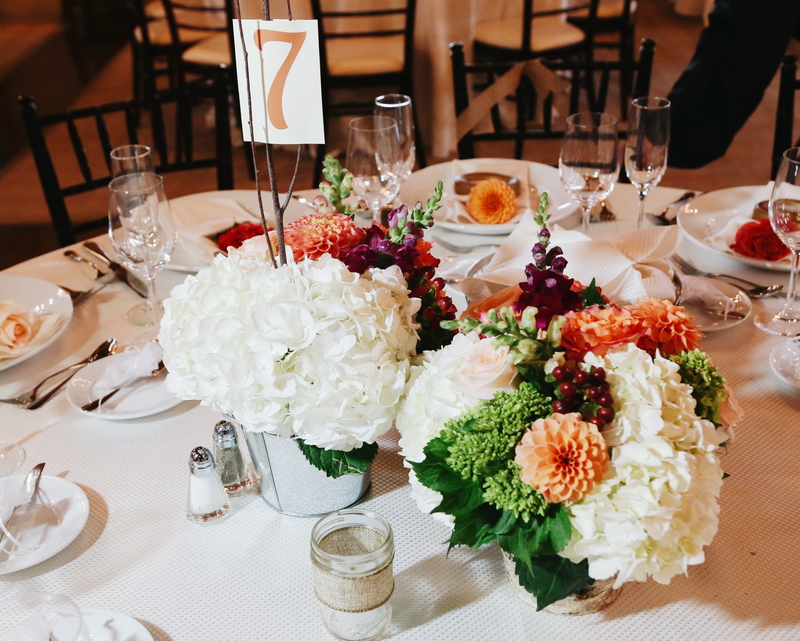 If your wedding style is more modern and bold then extra-large blooms will make for a dramatic focal point for your bouquet and table décor. 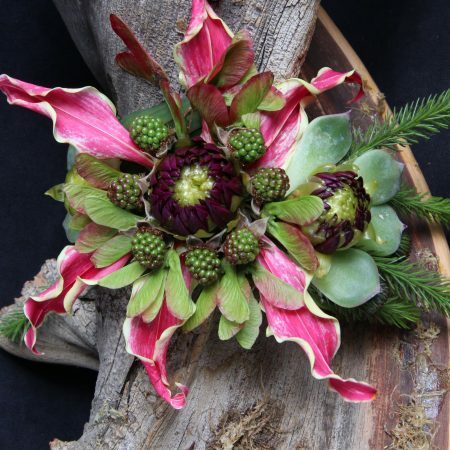 While a rustic and organic wedding style will have dahlias paired with branches and berries for that more woodsy feel. 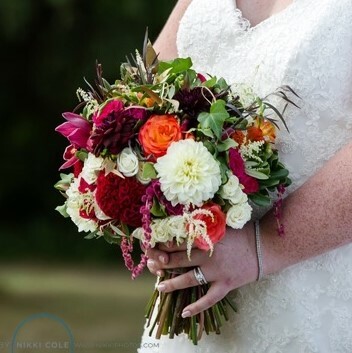 Deciding to have dahlias as your floral design and décor will not only provide for a beautiful wedding but will also be an eco-friendly decision. 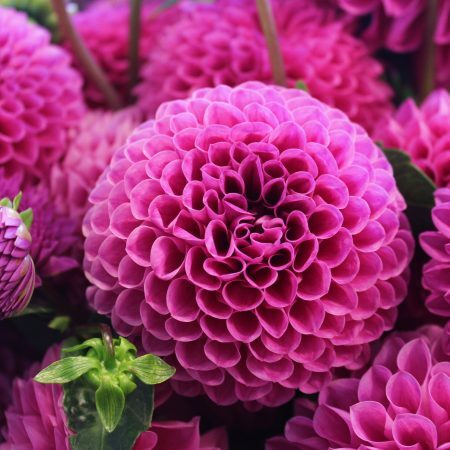 Dahlias are locally grown so the cost of transportation and emissions are much lower which literally means a true “farm to table” or “farm to centerpiece” or “farm to bouquet”. 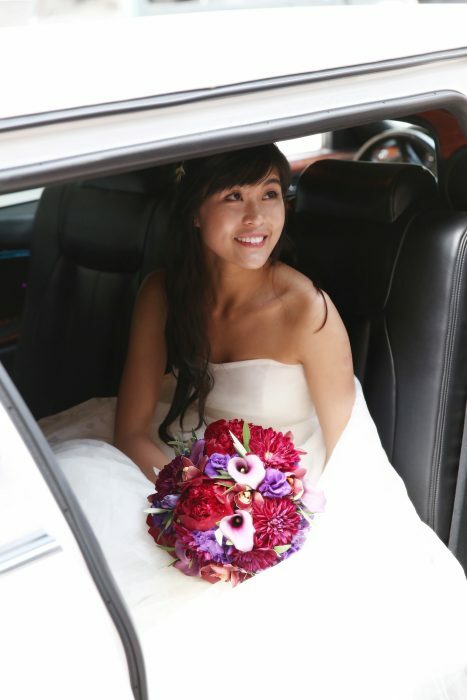 A wedding trend that has been a fun and interesting one for us is the oversized wedding bouquet. 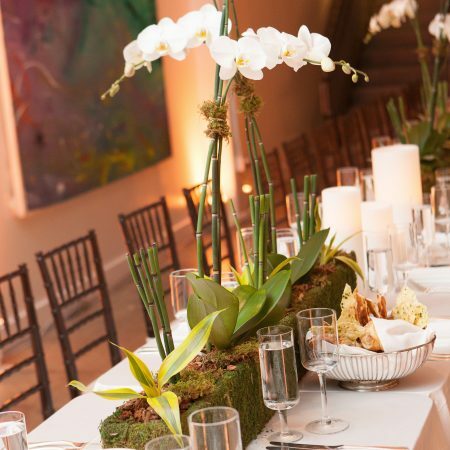 From massive bunches of garden flowers to large succulents & air plants, this look is pretty awe inspiring. 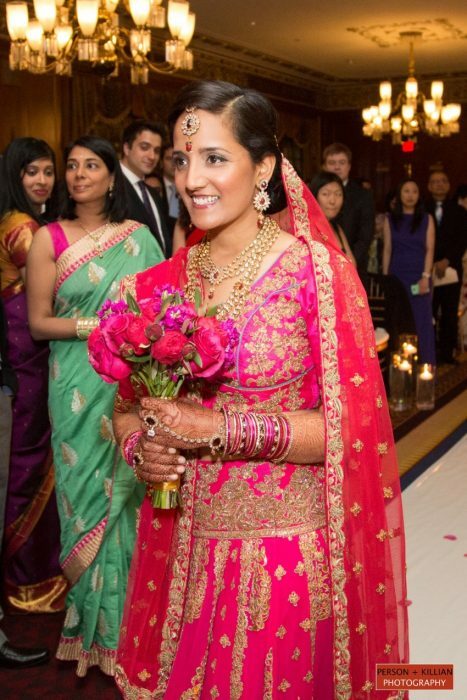 And, this is a style that can be incorporated all year round depending on the look and feel of your wedding. 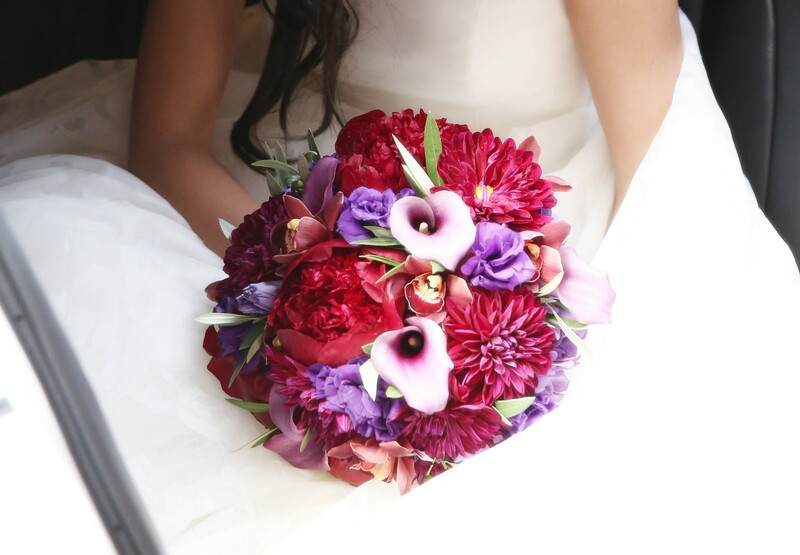 We have had a major increase in requests for this style of bouquet, especially during this current wedding season. 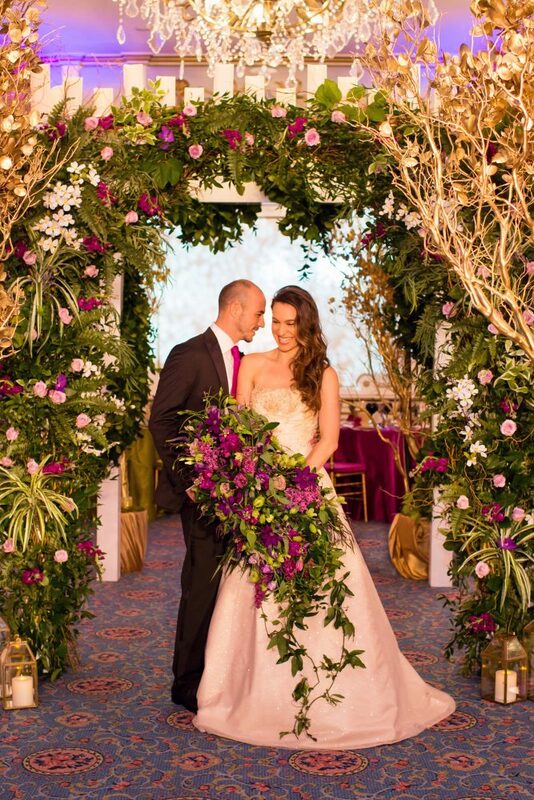 This surge of interest is certainly fueled by the extensive amount of stylized shoots which push the boundaries of style & design as mentioned in this recent Wall Street Journal piece, Brides Are Ditching Bouquets for 13-Pound Clumps of Vegetation. 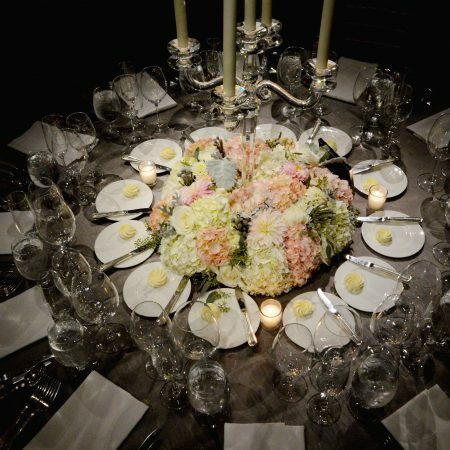 This extravagant direction of bouquet must be however considered carefully. First, there is the cost of all those blooms. 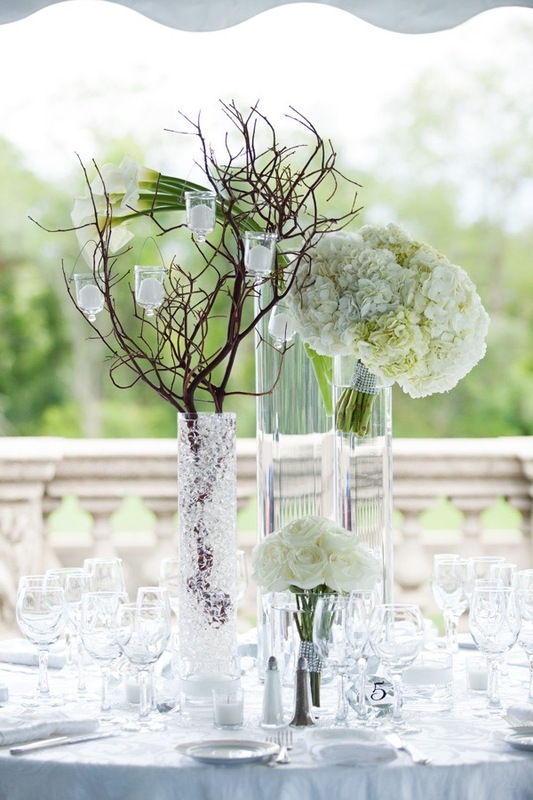 A massive number of stems are needed to create something this dramatic. The time and expertise needed to carefully craft what will soon be a work of art is costly. 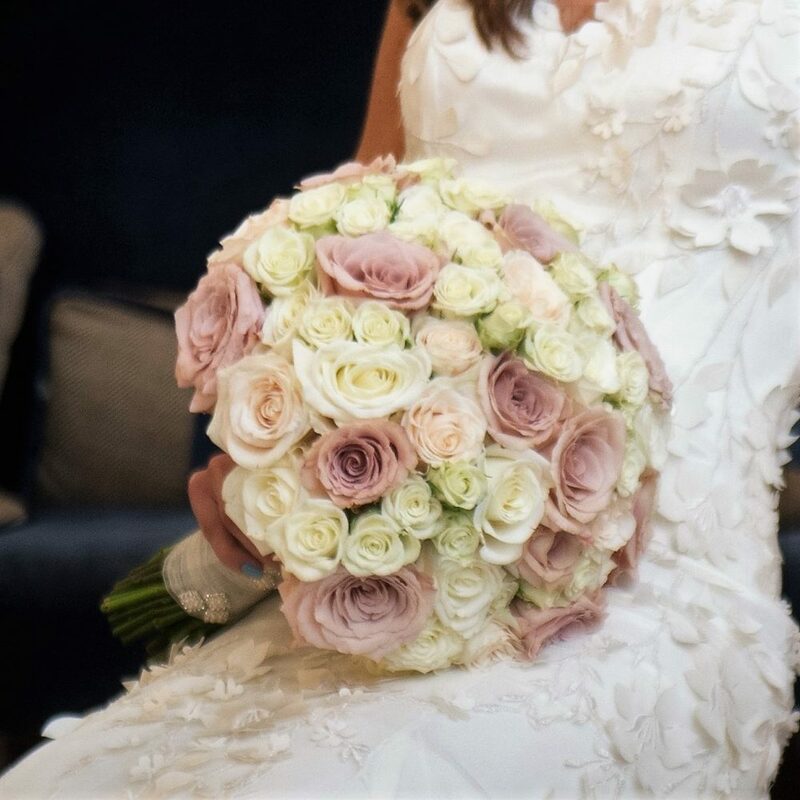 We like to say bigger is always better, in fact we believe the bridal bouquet is more important than the dress itself…..not everyone believes this though. 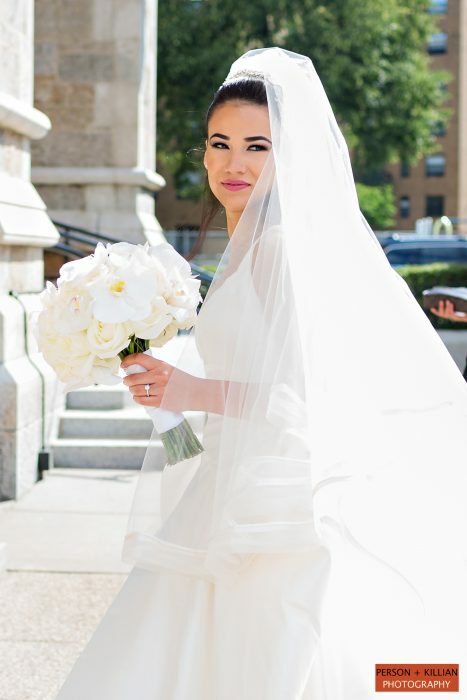 We need to ensure that each stem stays in place, is well balanced and somewhat easy for you to carry, which brings us to the next consideration, “Are you physically able to easily and gracefully carry an extra-large bouquet down the aisle?”. 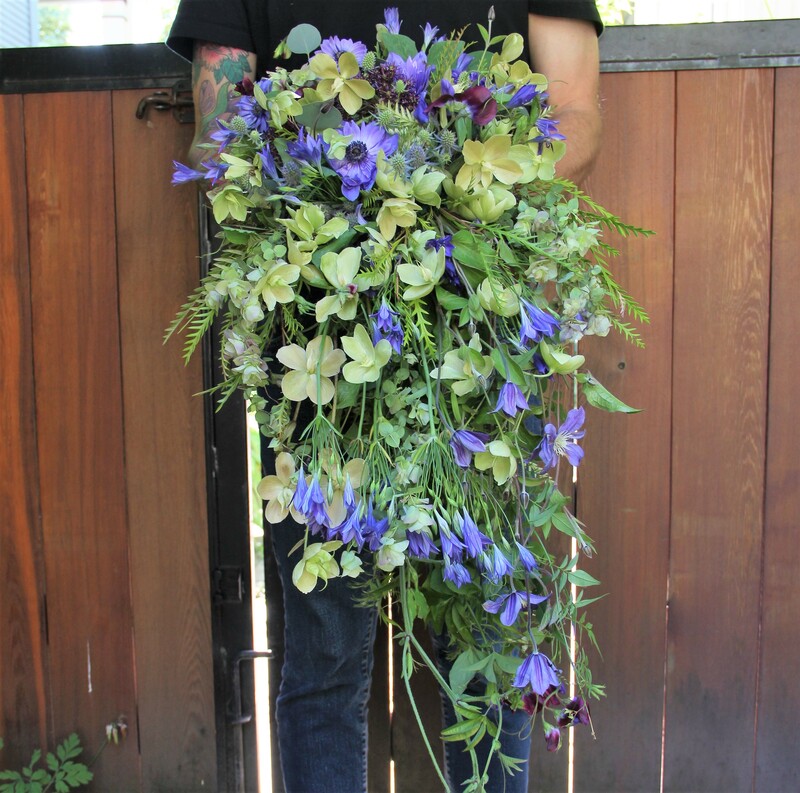 These large-scale bouquets are heavy! 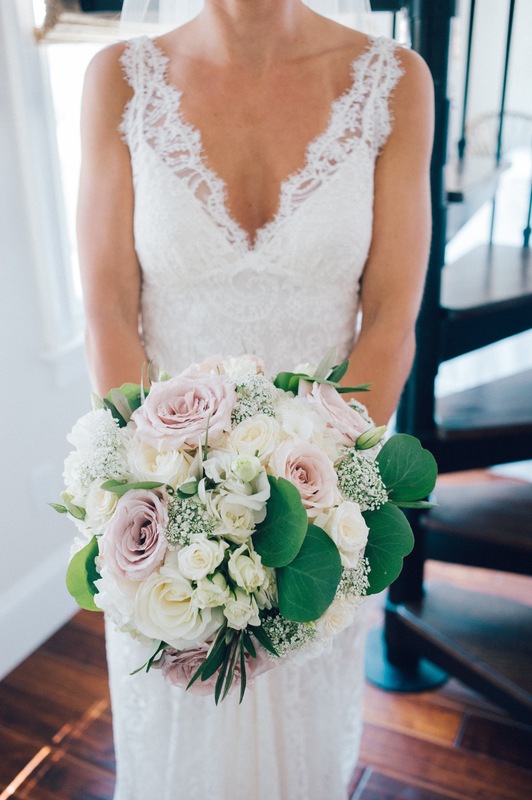 Even if you can manage to pull this off, can your maid-of-honor handle the piece during the ceremony along with her own bouquet. 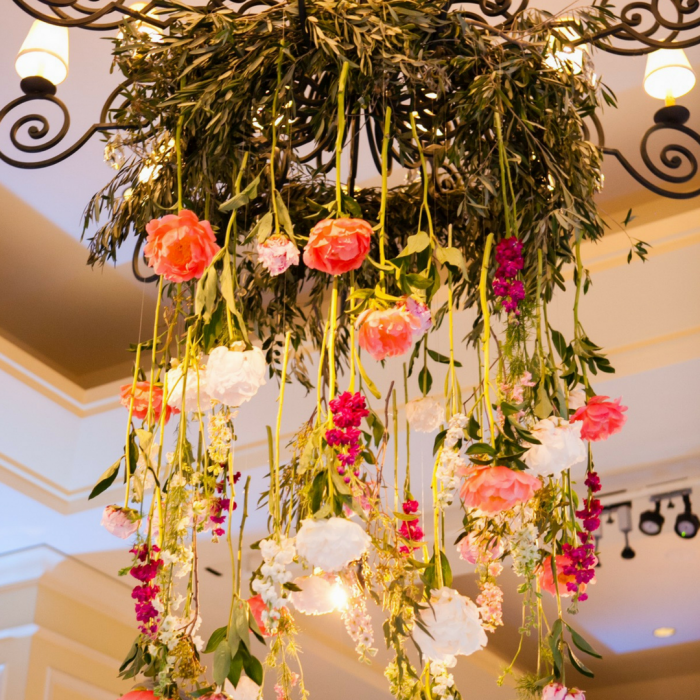 Where will you showcase your blooms during the wedding reception? 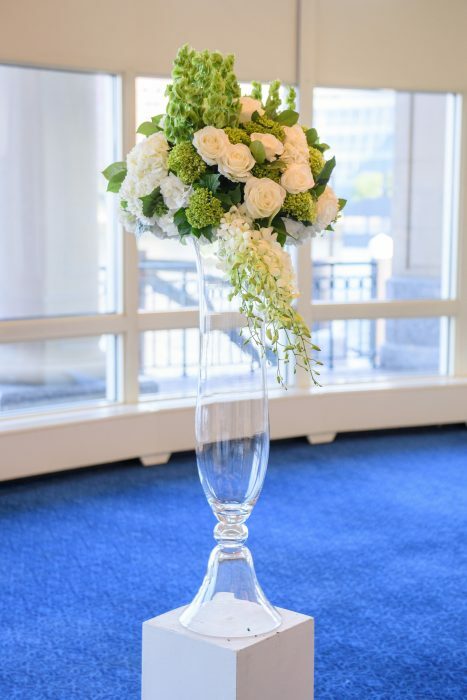 Your bouquet will need a home while you are enjoying all the fun wedding festivities, so you must consider available space in your wedding venue to showcase this amazing piece. 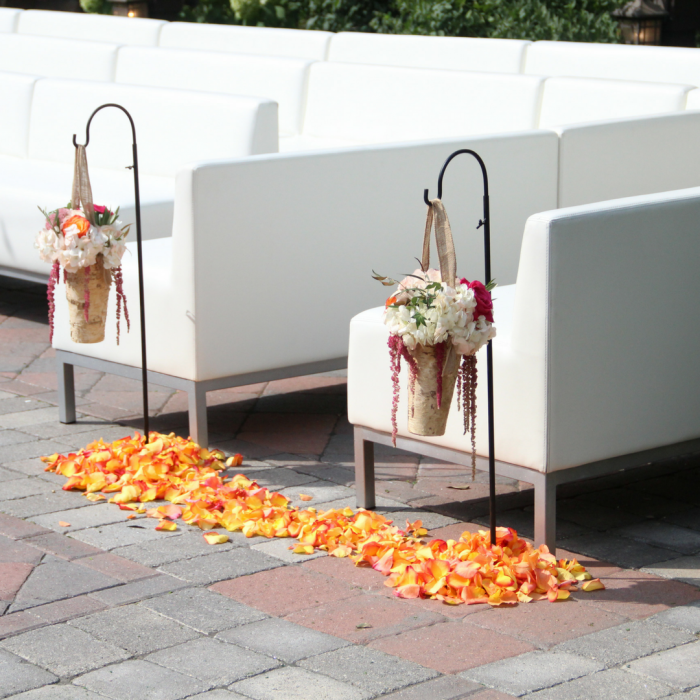 What about the bouquet toss? 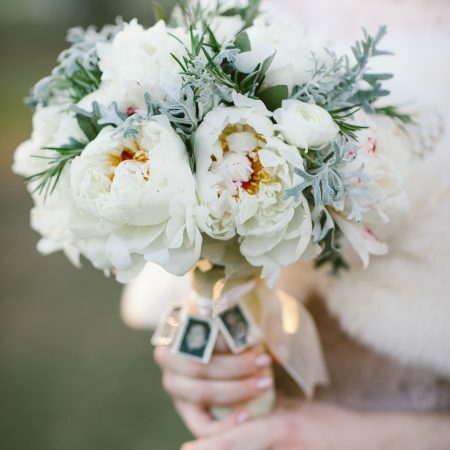 A smaller sized bouquet will need to be designed if you want to partake in this tradition as there is certainly no “tossing” of anything this large. 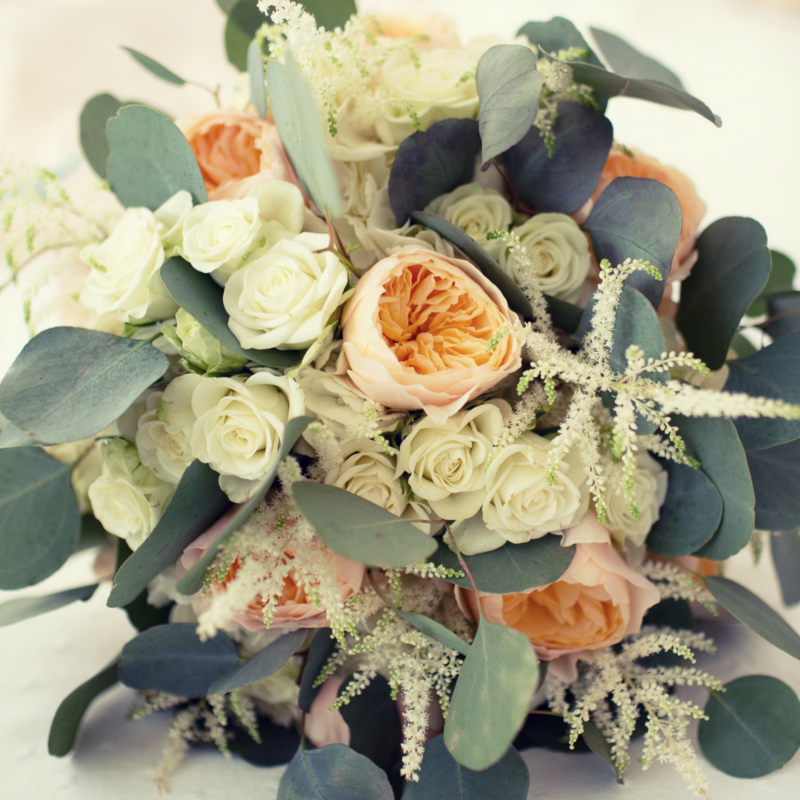 Another consideration is will this style of bouquet work with the style of wedding you envision. 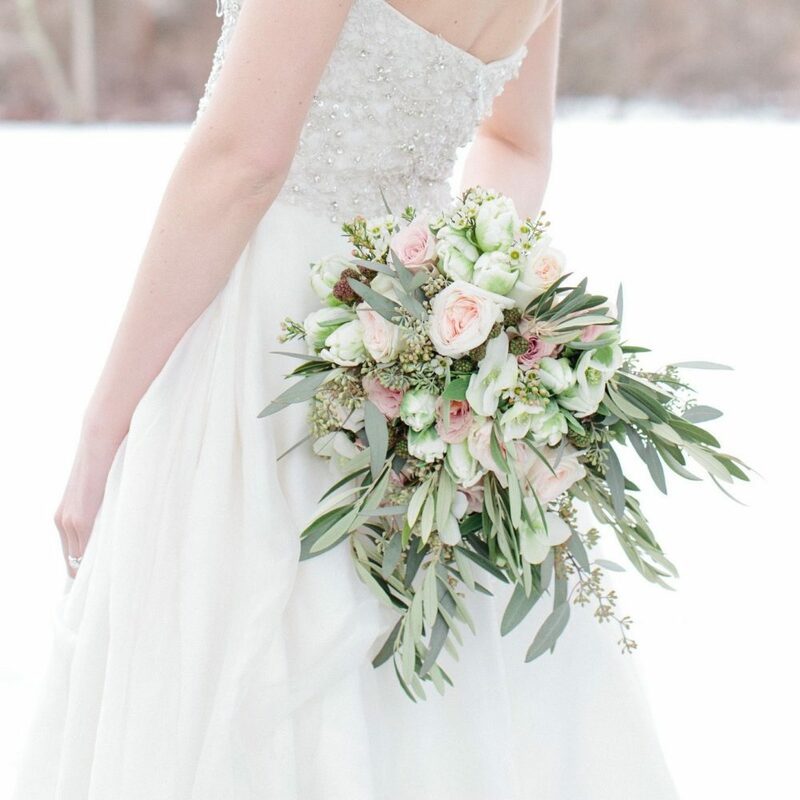 If your wedding is more on the classically chic side, this style of bouquet may seem out of place and excessive while a garden or forest wedding would be enhanced by a bountiful bouquet. Something very important to think about, your style of dress. 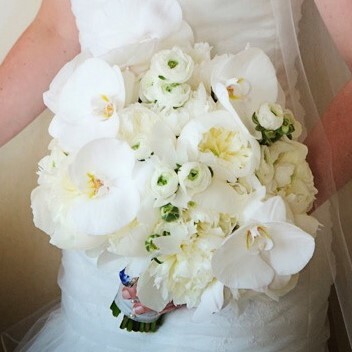 Will an overflowing bouquet grab the spotlight away from your wedding gown or will it add to its elegance & grace? 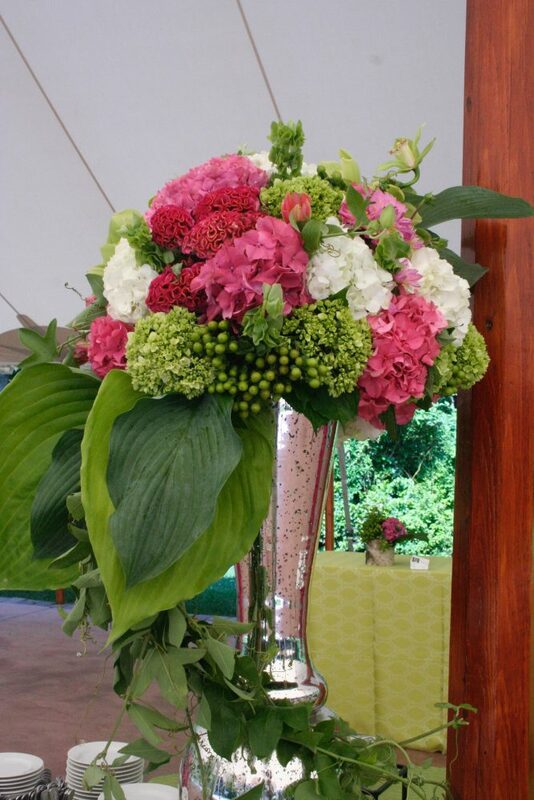 Large-scale bouquets are a trend that is hanging on tight. 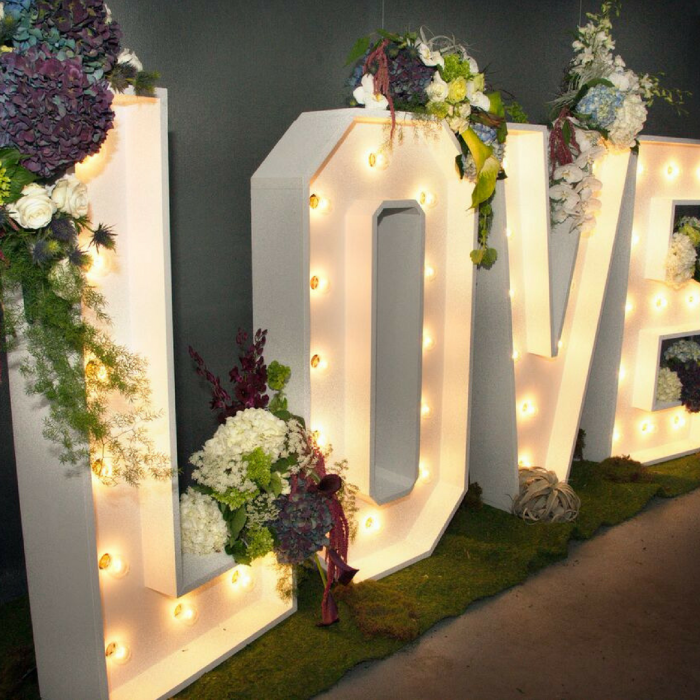 Whether you have your heart set on large blooms, cascading greens or a little of both, with a little forethought and through planning this impressive piece will certainly make a dramatic and memorable statement piece to your wedding. Have you checked out Boston’s newest publication- Boston Voyager? 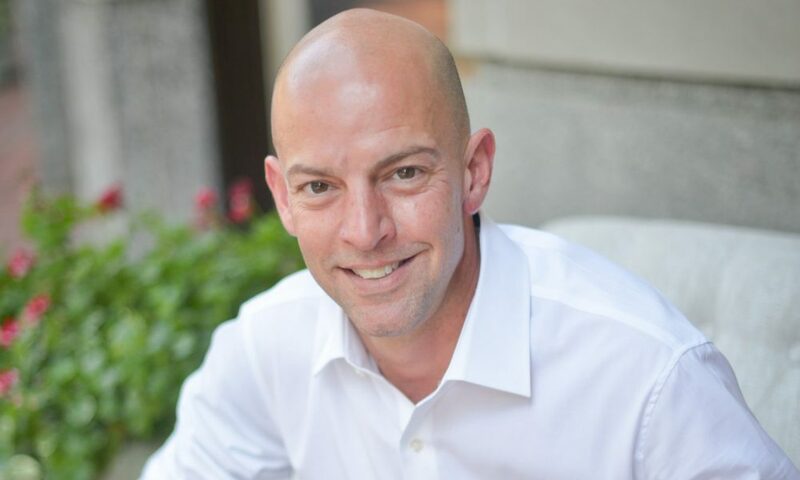 We hope that you will take a peek at this piece and learn a bit more about Flou(-e)r and our owner, Gregory Costa-Saint John. 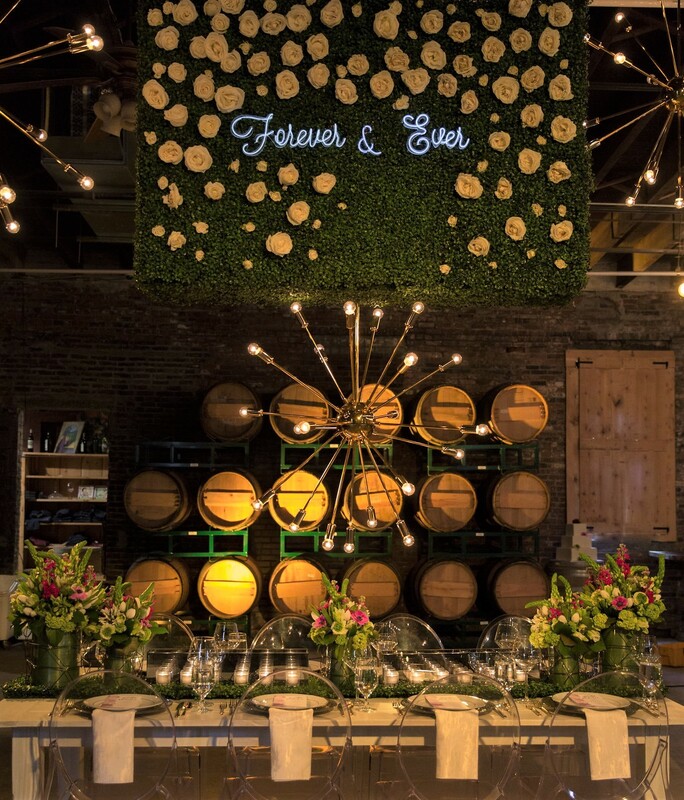 We think they did a wonderful job capturing what drives us and what we love about working in the wedding & event industry and with our wonderful clients. Thank you Boston Voyager and welcome to Boston! We are excited to have you here. 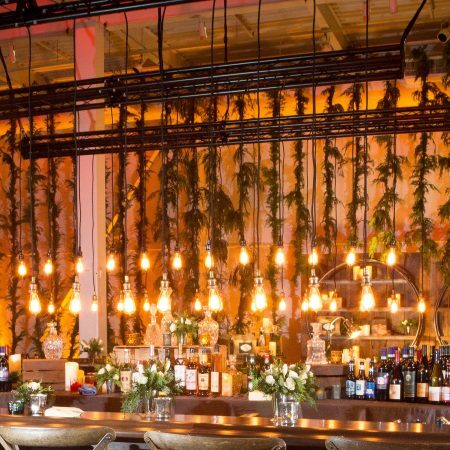 Take a look at some of their other publications for what to do & see, where to eat & drink and so much more in these exciting cities. 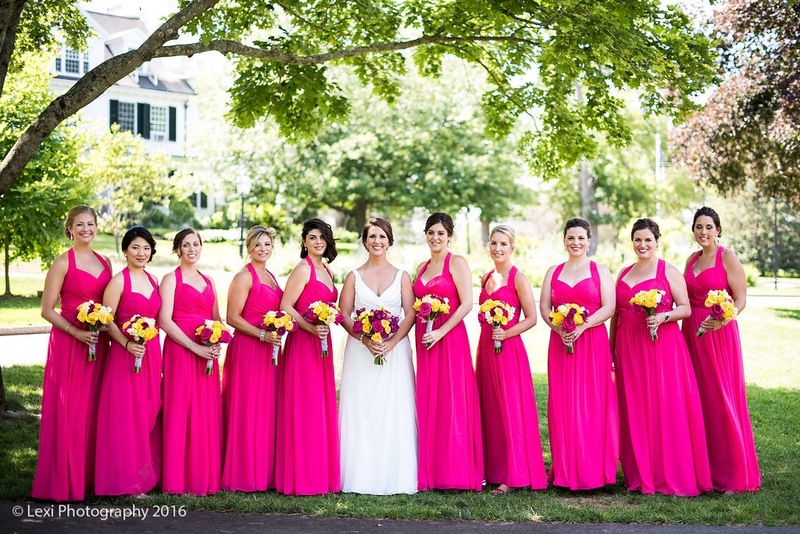 The summer heat is now upon us just in time for the height of the wedding season. 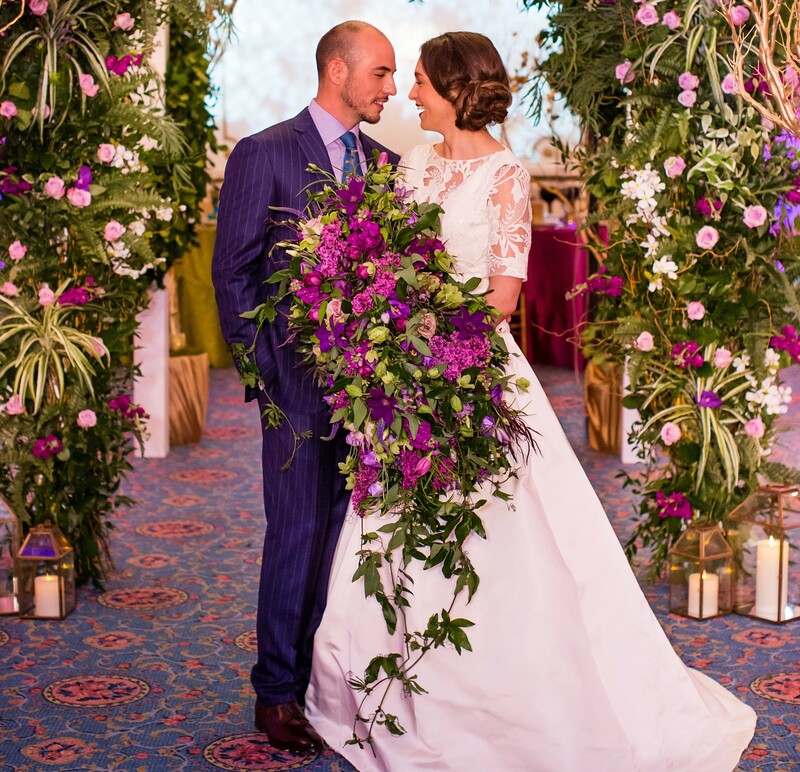 Choosing your wedding flowers this time of year can be a challenging one. 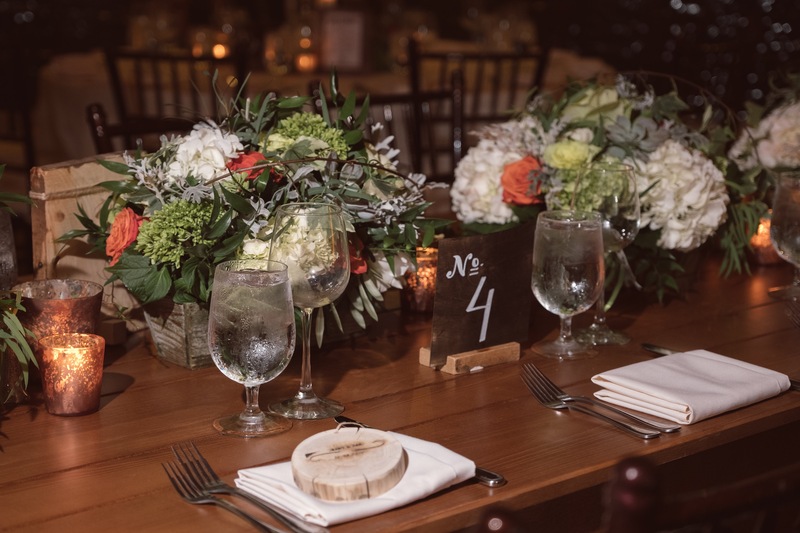 There are however so many beautiful options that can be designed to ensure that your bouquets, boutonnieres & centerpieces will hold up to the heat & humidity of the summer season. 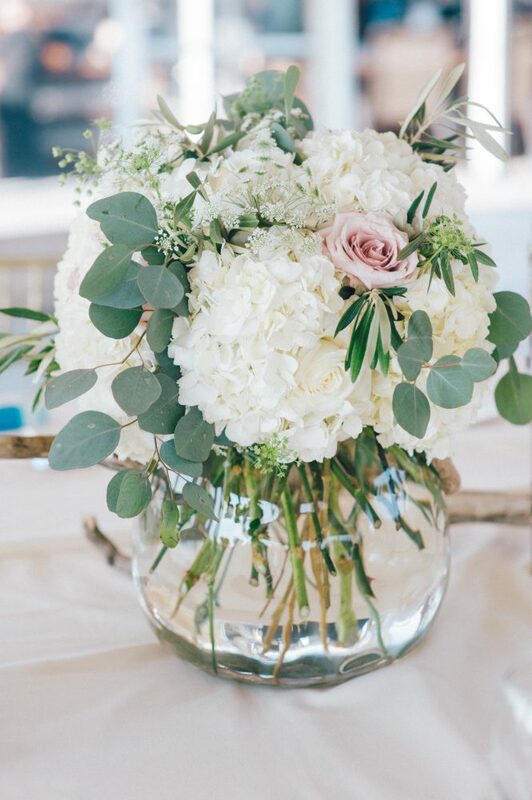 With the introduction of locally grown flowers as well as easy access to varietals from other countries, we can assure our clients of creating arrangements that are not only unique but will stay fresh and beautiful no matter what the summer weather brings. 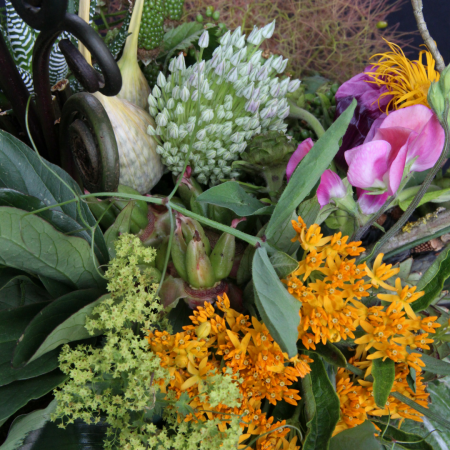 Some of the summer New England classics are the best options for a wilt-proof design as are tropical blooms and foliage, greens and grasses, unique succulents and desert blooms. The following is a list of flowers that with a little care in preparation will stand up to the heat & sun of the coming months. 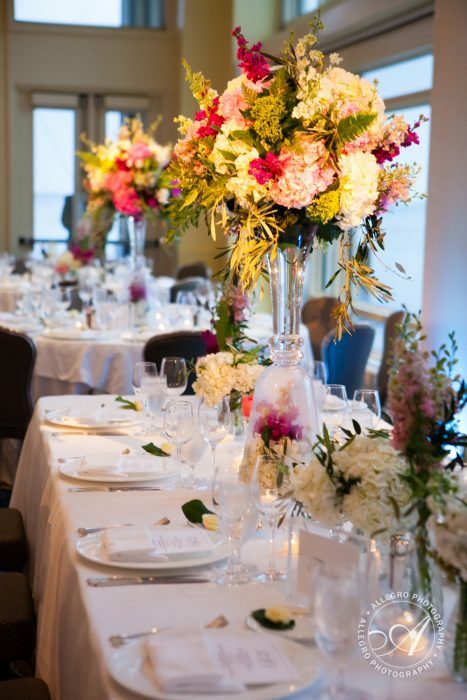 Here at Flou(-e)r Specialty Floral Events we take great care in preparing each bloom for your wedding and event design, and have thought through all the details of how to ensure that you will have the freshest blooms for your big day. 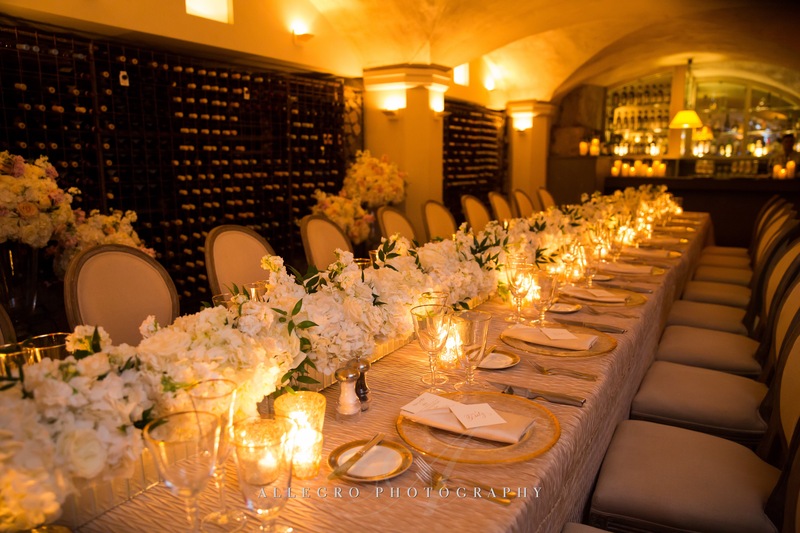 We have invested in the best storage facilities as well as transportation means for our flowers & greens. 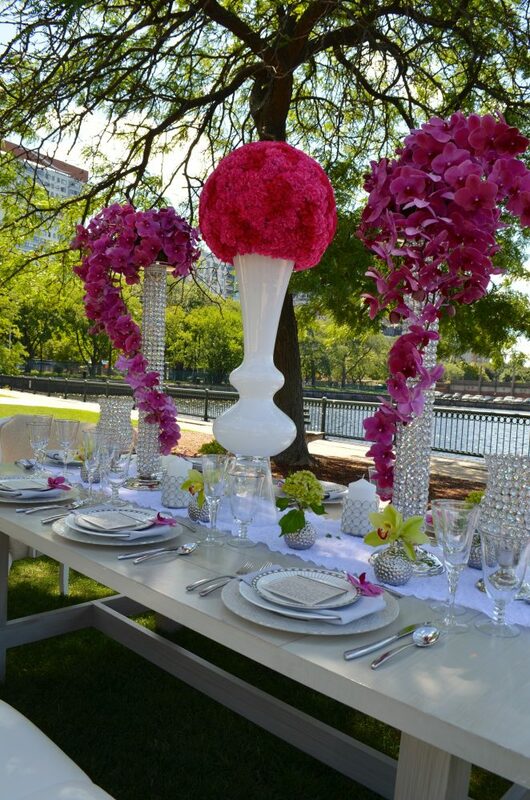 How we present each piece for your event considers the sun, the temperature, the venue and other outside conditions. 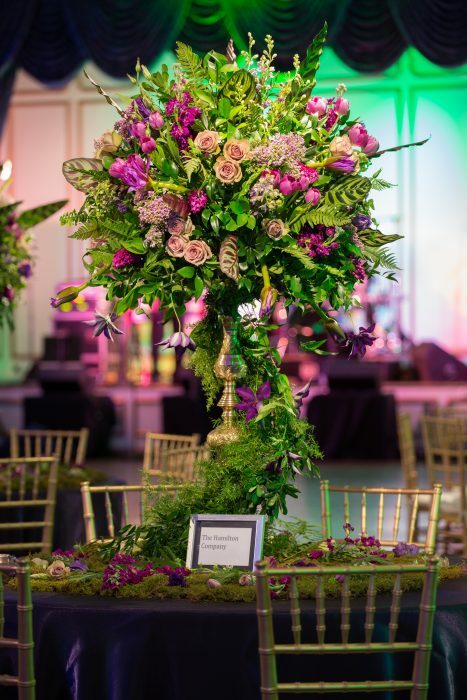 Once your design and color schemes have been determined, we then begin our search for the flowers and greens that will work best in the environment of your event. We recommend that our clients keep an open mind especially during these summer months and trust that we understand their vision and will create pieces that will work best within their design scheme as well as for the time of year. 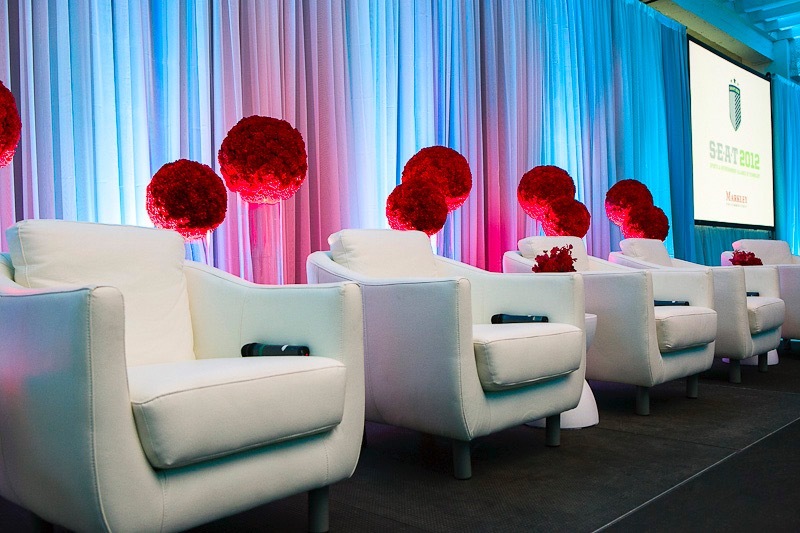 Having so many options at our fingertips makes it easy to meet and exceed the expectations of our clients. 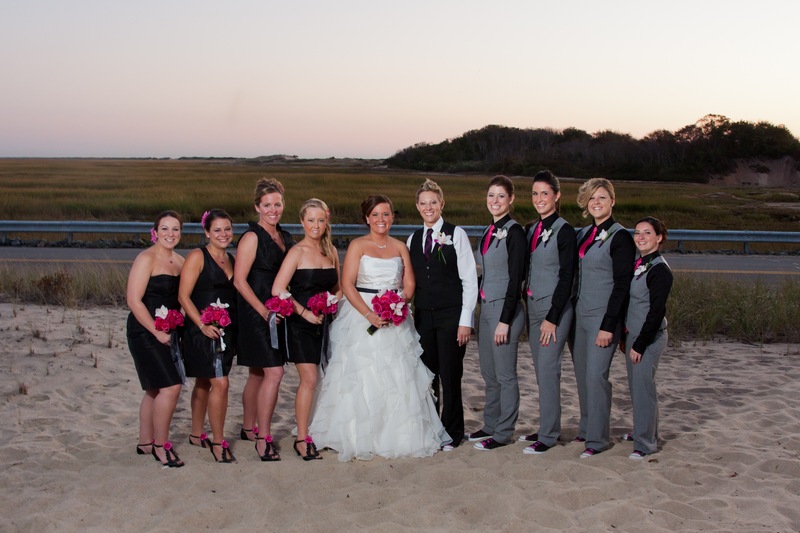 A seaside wedding doesn’t always need to be that assumed casual celebration. 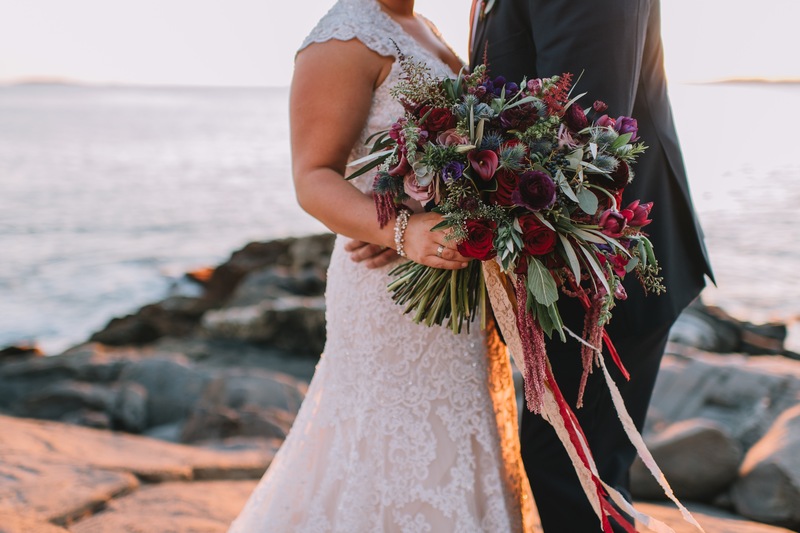 The seashore may seem like the natural choice for a casual beach wedding but if elegant is more your style, a beach wedding can still be a stunningly beautiful option. 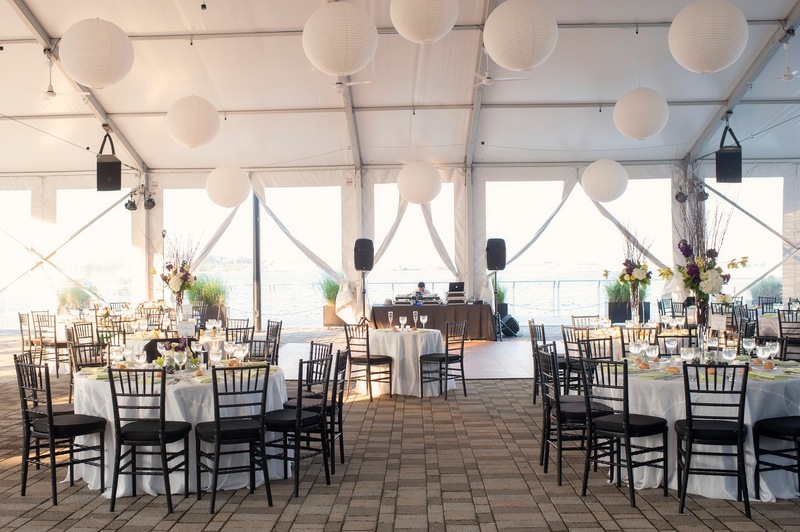 There are so many incredibly elegant venues in New England along the shoreline as well as lovely spaces that a dazzling sprawling tent may be the sophisticated option to an unforgettable affair. 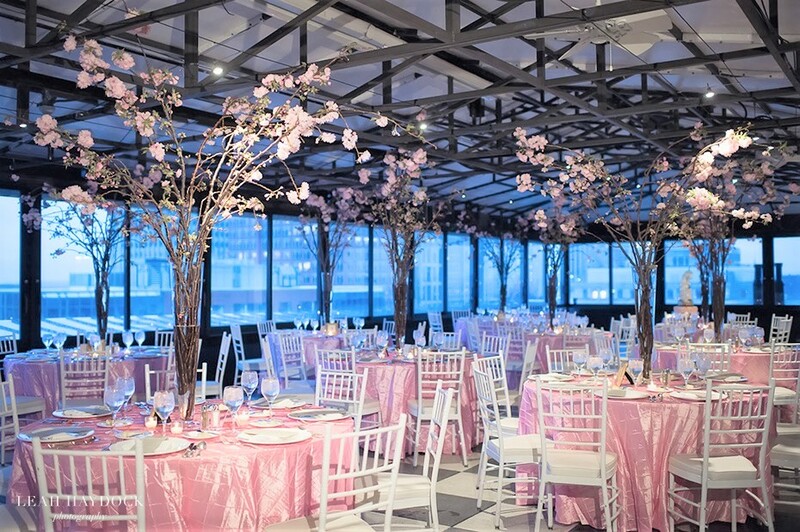 With incredible views of Boston’s historic harbor and skyline, the New England Aquarium is a wonderful & unique option for hosting your wedding reception on the water. 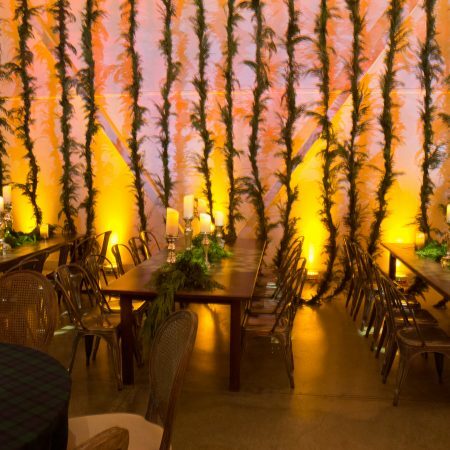 They offer many exclusive areas within the aquarium to host your event, one of which is sure to match your wedding style. 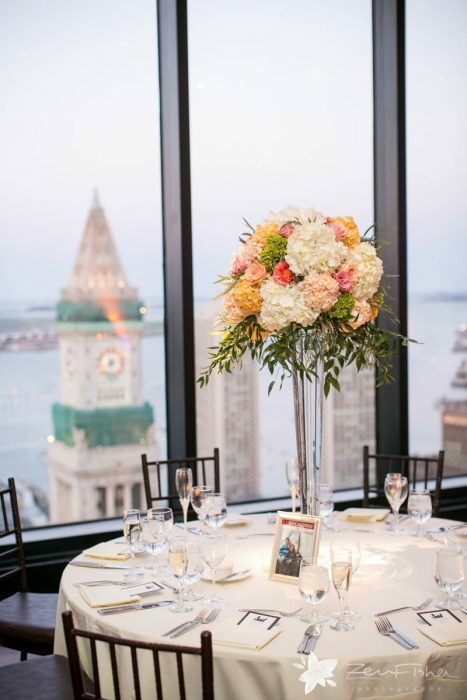 The Boston Harbor Hotel is one of the most elegant venues along Boston’s waterfront. 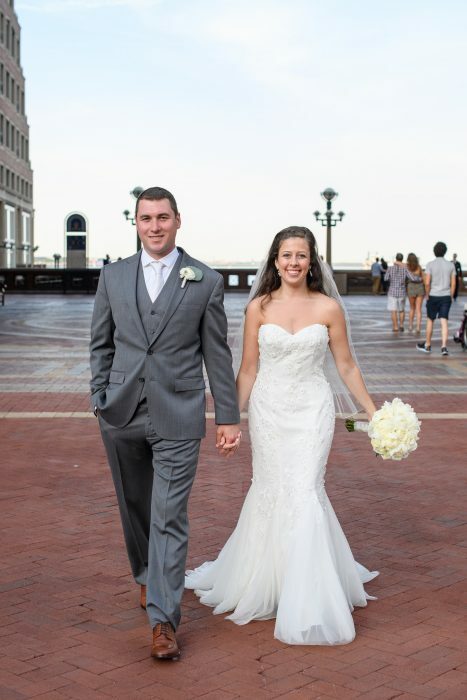 No matter what size or style your wedding is, the Boston Harbor Hotel, overlooking the gorgeous Boston Harbor, has a stunning option for you. 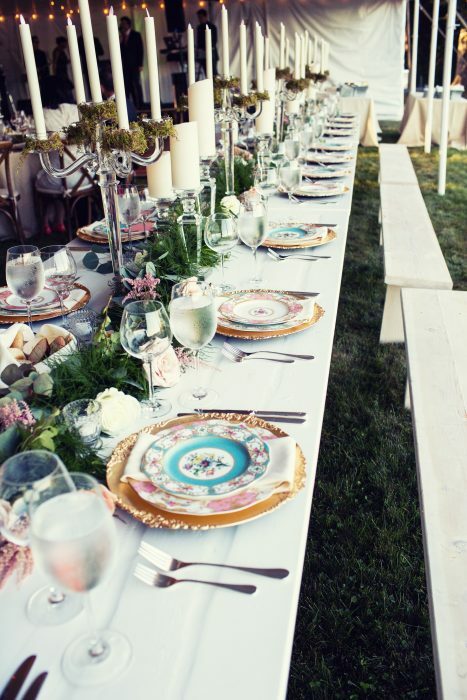 Moving north of the city you will find more incredible options for hosting a stylish beach wedding. 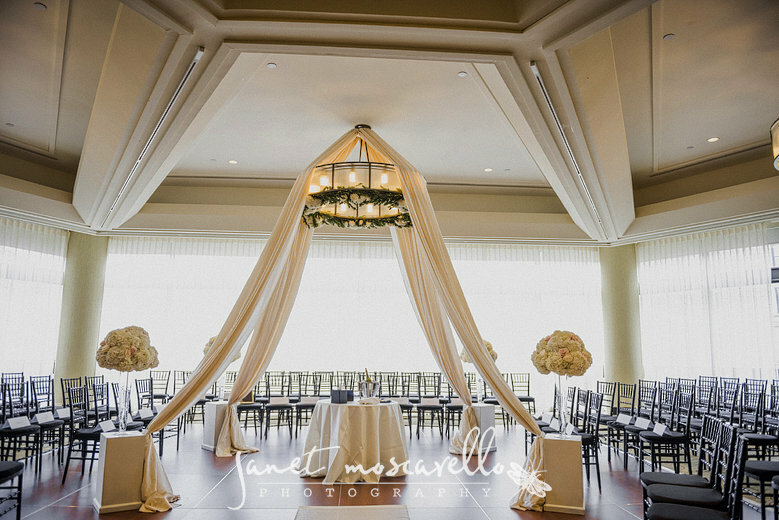 Misselwood at Endicott College on Massachusetts North Shore offers a striking setting for both your ceremony and reception. 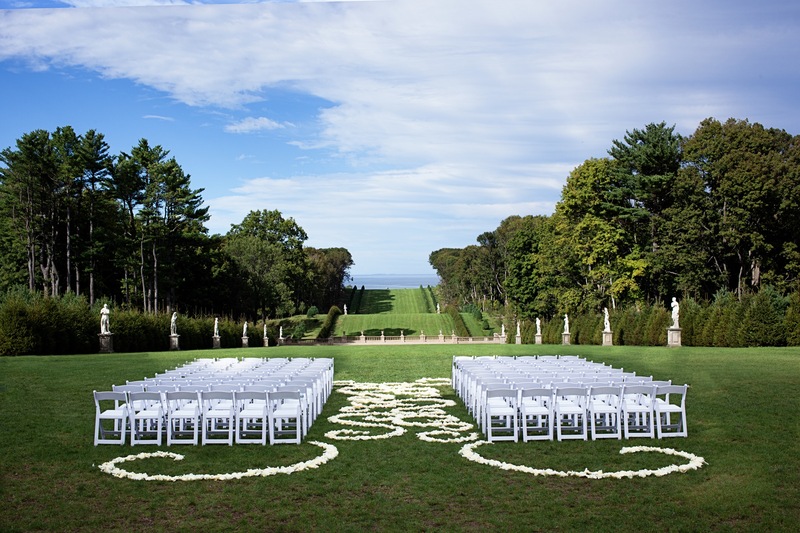 With over 235 landscaped acres, direct access to three private beaches and just 20 miles from Boston, this is a spectacular location to host your elegant beach wedding. 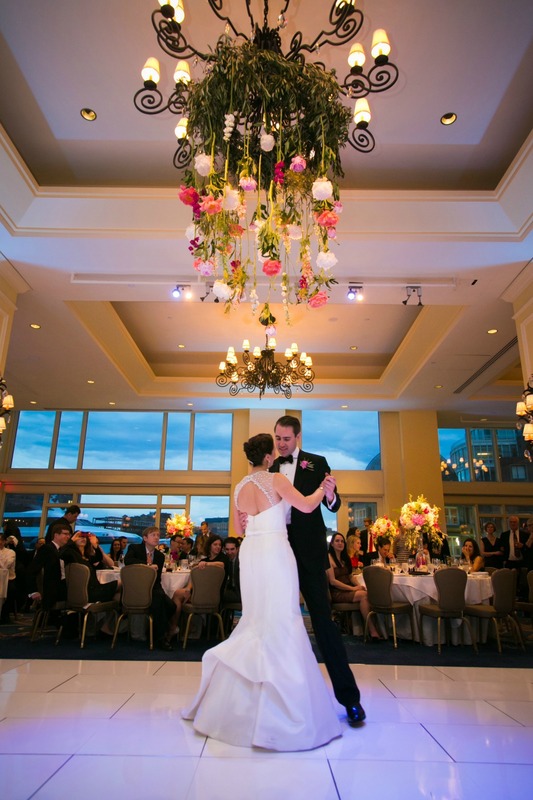 Beauport Hotel Gloucester is the quintessential New England coastal location to celebrate your upcoming nuptials. 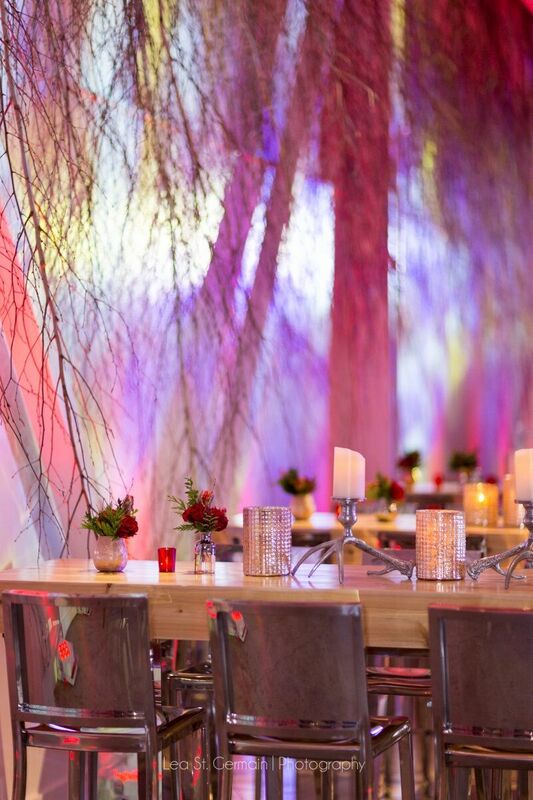 With four lovely event spaces that will only host one wedding at a time, your day is as special to them as it is to you and your guests. 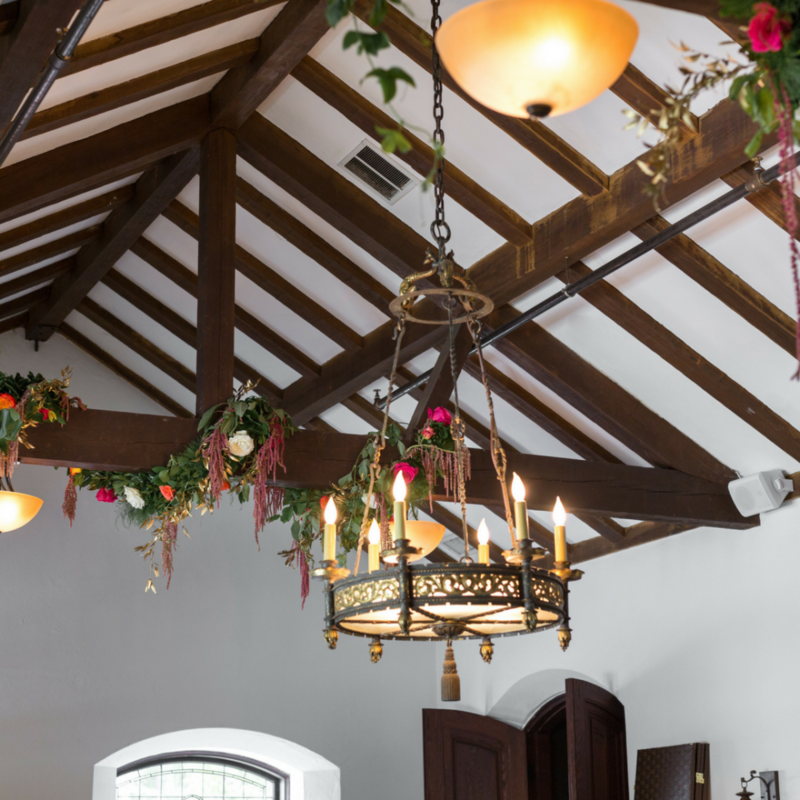 The Crane Estate is one of those truly unforgettable locations that transports you back in time. 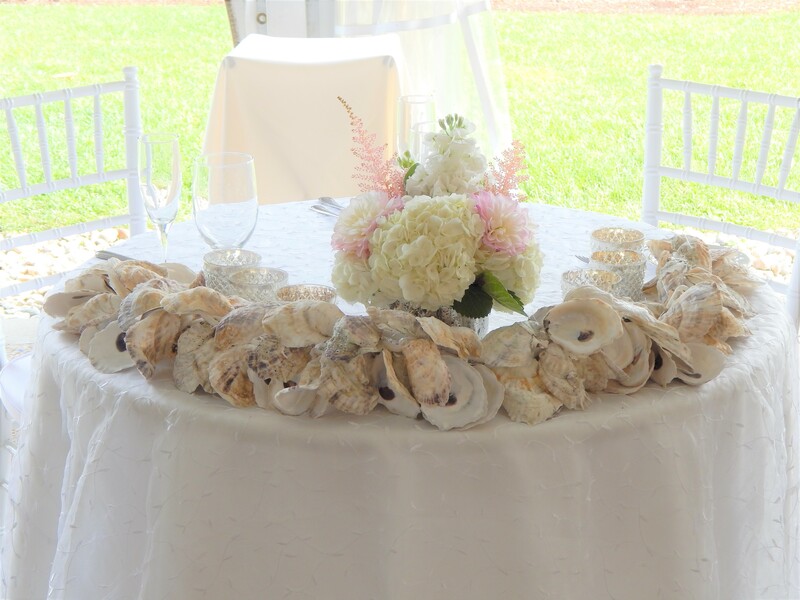 No matter what location on the estate you choose, the elegance and grace of the Crane Estate will absolutely make a huge impression on you and your guests with its windswept salt marsh, miles of barrier beach, and grand hilltop mansion. Continuing to travel up the coast, we have to mention the Newagen Seaside Inn along the impressive seacoast of Maine. 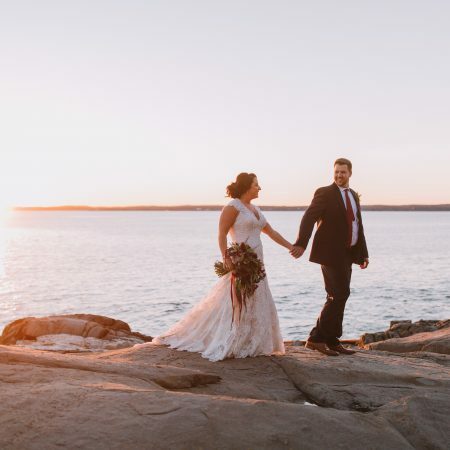 With over 20 secluded acres of oceanfront, an historic inn, an oceanfront restaurant and a waterfront resort all just minutes from Boothbay Harbor-this may be your dream location for your beach wedding. Traveling south of Boston along the coast there are many other luxurious locations that must be mentioned including Provincetown and the beautiful islands of Martha’s Vineyard & Nantucket. A bit more south in Rhode Island there is the spectacular OceanCliff Resort. Set along the breathtaking Narragansett Bay, OceanCliff offers a variety of wedding and reception options. 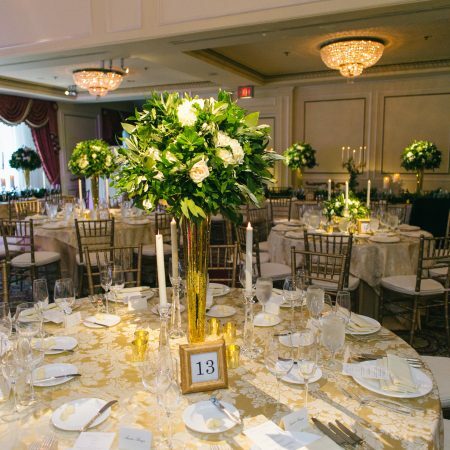 Pristine rolling lawns for your ceremony, an adjoining outdoor patio for your cocktail reception and a magnificent Grand Ballroom for your reception with panoramic views of the Atlantic. Last on our stop is the historic Point Pleasant Inn located in Bristol Rhode Island. 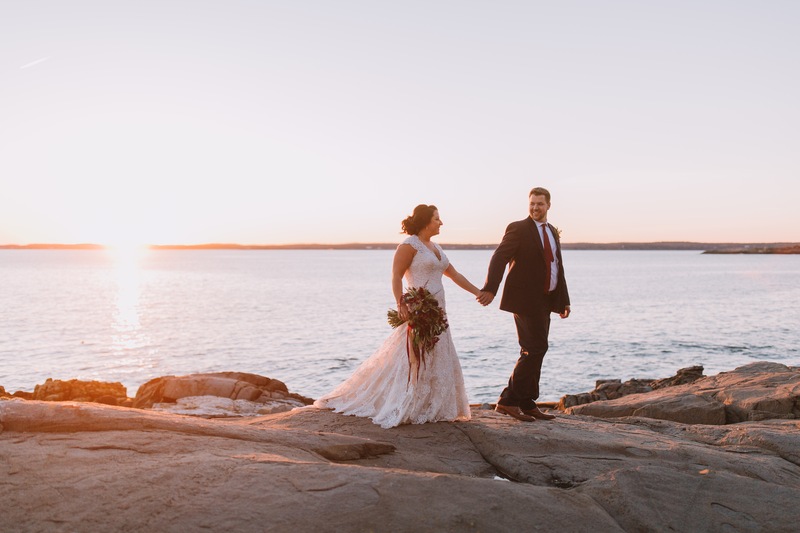 This incredible location, surrounded by Narragansett Bay on Bristol Harbor, is set on 25 glorious acres of grounds making this a charming location for your romantic beach wedding. 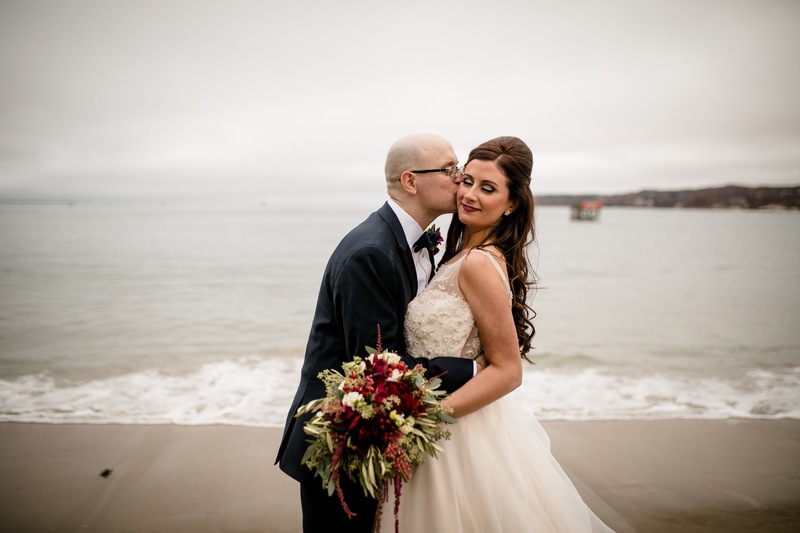 So whether your style is simple & laid-back, rustic & chic or elegant & sophisticated, a New England beach wedding is definitely the option that has the style and grace to be the place to start your new life together. 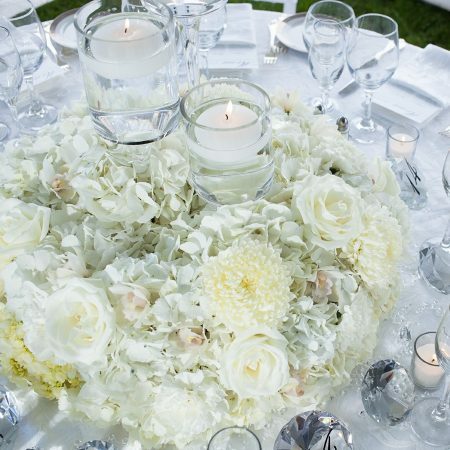 Your wedding centerpiece will be one of the details of wedding planning that will receive a lot of attention. 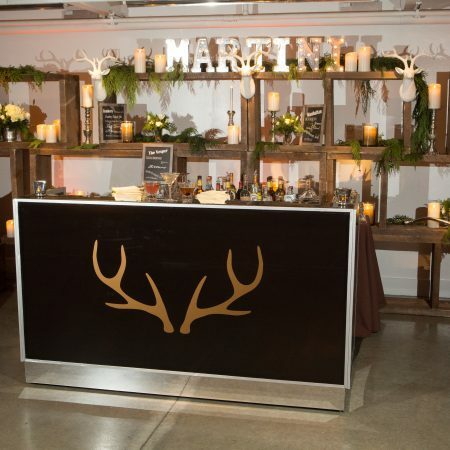 Much will go into the planning of this important element of your wedding décor. 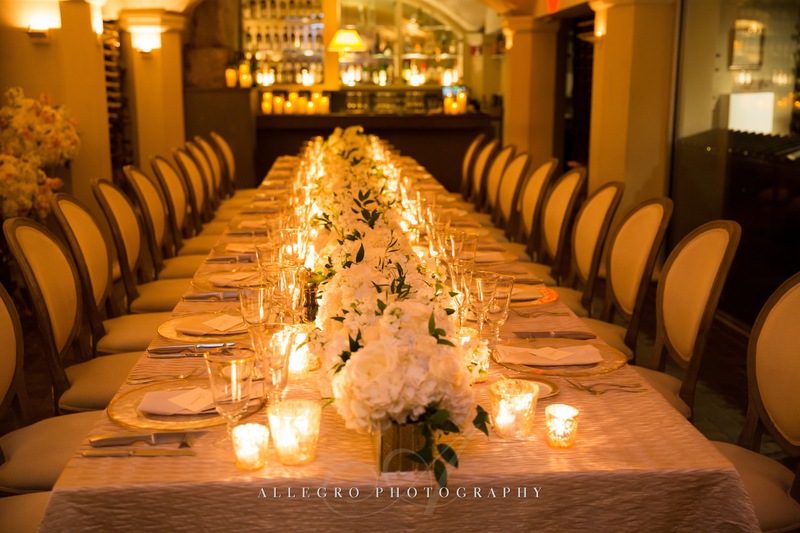 If having a seated dinner, it tends to be the largest element on the guest tables. It will be eye-catching-no matter what. 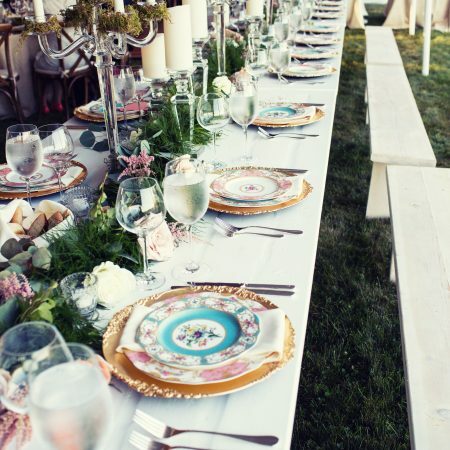 It will also be the topic of conversation, whether good or bad, especially if guests are just getting to know each other. Hopefully it will add to the conversation, not hinder it. 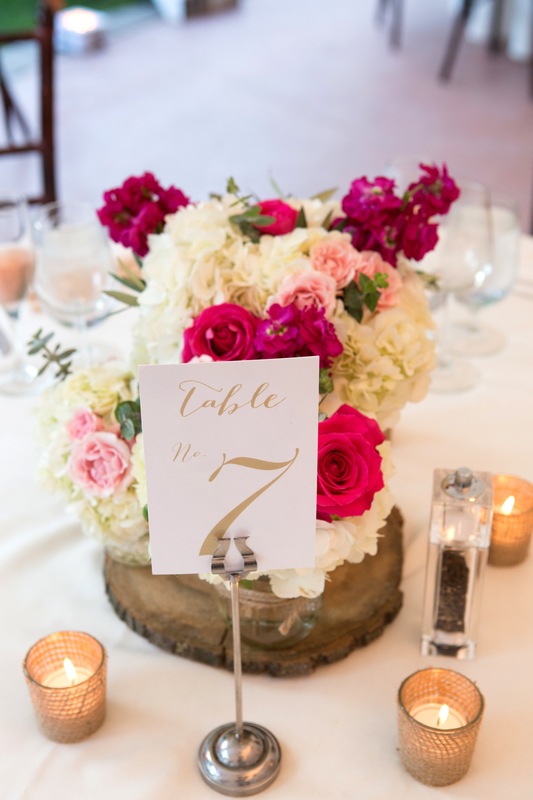 The table shape and size will be one of the main determinates of your floral centerpiece but the style of your wedding or event will be the defining factor. 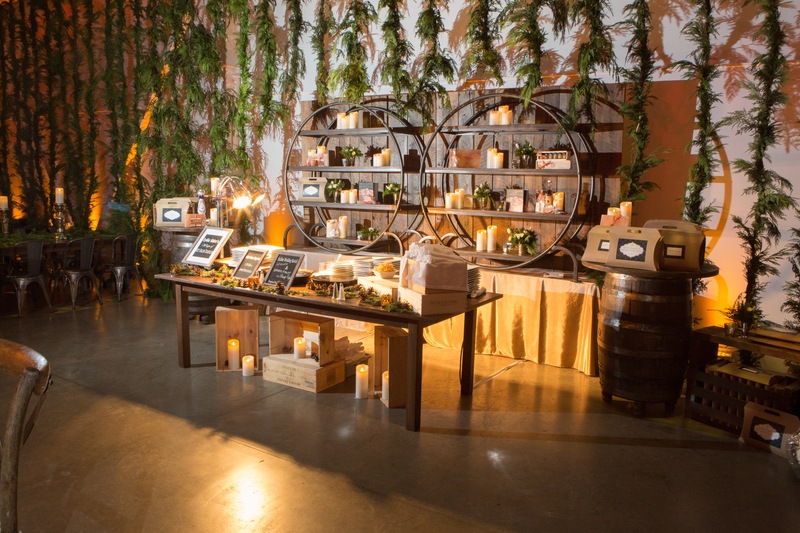 Inspired by nature with an emphasis on raw elements; earth colored tones & textures and more simplistic in style. 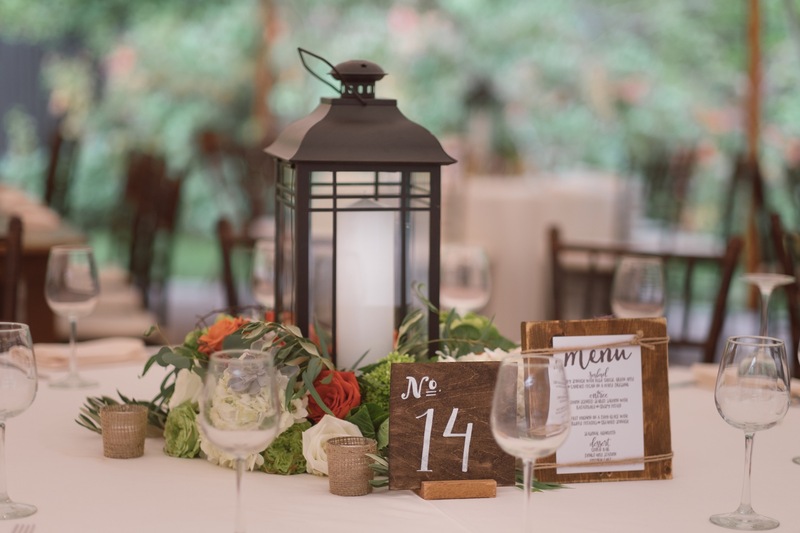 This style of centerpiece will typically be used if having an outdoor wedding or a reception site that is rustic in style. 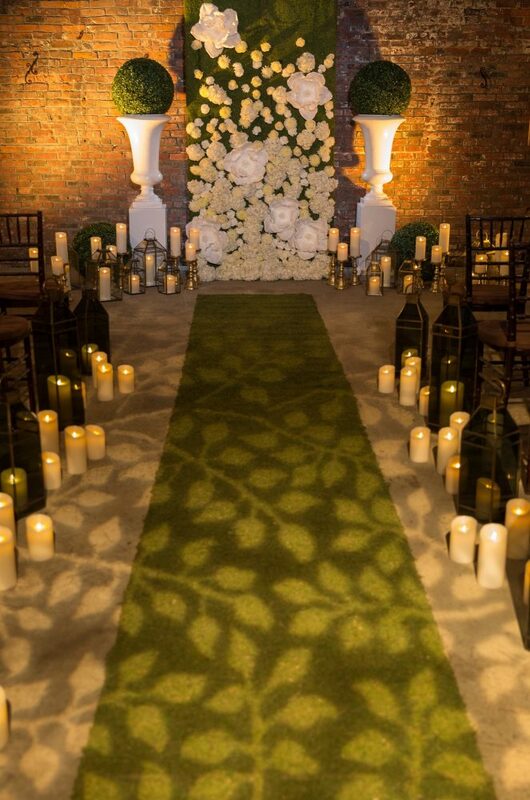 Wood, stone, moss, natural flowy greens & branches will enhance this style of wedding. 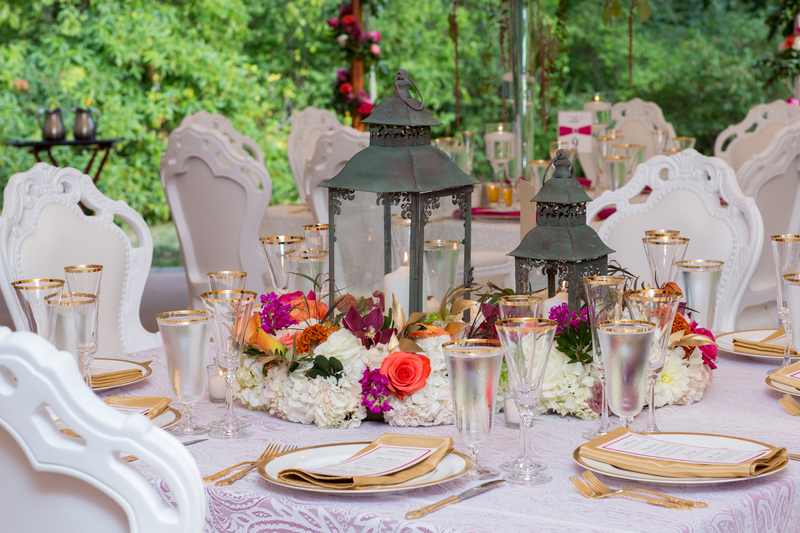 Colors are more subdued-greens, browns, white & ivory with any additional colors being muted in tone. 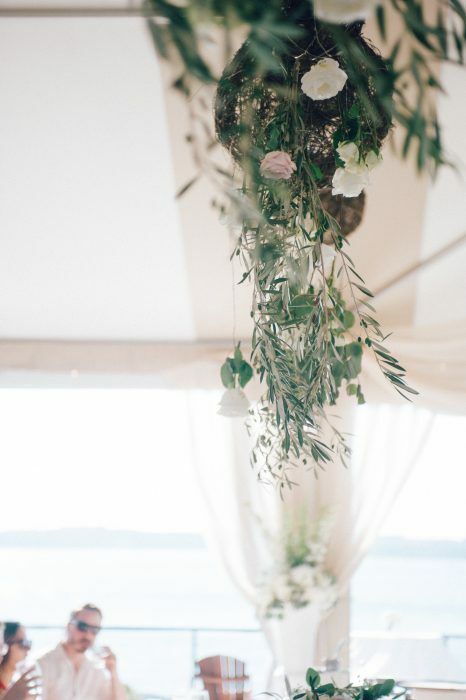 All varieties of eucalyptus, greens that you would see in nature – olive greens, sword fern, flat fern, moss as well as curly willow, birch bark, birch logs, slaps of wood, branch material and pods in all shapes & sizes. 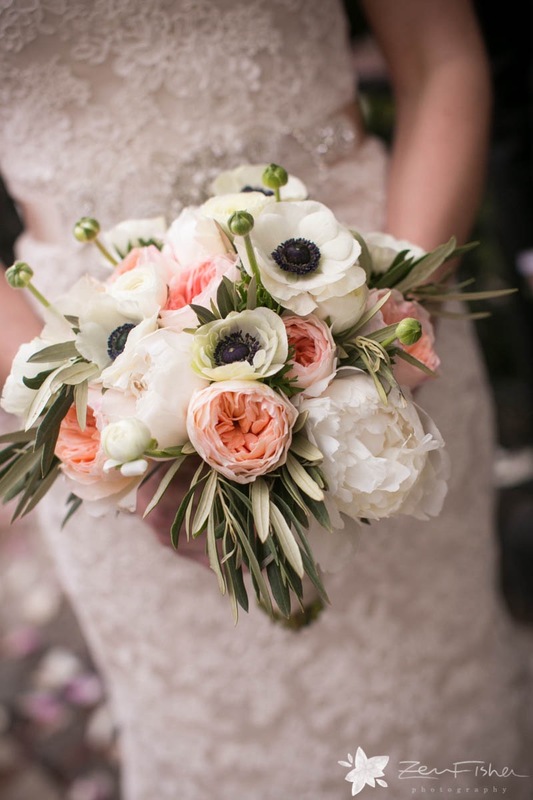 Dahlias, hydrangeas, succulents, wheat, grasses, scaobsia, lavender, and peonies are flower varietals that work beautifully with this style. Vessels usually have more texture, like bark or moss and some metals that have a brushed look to them. 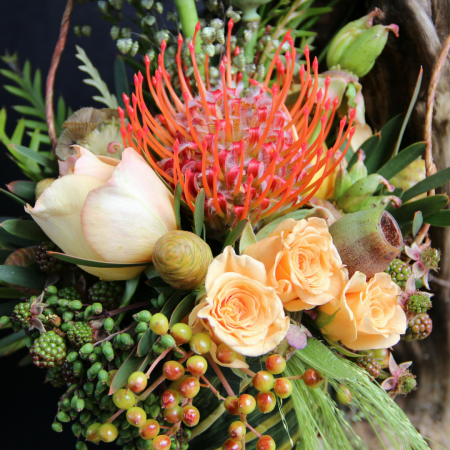 Flowers are placed in a random arrangement with an emphasis on how things flow & fall…unstructured shape with an emphasis again on texture. 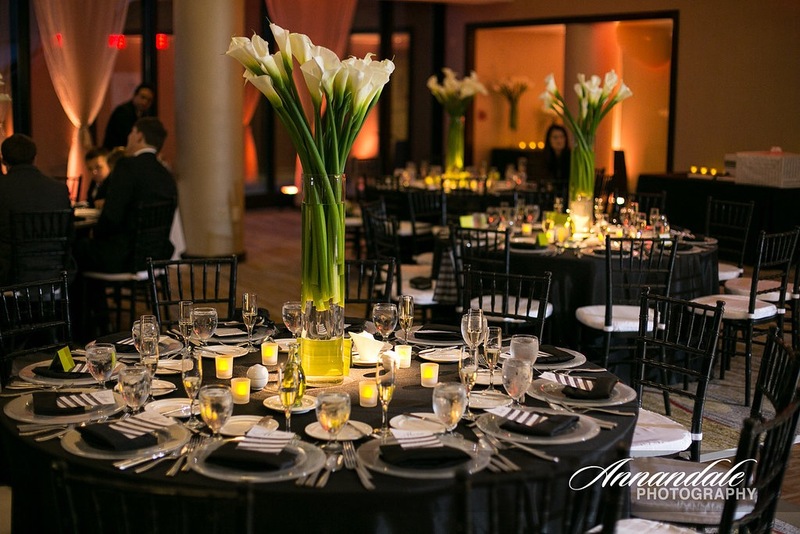 A timeless elegance and a glamorous but simple gracefulness in style. A bit more structure to the arrangement. 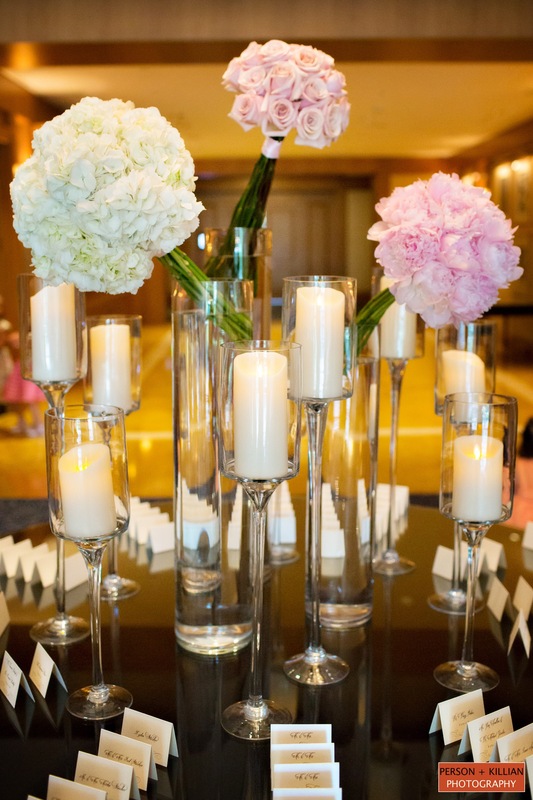 Florals consist of those beautiful old fashioned blooms that are always in style-hydrangea, roses, tulips & peonies. 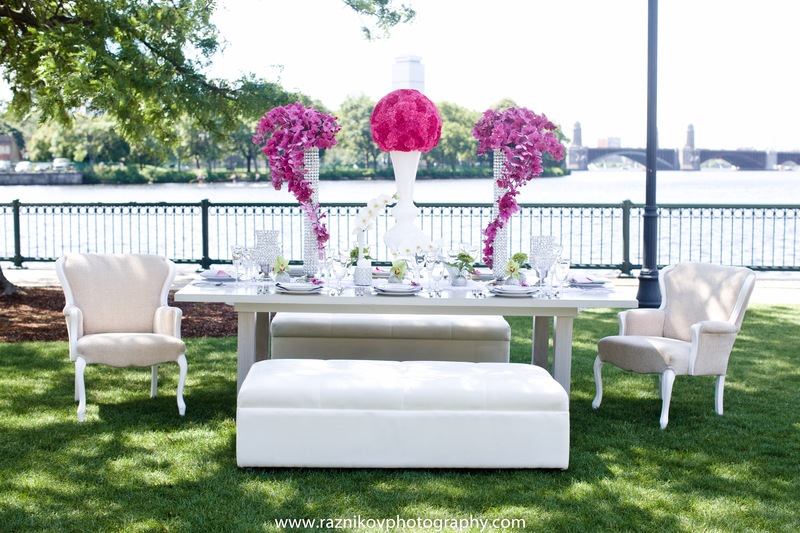 Color schemes typically fall into the softer shades of pink, blush, ivory and white. But you may find brilliant reds or strong pinks as well. Containers will have structure to them and tend to be glass or metal with an urn shape style. 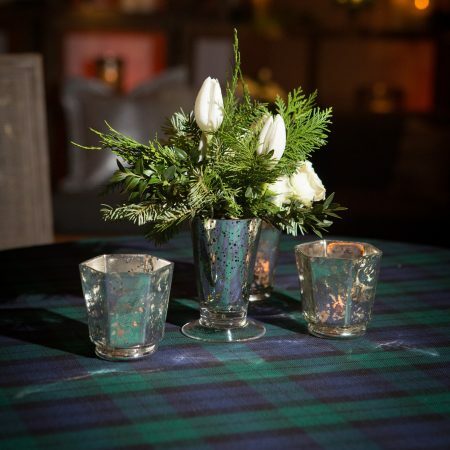 Clear glass typically is the vessel of choice but also mercury glass, footed bowls and urns along with some metallics. 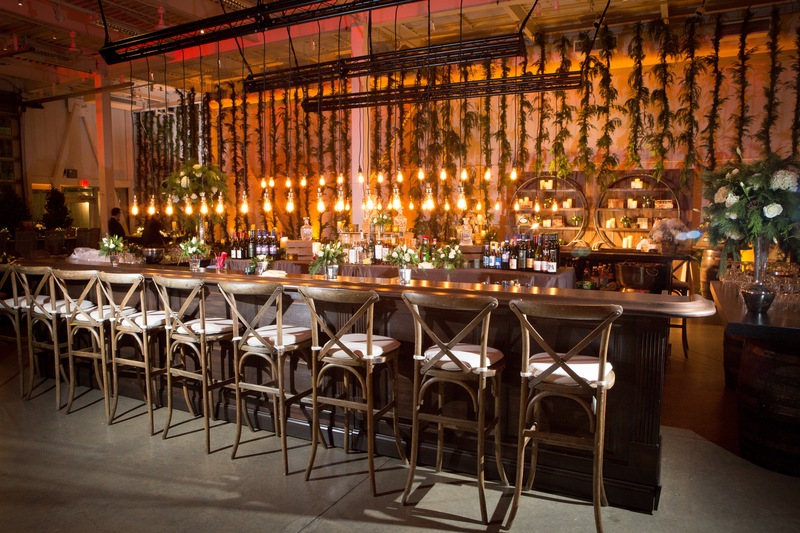 A wedding with a venue that is either simple or artistic in nature may have you wanting to move in the direction of a modern feel for décor. 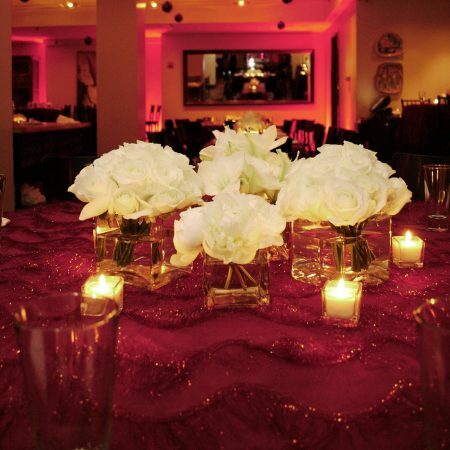 An emphasis on the dramatic and chic are the essence of this style. 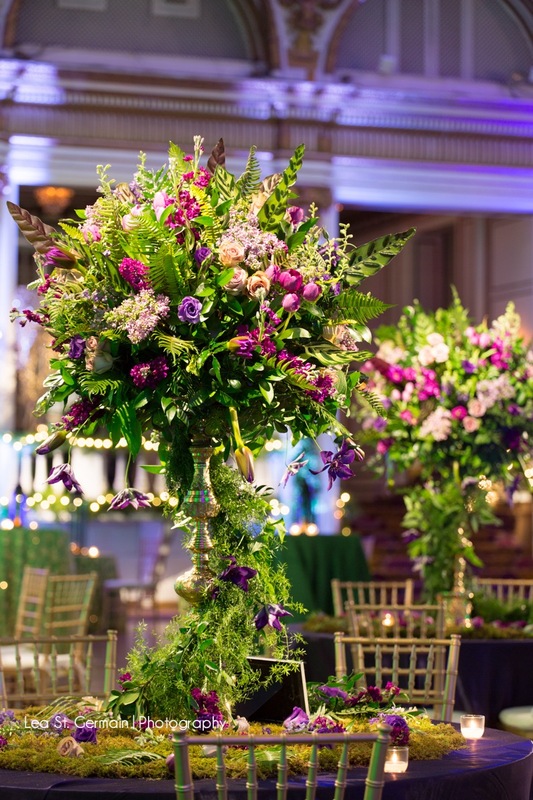 Deep rich colors or bright vivid colors are the hallmark of this look with very little greens and usually a big focus on arrangement of the blooms. 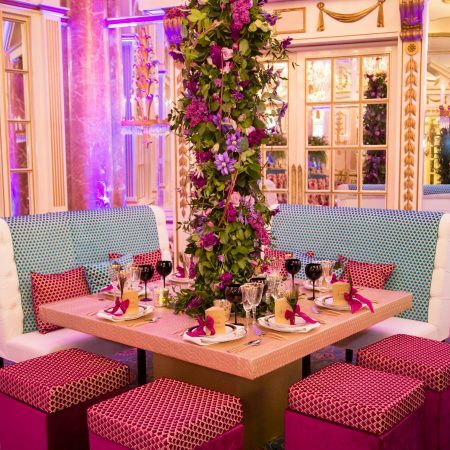 Repetition of blooms or colors at varying heights makes a huge statement. 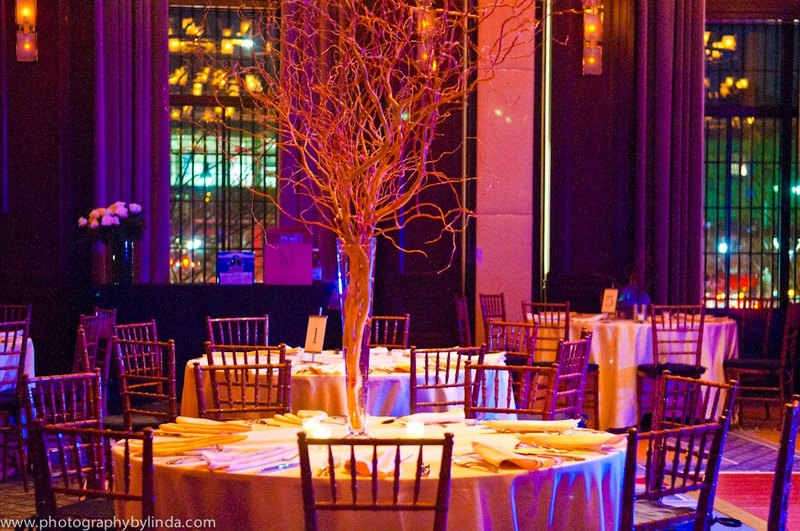 Couples may choose a dramatic large scale branch or leaf for a minimalist effect with no flowers or just a single bloom. Vessels that are square or rectangular in shape with sleek lines and various heights will add to the dramatic effect of this look. Black & white and clear glass & metallics are usually chosen for color and material. 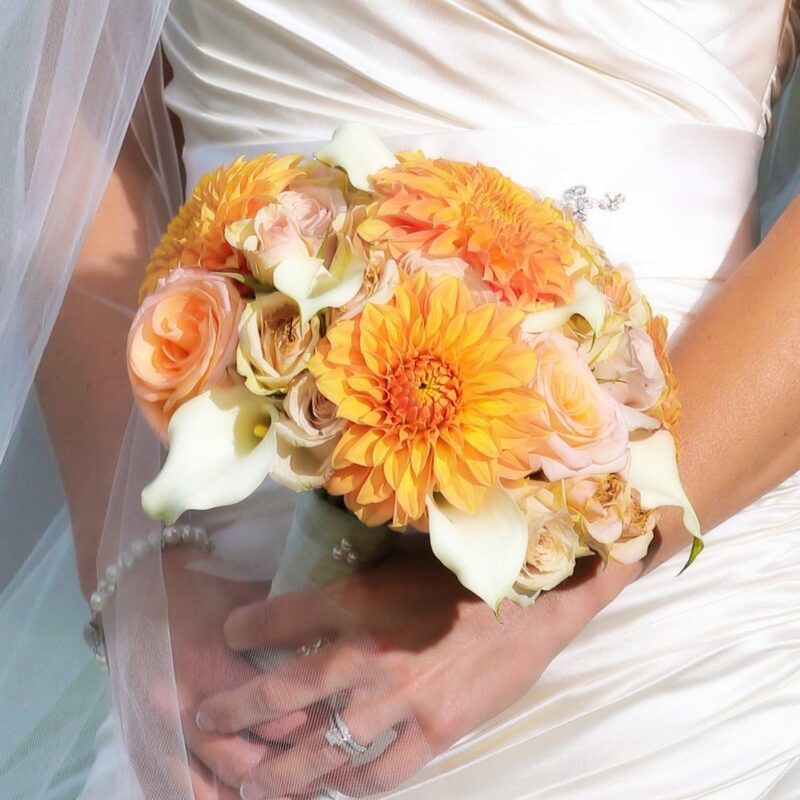 Your bridal bouquet will play a major role in the most important day of your life, your wedding. 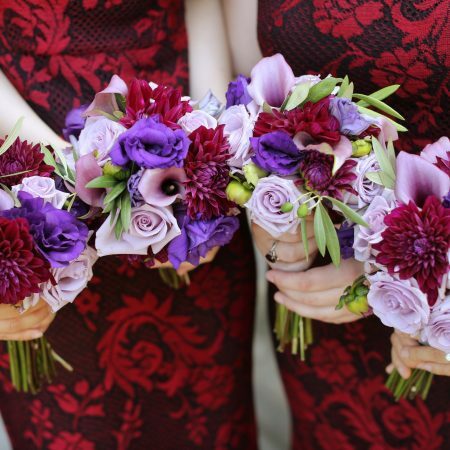 The style, design, and colorway of your bouquet is a big decision, but should not be an overwhelming one. 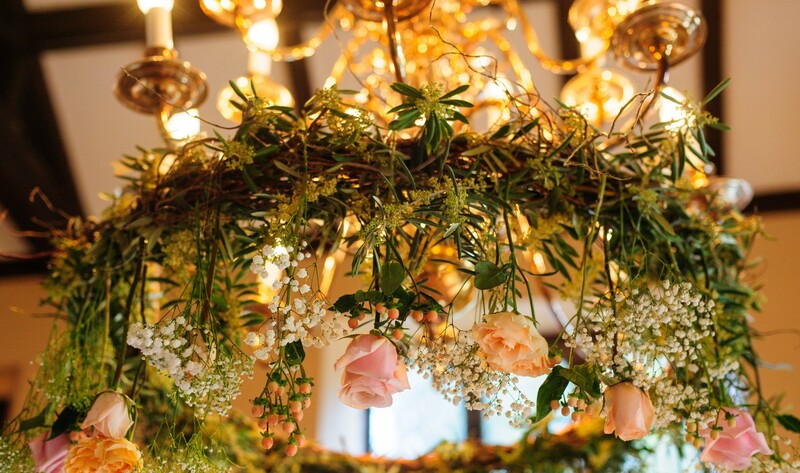 Here are some things to keep in mind when planning for the most important floral element in your wedding. 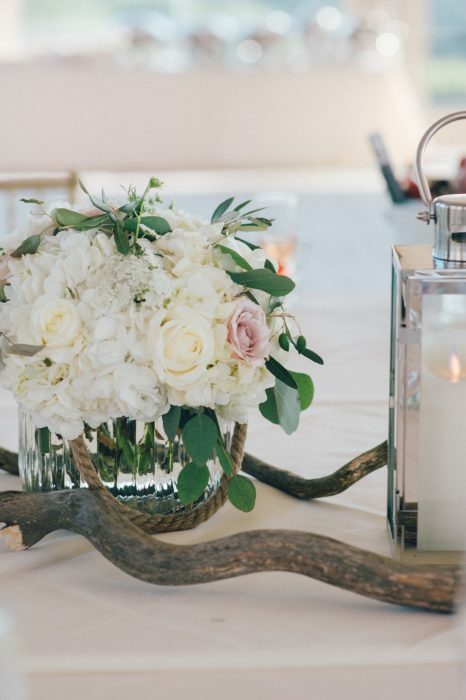 Your bouquet should be in keeping with the overall vision of the entire day. 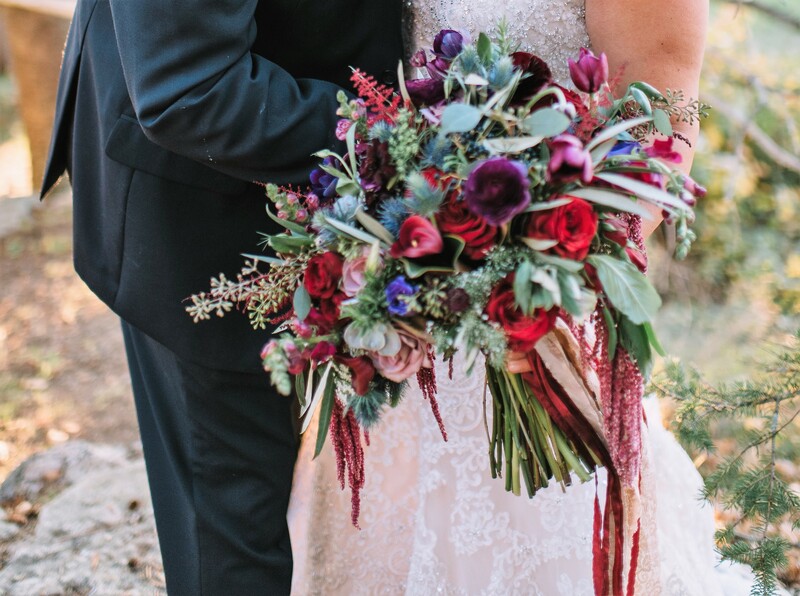 Your wedding style, the space and the time of year should determine the direction you should go in with your florals-including your wedding bouquet. 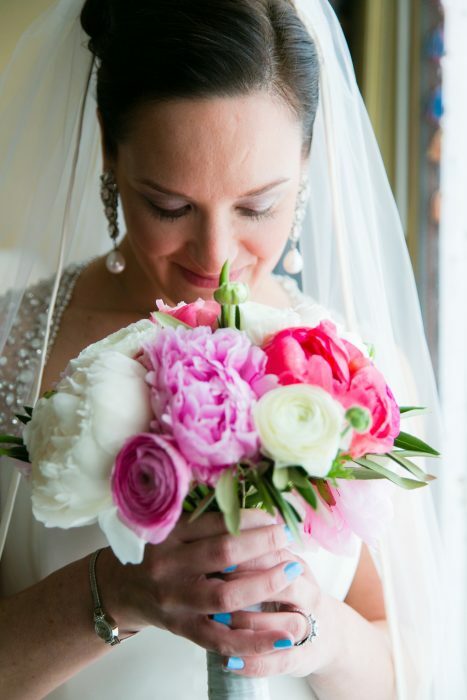 The color & style of your wedding dress will guide the direction of the color & style of your bouquet. 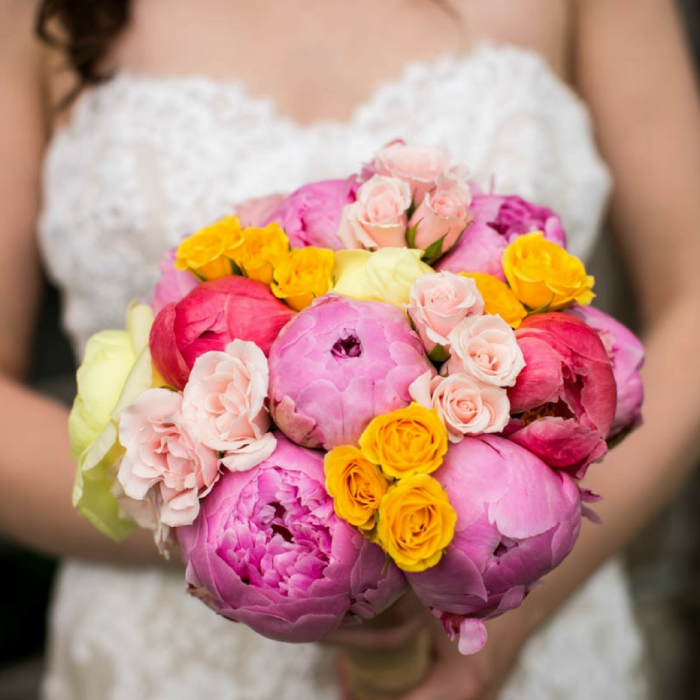 The true color of your dress as well as the cut & style will determine the style direction that is best to go in with your flowers. 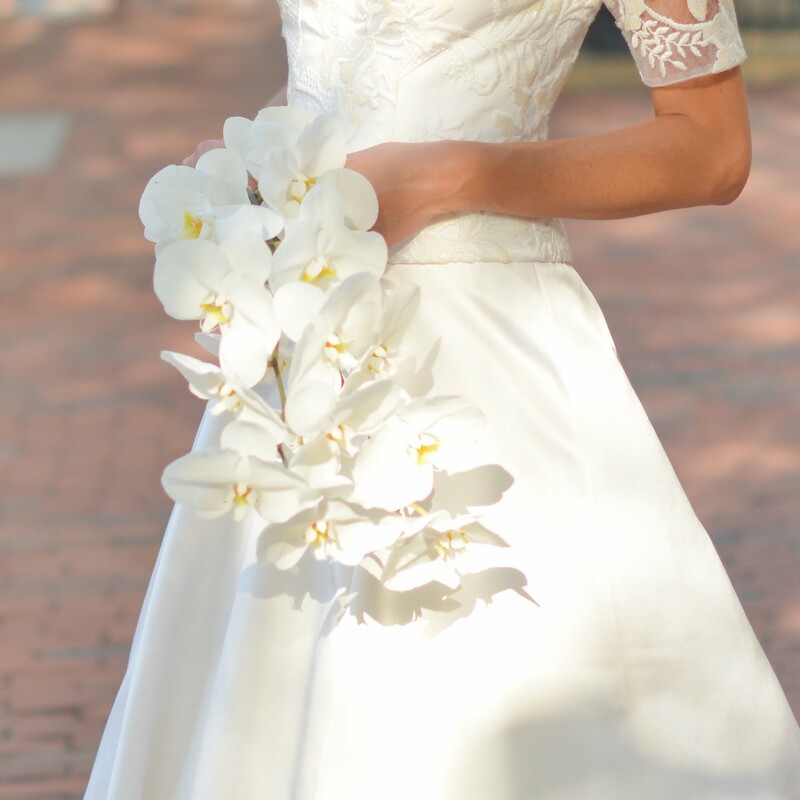 A long, flowy & romantic dress will have flowers that will be softer & cascading while a more modern dress would have a tighter, crisper silhouette. 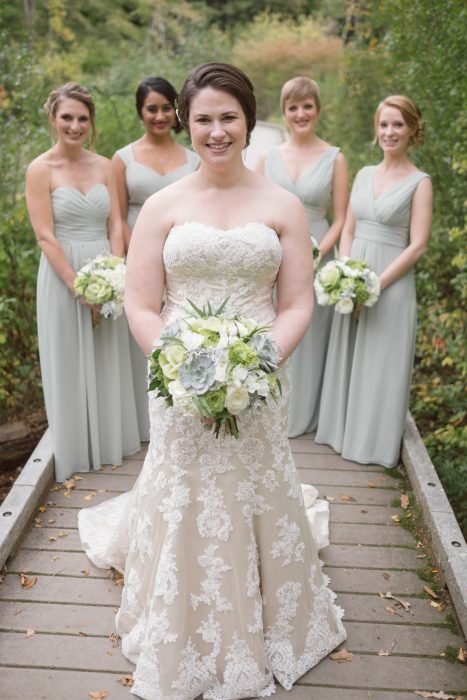 Keep in mind your dress will be the backdrop of your bouquet for all your pictures. Know what flowers will be in season. 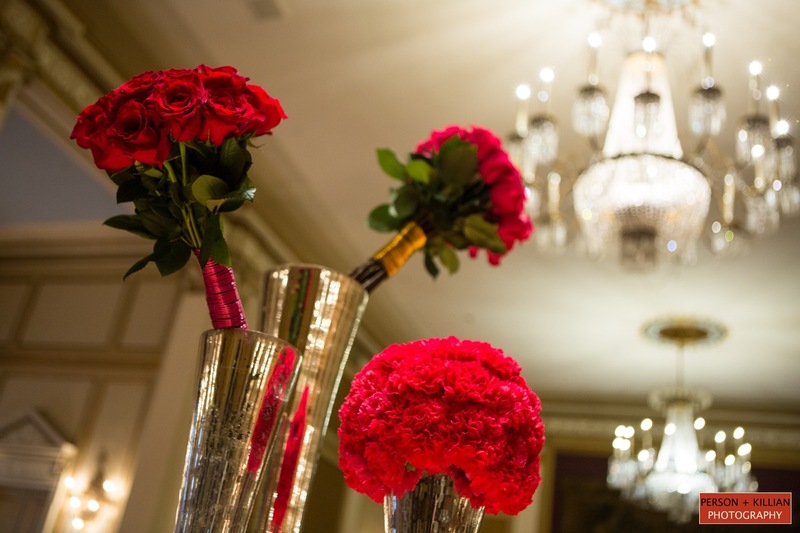 Discussing what flowers are readily available during that time of year can open up so many more options for you and will help to stay within your budget. Know your budget. 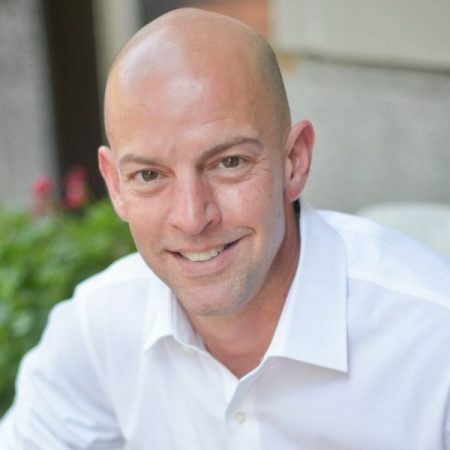 As you have read before, being clear and upfront about your budget will allow us to help you determine the best areas to focus on to create the effect you are going for. 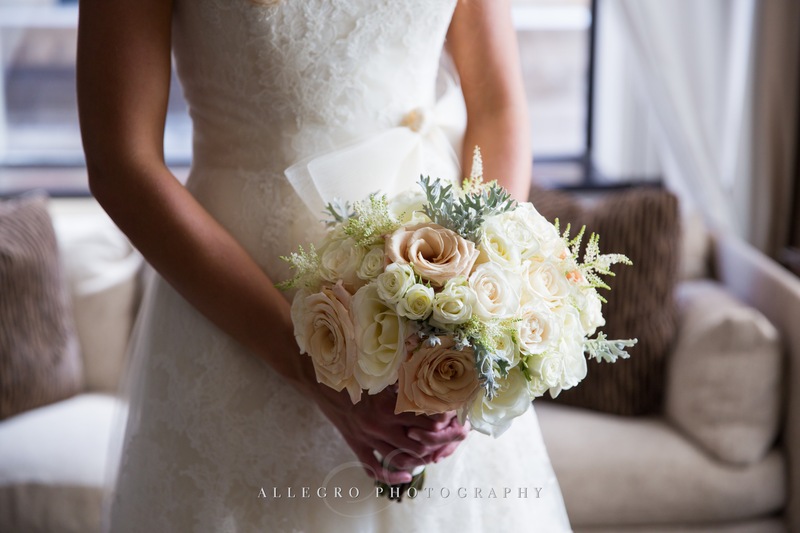 With that being said, the bridal bouquet is the most important element floral wise as it will be in more images than any other floral design and we like to say do not hold back on your bridal bouquet get what you want as these images will sit on your mantle, nightstand, parents house and future in-laws house for many years to come. 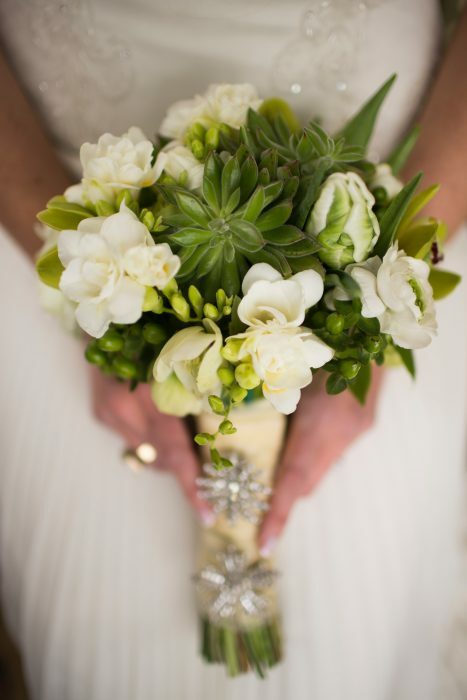 You can add something personal & meaningful to your bouquet. 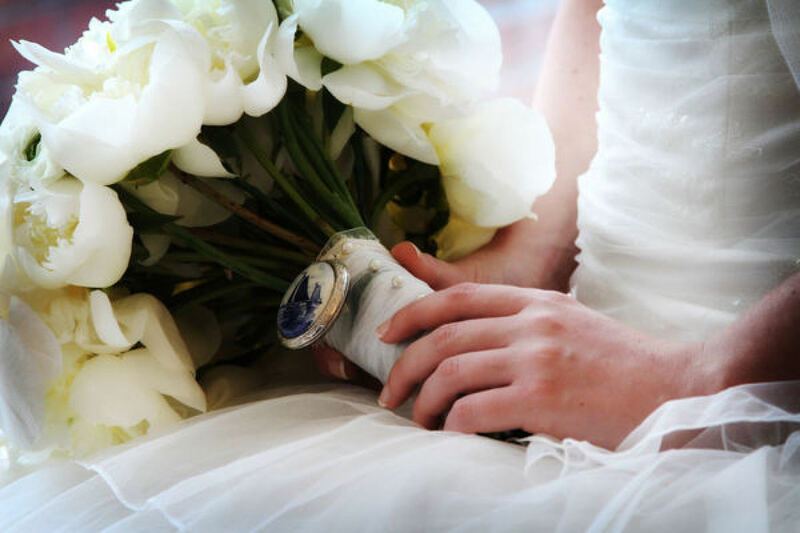 Adding a special piece of jewelry, piece of fabric or small memento to your bouquet can add that special meaningful touch. But, don’t go overboard here. 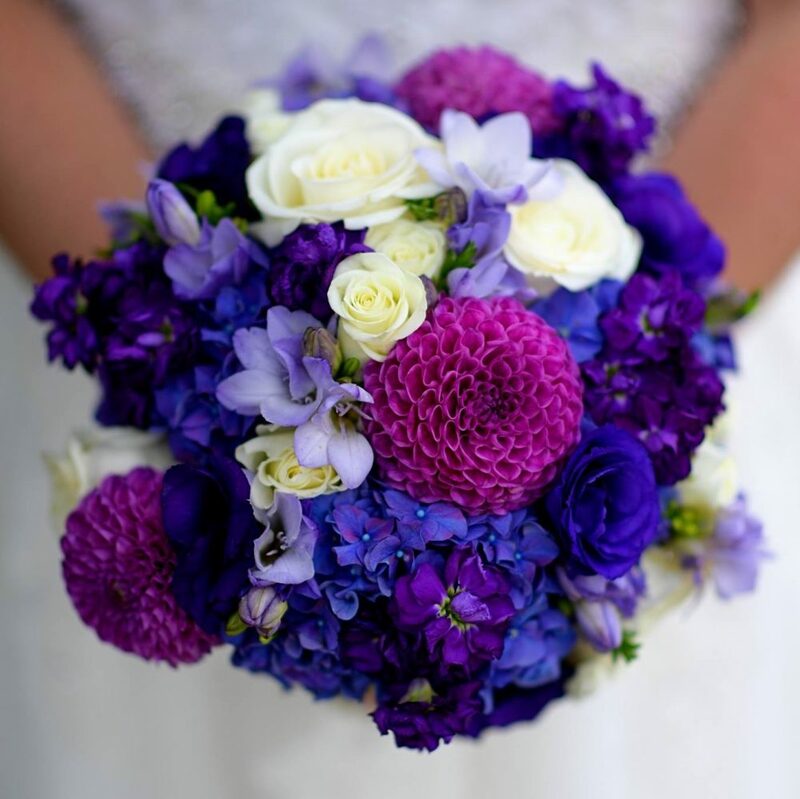 Your bouquet will be photographed as much as you will be, so you want it to compliment your style, not distract from it. 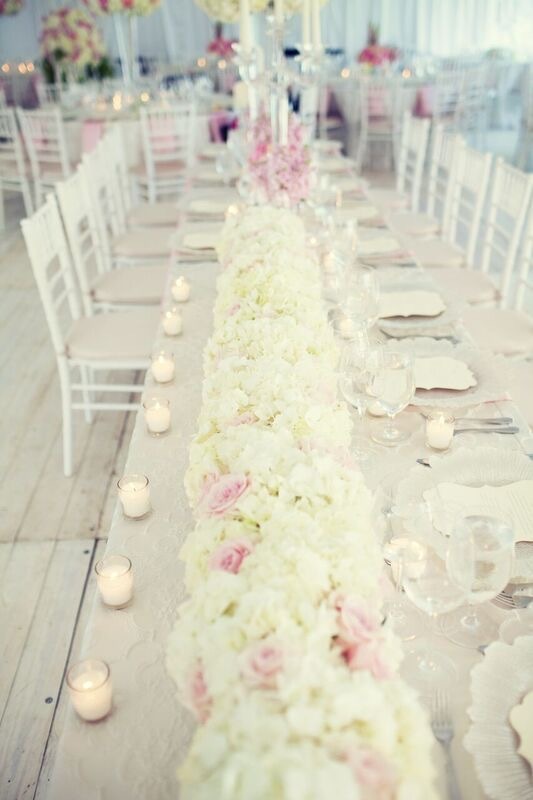 Inspiration-wedding magazines, blogs, Pinterest-will help in determining style options. Looking through your photographs that you provide us really does help us to understand and what inspires you. 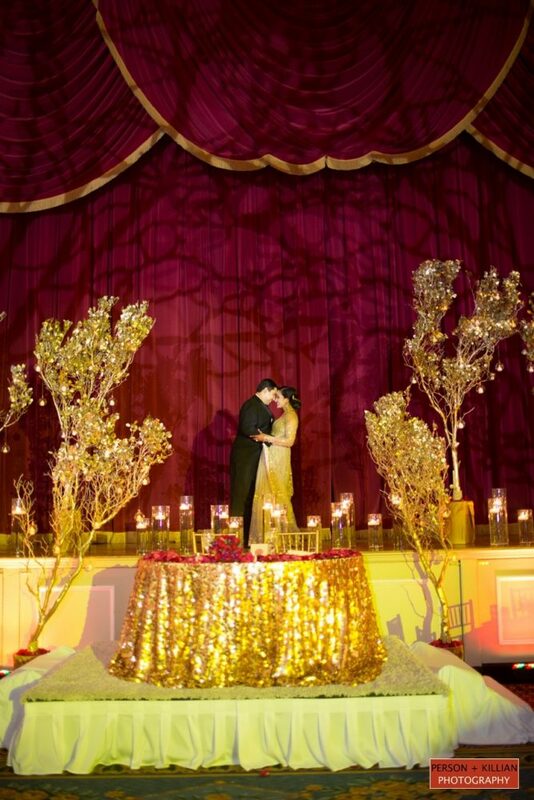 We will gain a wonderful sense of the style, color and feel of your dream wedding. 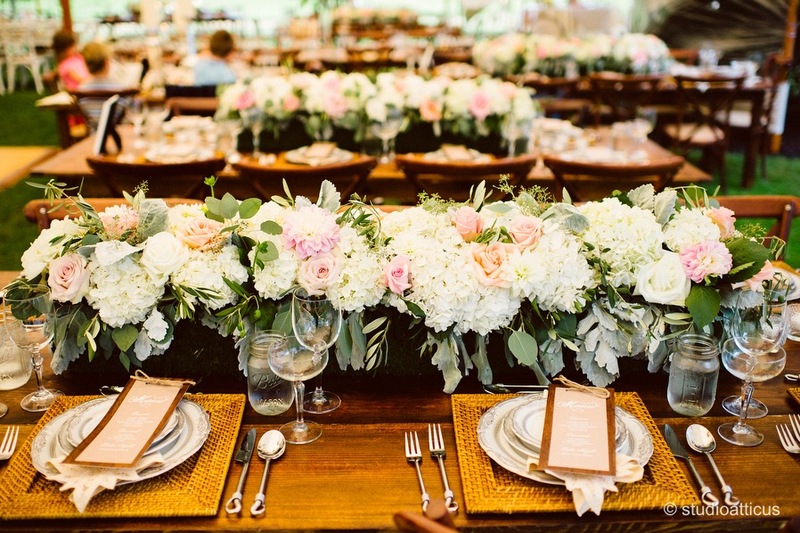 Wedding Planning: 10 Tips for meeting with your floral designer for the first time. 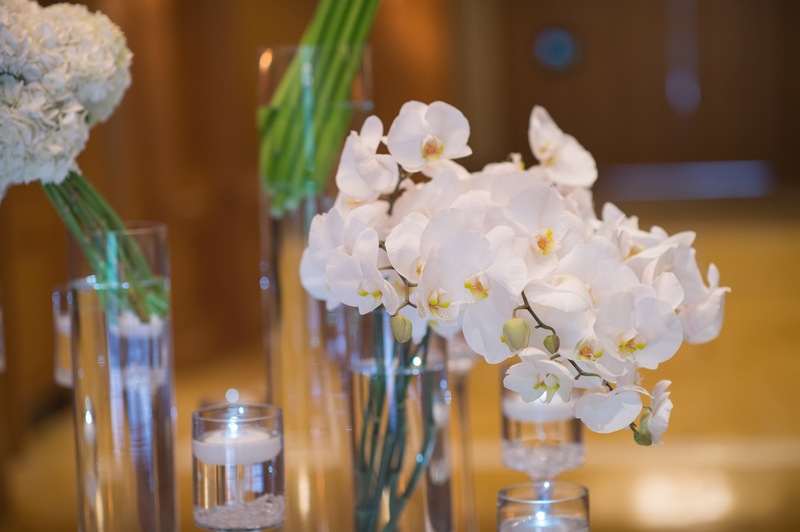 This is the time of year that we have the wonderful pleasure of meeting with our couples for the first time to begin discussing the plans for their upcoming wedding. It is an exciting time in their lives-they are filled with high expectations, incredible vision and boundless energy. But, there is nothing more disheartening for us all than discovering that their expectation may not be able to be met due to budget constraints, unrealistic assumptions or just not being open the advice & knowledge you have about the planning process. 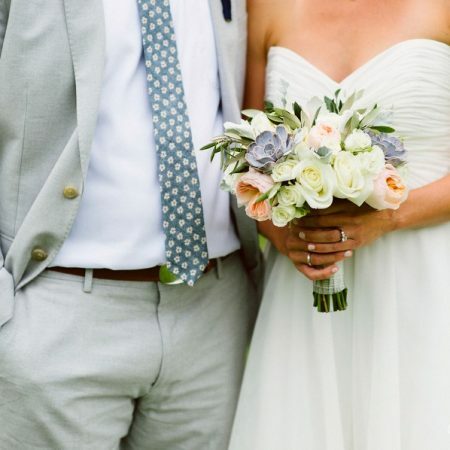 So, we decided to create a set of tips to assist brides & grooms in being a bit more prepared for this first big meeting and set us on a course of success. 1. Don’t get your heart set on a particular bloom. 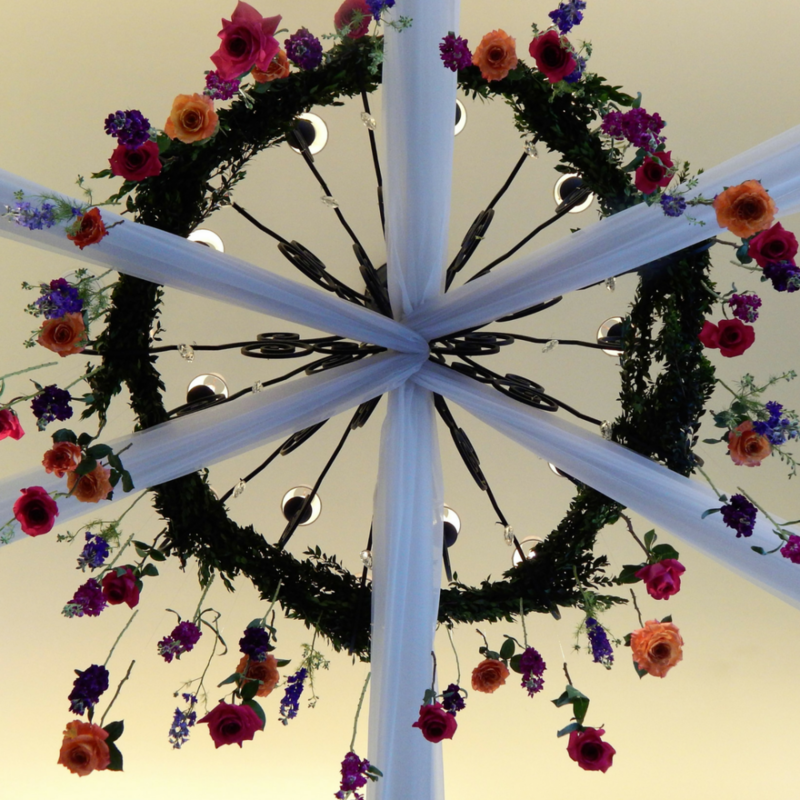 Letting your designer know what flower styles you like and why as well as the color scheme you are hoping for, allows us to give you many other options that work for the time of year of your wedding as well as your budget. There are so many options available to us that we may come up with some ideas that you may love even more than your original plan. 2. 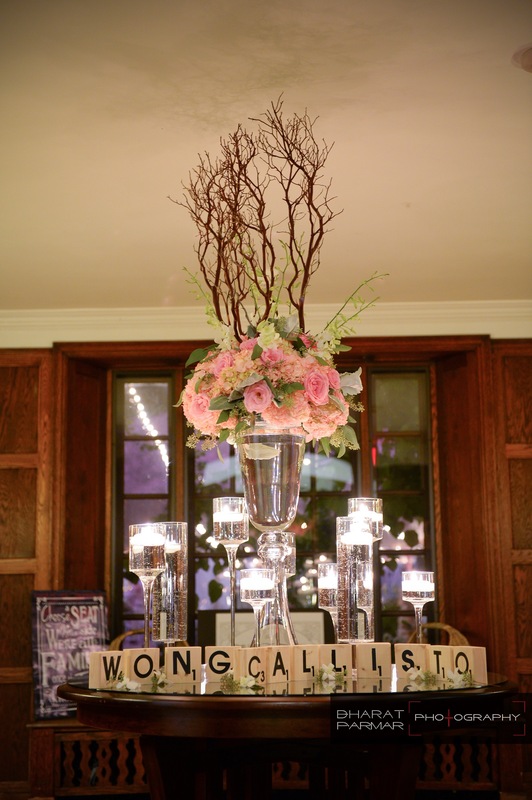 Incorporate something special into your wedding flowers. 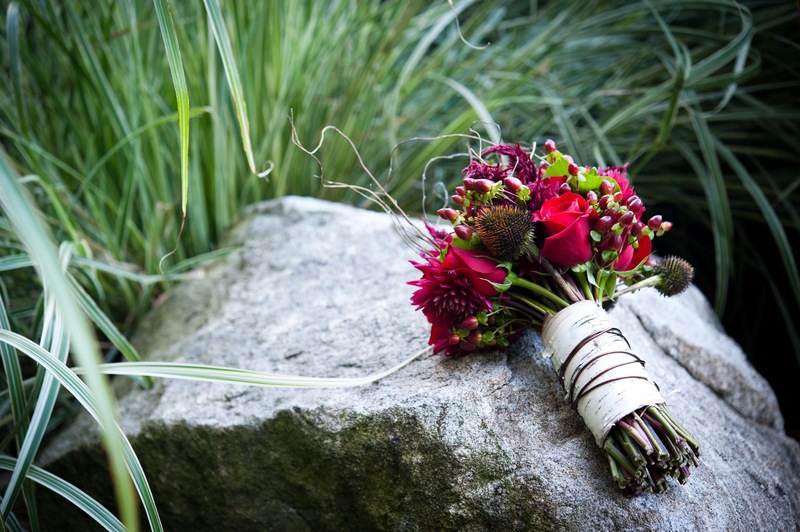 Wrap your bouquet with a loved one’s handkerchief, include snippets from your mom’s wedding dress, or perhaps you and your fiancé have something that is special to you-find a way to reflect that in your flowers. 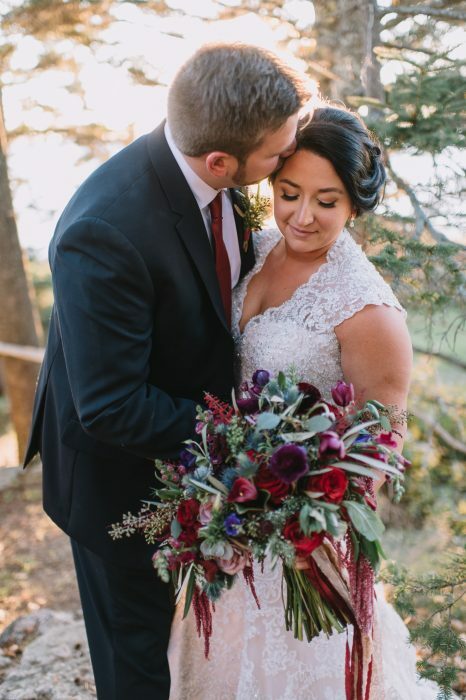 For example, we had a couple that met on a train, so we tied a small train charm onto her bouquet to symbolize where they had met and fell in love. 3. Flower colors are never exact. 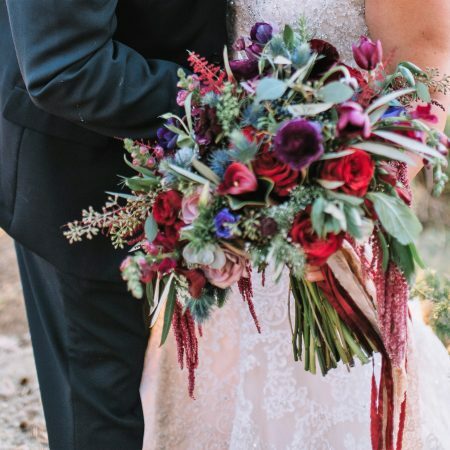 Rely on us to help you understand the undertones of different varieties; for example, red ranunculus has orange undertones that stand out when paired with cool colors. Also, remember that many of the photographs you see online or in magazines can be misleading; when the photographer is color-correcting for skin tone and lighting, it may adjust flower colors beyond what is realistic. 4. 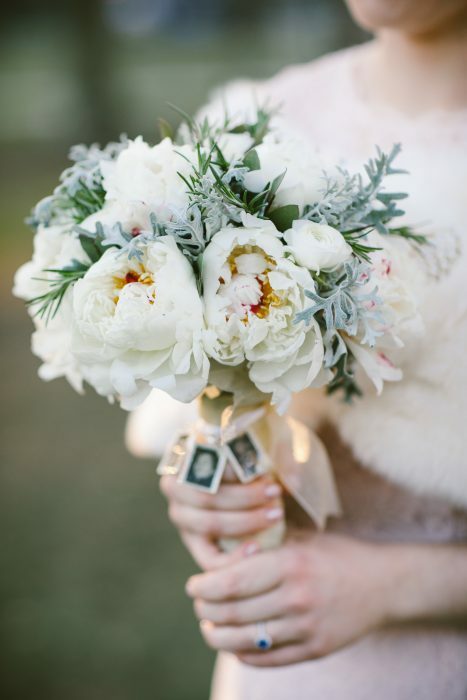 Don’t skimp on your bridal bouquet. 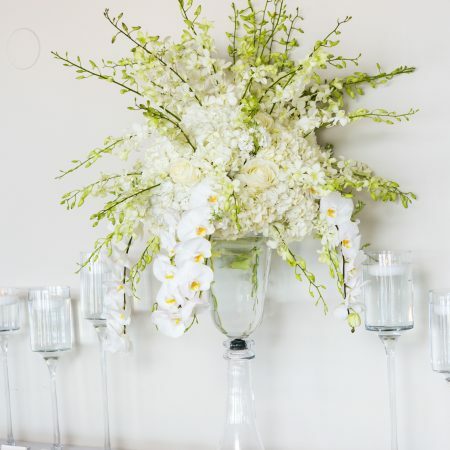 It is the one floral design that will be on your mantel, your bedside table, your mother’s house, your in-laws’ house and on your desk at work, in photographs for the next 50 to 60 years — you had better love this piece. 5. Be open to the creative process during this first meeting. 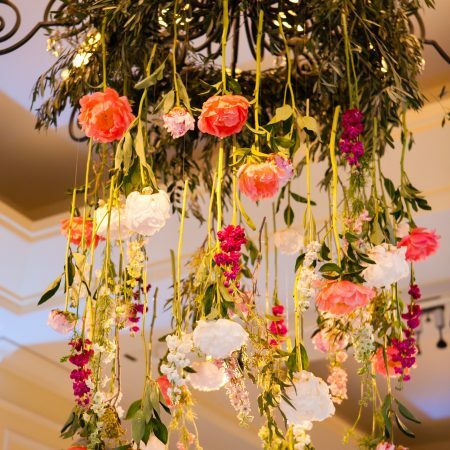 Your initial floral design consultation is about having fun, seeing if you connect and the creative process. 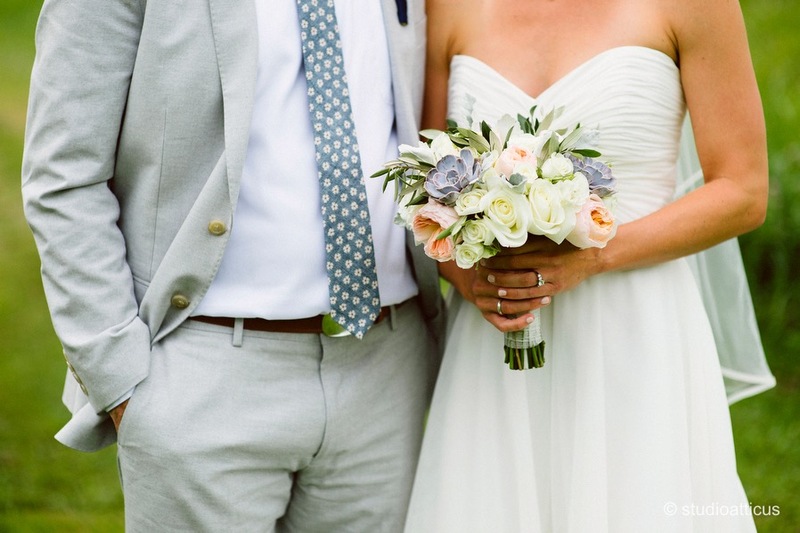 The connection we have with our brides & grooms is so important-and you need to feel it too. You are entrusting your vision of one of the most important days of your lives to this person, you want to be sure that they really “get it!”. The most difficult and least productive consultations are the ones where no price-line is given. You wouldn’t go to buy a car without telling the salesman in advance if you are in the market for a Lexus, Volvo or a Focus, would you? We request that a price-line be provided at our very first consultation. This allows us to guide our couples in a direction where we will be successful in creating their vision while staying within their budget. 7. Pick one thing you love. 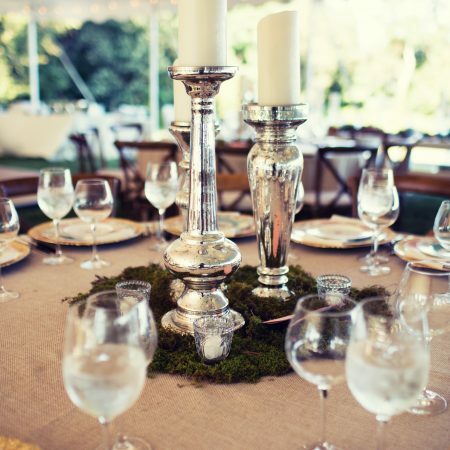 We expect that our couples will come to this first meeting with tons of pins on their Pinterest page, tear sheets from their favorite wedding magazines, and fabric swatches for bridesmaid dresses and linen for their table…but, if you can narrow it down to the one or two pieces that you really love, it gives us a really strong starting point of what you really want. 8. Don’t limit yourself to a certain style. 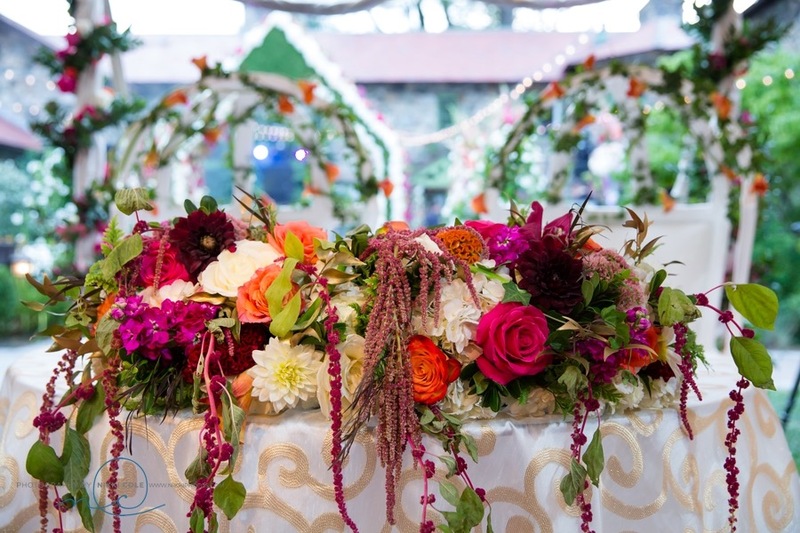 If you aren’t planning a traditional wedding, your flowers don’t have to be traditional. 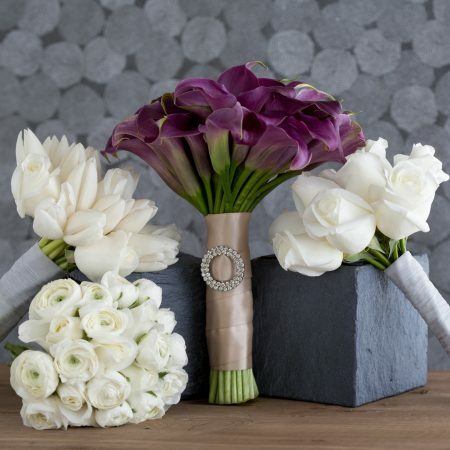 No need to limit yourself to roses and calla lilies. I personally love succulents and work with them whenever possible. 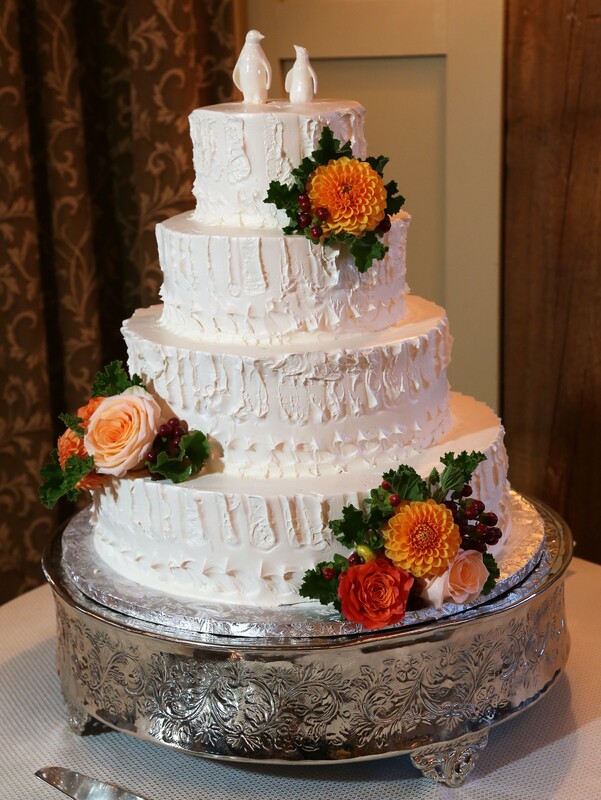 I also pull in fruits & vegetables such as pomegranates, kale, apples — whatever speaks to the wedding and the bride’s vision. 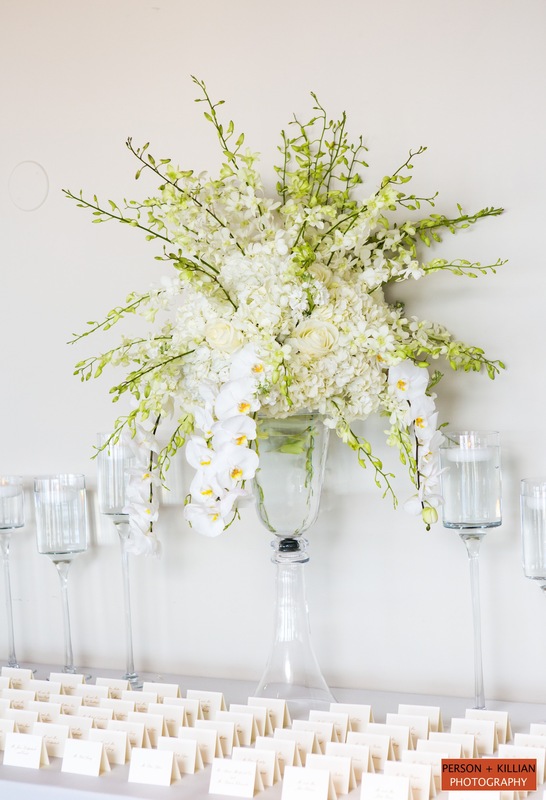 You also don’t have to limit your containers to clear glass vases — if it will hold water it can hold your flowers. 9. 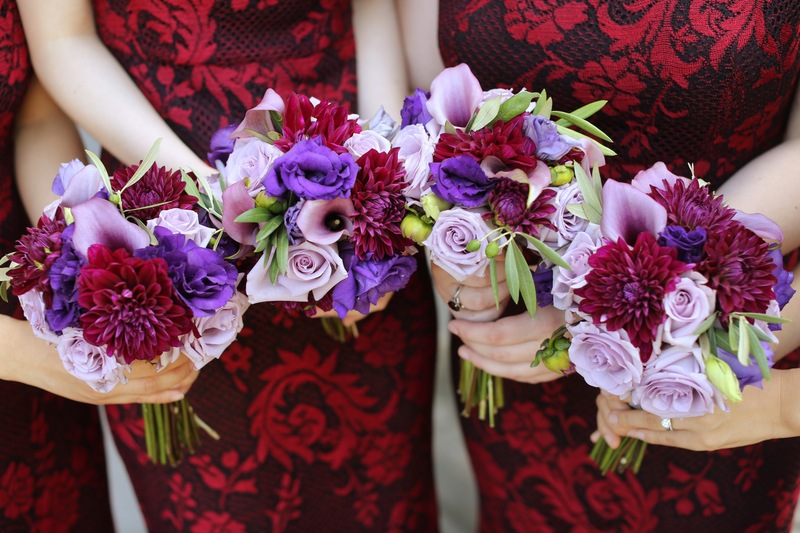 Start a list of the florals you will need. 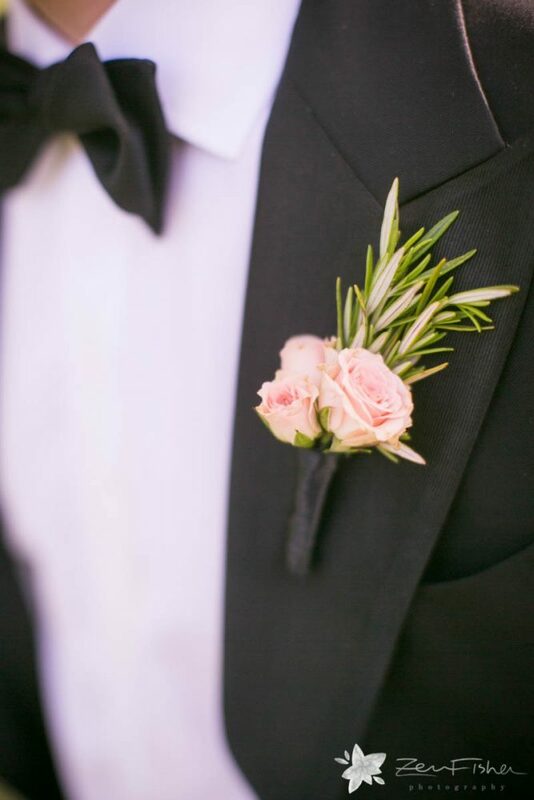 Having a list available of the number of bouquets, boutonnieres, corsages as well as info on and/or sketches of the ceremony & reception spaces is extremely helpful to have for this first meeting. 10. Have a list of questions for us. We are here for you…we want to help guide you through this incredible process. 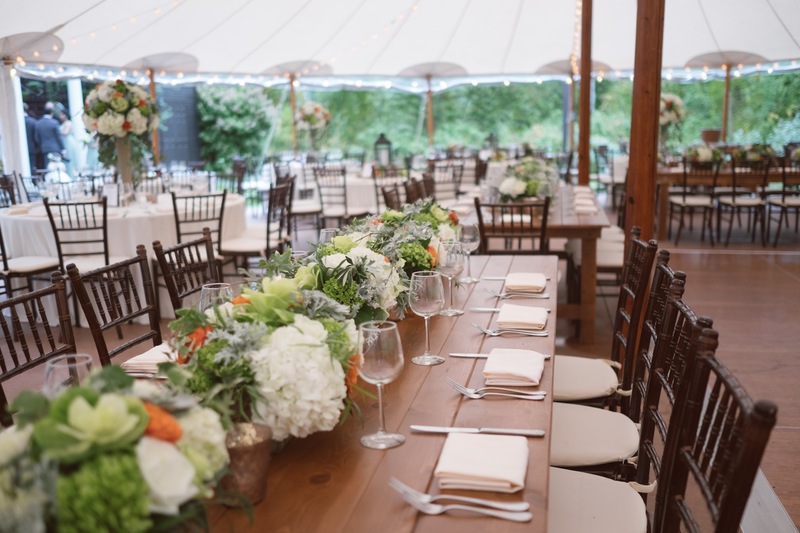 We are happy to share our experience, lend some advice, as well as provide you with a list of trusted vendors for your other wedding planning needs that we think may be a good fit for your event.